Here is my Piece De Resistance! I'm very interested in your feedback on the route to see if there are any ideas to improve upon it or where I really screwed up and put myself into harms way naively if that's the case too. I originally was going to do this with 2 other people but their plans both fell through due to various reasons. I do admit, I had a little "summit fever" as I really wanted to get this done this year and knew that the weekend I did it was likely my last chance. So, having said that, do as I say and not as I do...I'd recommend not going solo. Anyway...take a look...enjoy the pictures and story. I'm very much looking forward to your feedback. Thanks to several of you on this site who've provided advice during the creation of this route. I'm looking forward to questions, comments and suggestions! Verizon Cell Service: LTE in most places except dropping down to Ramona Falls, Newton, Clark and White Rivers. Pretty steep, but consolidated. Would be higher if snow was still present. 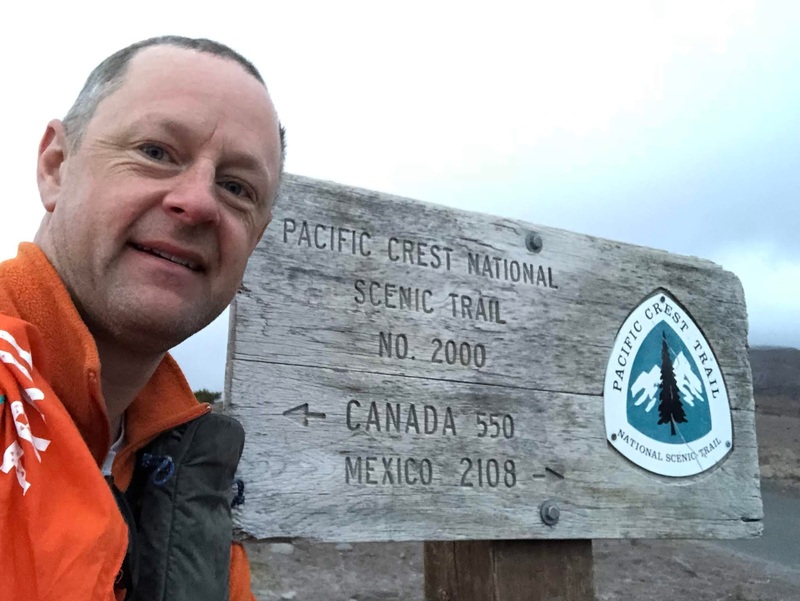 I’ve been planning this hike for years…the day is finally here, although my hopes aren’t high, due to the weather forecast. I didn’t want to do this hike solo, due to the uncertainties and somewhat elevated risk of being off-trail on potentially unstable rock at times. I was lined up to go with a friend or two, but that fell by the wayside as the weather degraded. It was just too much to ask someone to commit to a hike that I figured I’d have about 5% chance of completing…and that’s rounding up to the nearest 5%! 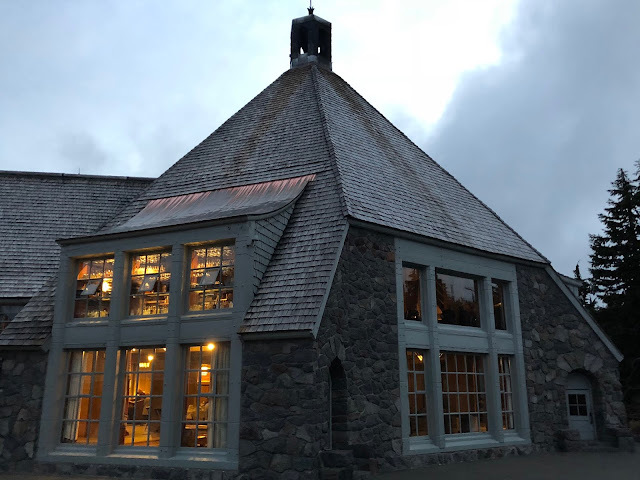 I already had scheduled my time off of work, and I always like to have a backup plan in place to minimize the sting of not being able to do what was originally planned, so I took my laptop and figured I’d sit in front of the Timberline Lodge fireplace sipping fresh coffee and getting caught up on my blogging and just enjoy a nice and relaxing day at one of the coolest places around. My hope lifted a bit as I drove toward the mountain with the sun coming up. What had been socked-in the last couple of days actually might have some promise! I could actually see the whole mountain...from miles away! 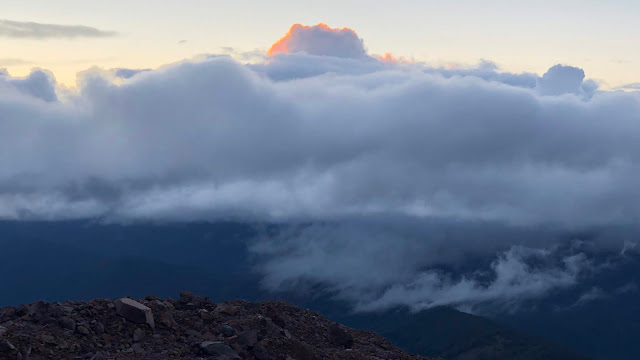 I normally start my hikes at dawn, and would have done so today too, but even I put too much faith in the forecast, thinking that it was such a high likelihood that I wouldn’t even start. 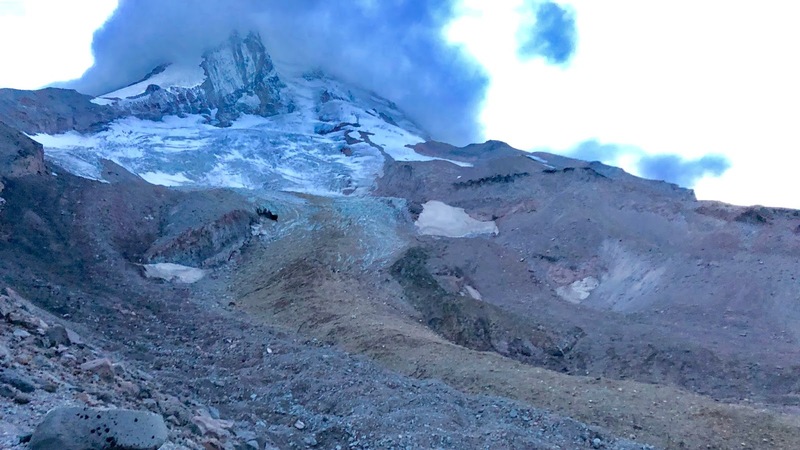 I quickly got prepared and was on my way to start the GoalTech Mt Hood High Route! I hooked into the trail at the back-end of the overnight parking lot and started up the “climber’s route”. Here’s my first look back. It was a chilly 45 degrees, but with the sun out it felt great. 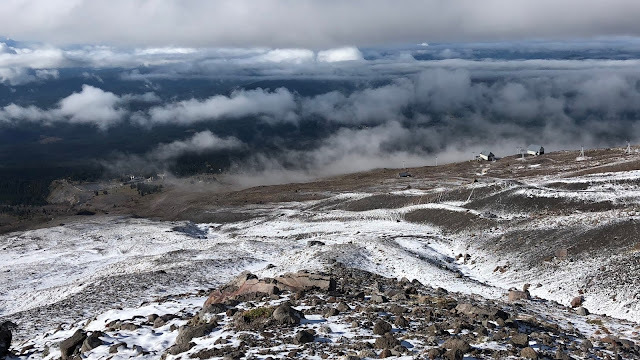 I ran into my first dusting of snow at 6,500’ and the clouds were starting to collect just a bit at the summit. 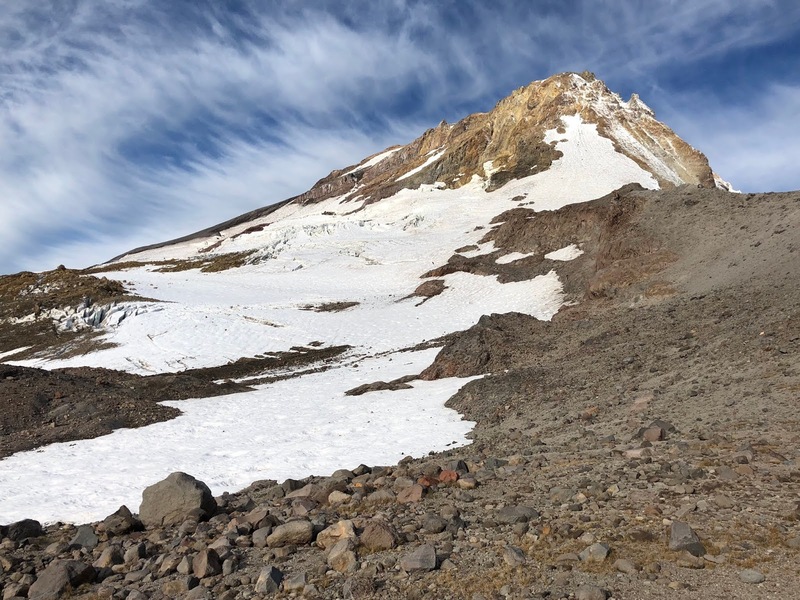 That's the Coalman Glacier (11th largest/20 acres) up there above Crater Rock there in the middle of the caldera of Mt Hood. 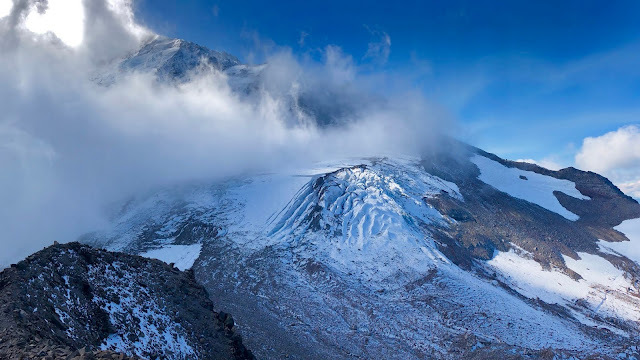 The famous Hogsback is a drifting of snow that connects from the backside of Crater Rock up through the Pearly Gates to the summit of Mt Hood. It wasn’t long before I was walking on mostly snow, which was simple and actually quite pretty. Here are my tracks looking back. Speaking of tracks…what do you suppose this is? Fox? 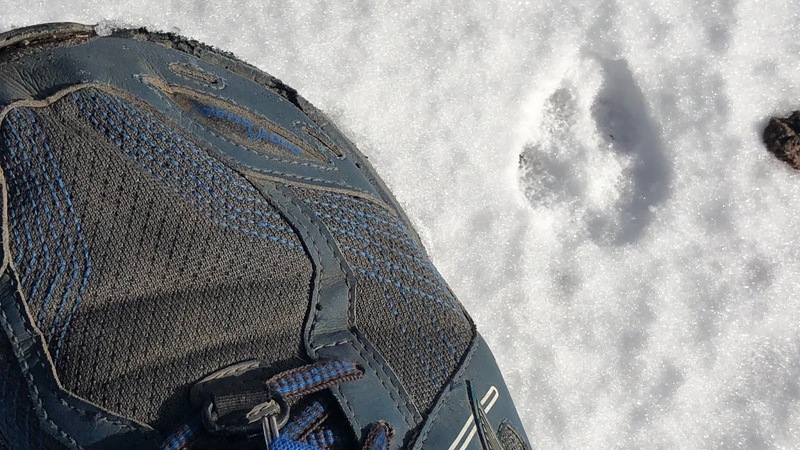 Coyote? Other? 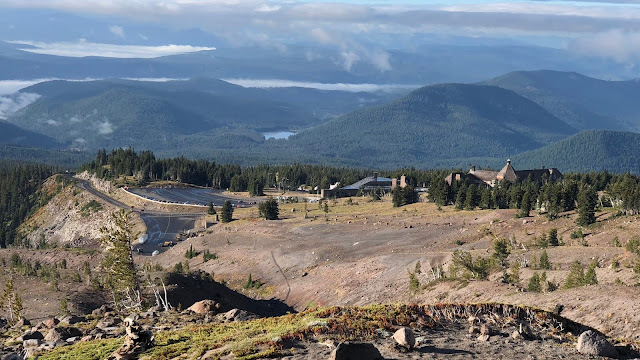 Here you can see down to Timberline Lodge along with the Silcox Hut and the transition from the top of the Magic Mile to the Palmer chair. This is looking across the White River Glacier that I’ll be hopefully crossing from the other side in a few days. Here are the upper crevasses of the White River Glacier that I will be skirting below when I cross it. The climber’s route was a great path up as it has a faint use-trail most of the way and provides nice views on both sides since it hugs the White River Glacier to the right as you climb. 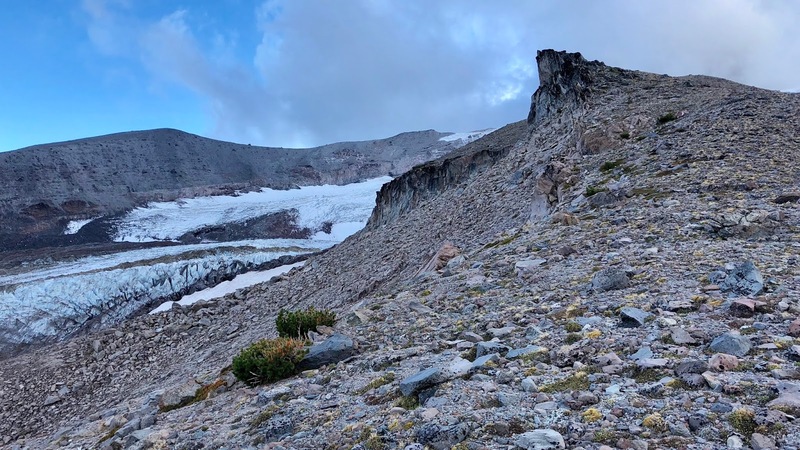 Surprisingly, it’s easy to miss the cutover point to the top of Palmer, on the Palmer Glacier (8th largest/~102 acres) as it is just out of sight and not obvious where to turn, since the climber’s route is mostly used for continuing on to the summit. I actually had to check my GPS and map to determine the right spot to cutover. 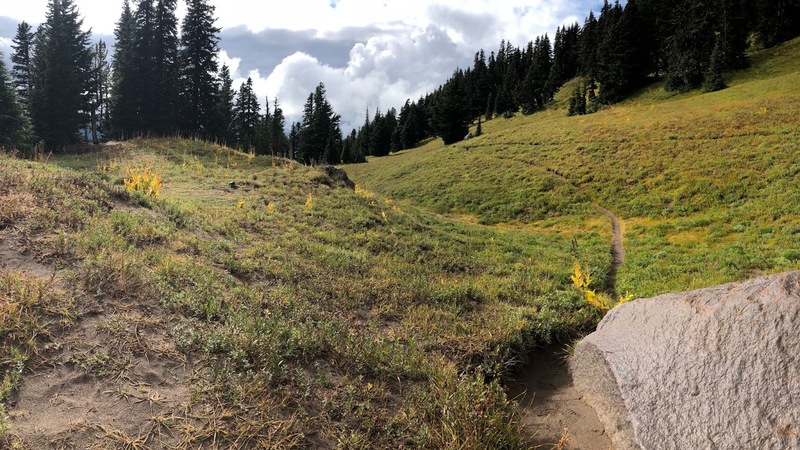 It wasn’t long until I connected with the wide pathway that is used during the ski season for the racers to drop down into the race lanes from the top of the chair. I’ve never been up here this late in the season, and it’s amazing how rugged it is without the snow. 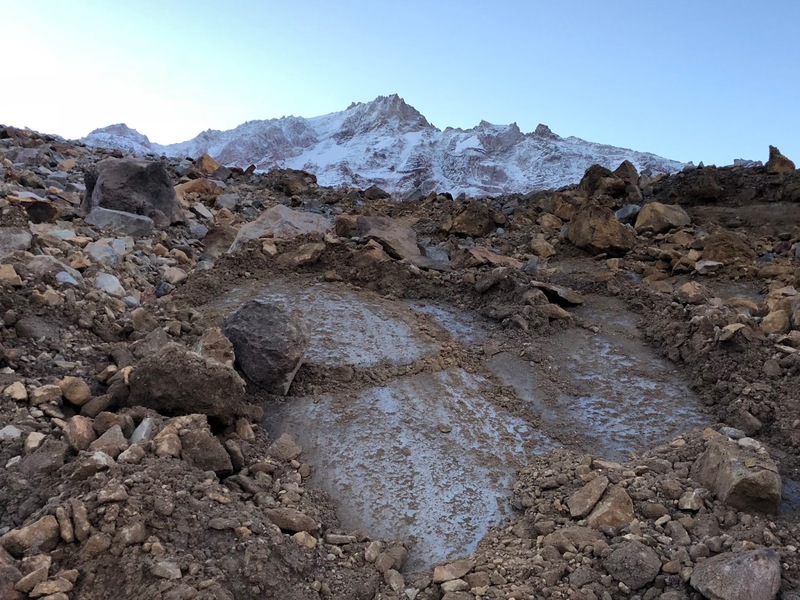 There is no way to access the glacier to ski except maybe right next to the chair lift. I got to the top of Palmer (8,500’) and the end of this segment by 10:00 at 1.3 mph pace. The fog was rolling in and the visibility dropping. It wasn’t a white-out, but it was a chilly 35 degrees and breezy. I was thinking the wind might get worse as I worked my way west as that was the direction that the wind was coming from. 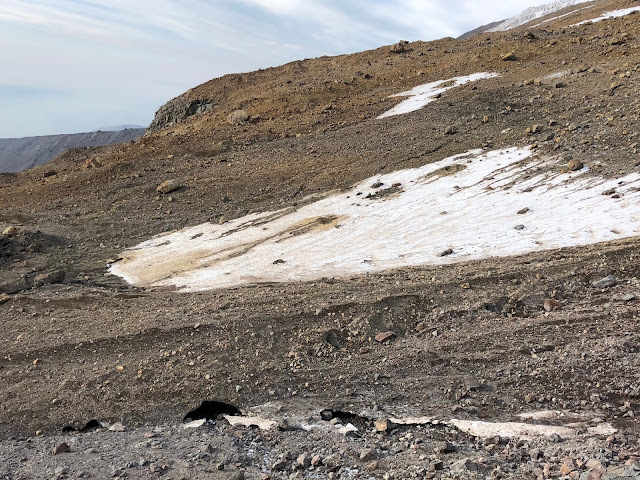 I used to race at summer ski camps up here in high school, so it was neat to see it empty and rugged at this time of the year…very different! I picked my way across the snowy rock field. There was about 2” of fresh snow at the most, and it was in small, granular pellets. This is looking back at the top of Palmer. This is the most of the snow in the foggy rock fields above Mississippi Head. Here is a video clip to get a better feel for the experience. As you can hear in the video, it was surprisingly dead-calm, so it was actually a pretty comfortable experience. 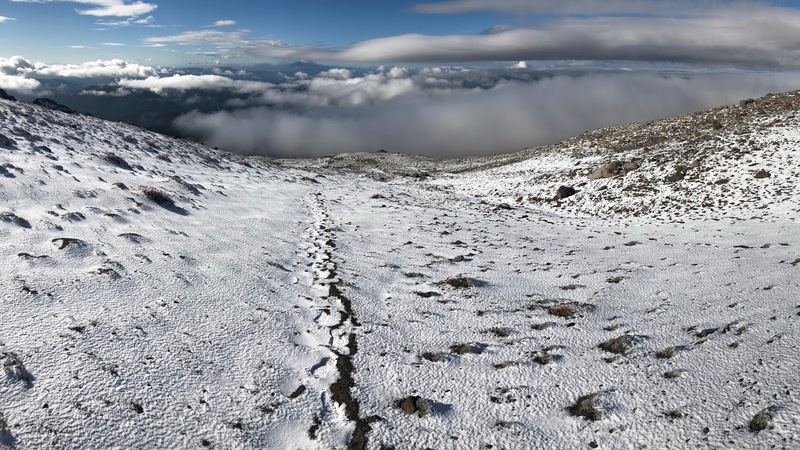 2018-09-13 1HR1 Snow Field from Michael Irving on Vimeo. I made my way over Zigzag Glacier (5th largest/190 acres), as I dropped down to the Reid Glacier (7th largest/126 acres). 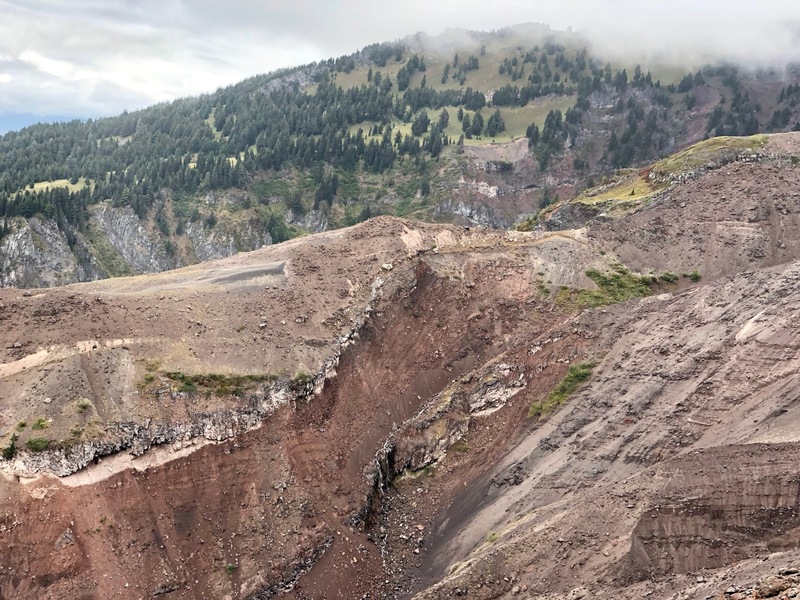 You have to be a bit careful with this as the area before the Reid Glacier proper starts to degrade and turn into the Paradise Branch, which is its own canyon. When I explored this last year, I went up high all the way to Reid, below Illumination Rock. It was borderline sketchy on the steeper snow chutes and there was no apparent way to get across, so I don’t recommend it. Just make sure, as you descend, that you don’t inadvertently start down the top of the Paradise Branch as that will involve backtracking due to the steep and unconsolidated walls of the canyon making it basically impossible to get out through them. It would be an interesting side-trip to go more out of the way up to Illumiation Rock to tag it, or even further to go up the climber’s route to the Hogsback and up and around Crater Rock to tag the Coalman Glacier, but I think coming through between Crater Rock and Reid Glacier would be maybe too exposed. 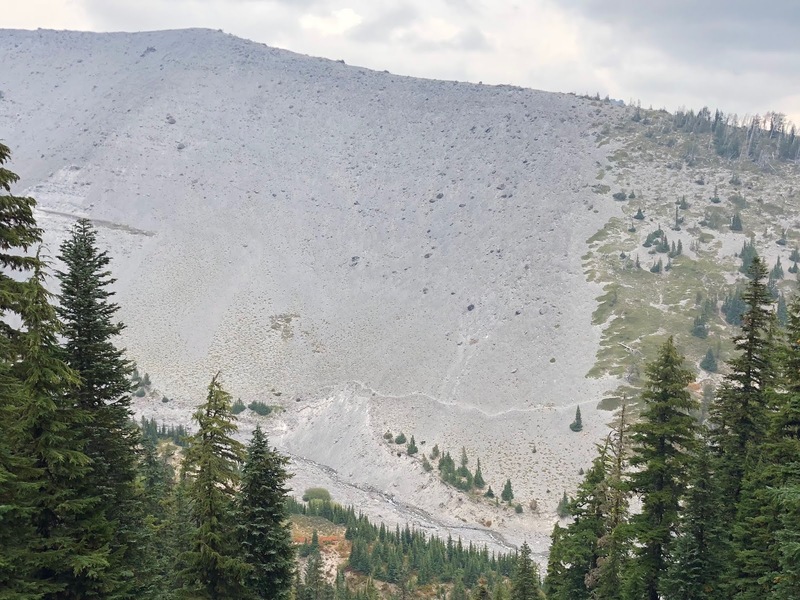 There seems to be a lot of rockfall that comes down the slopes in that area as a natural collection point from the upper slopes of the mountain. I’d be interested in other opinions on that. Another optional side trip is to go out to the point of Mississippi Head. I did that on my scouting hike last summer and got to see the B-26 plane crash site from 1949. The big propeller is the most interesting piece up there. Right at Mississippi Head is where the use-trail starts to come into view as it hugs the edge of the Paradise Branch canyon. Crossing over the top is pretty easy on consolidated rocks of various sizes. Dropping down is pretty easy too, particularly once below Mississippi as it’s almost a soft trail most of the time. I exited the snow and the fog layer to be able to see down into the Paradise Branch/Reid Glacier area. This canyon is just too rugged and steep to cross to be in the scope and spirit of this hike. I’d be very interested if anyone has any acceptable paths they are aware of to get across it. I should have “knocked on wood” when I was thinking about the visibility and views improving as it started to snow on me. I pulled out my Gossamer Gear Liteflex Chrome trekking umbrella which was just the ticket to keep dry and stay cool without having to put on a waterproof layer. 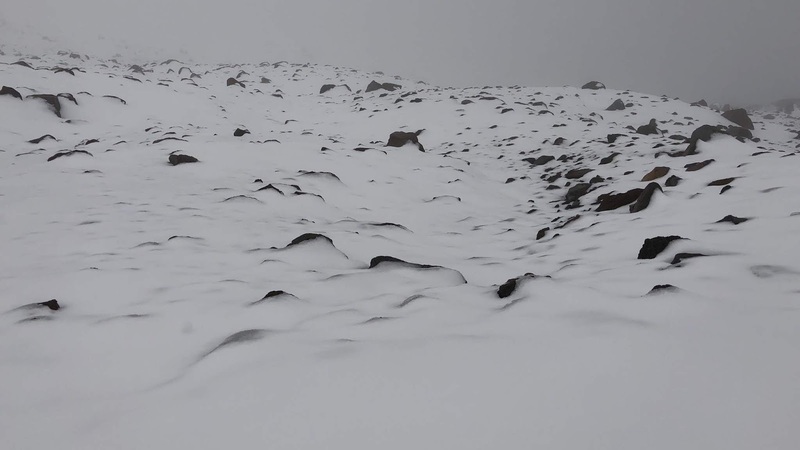 Here’s a video clip of the snow starting to fall. 2018-09-13 1HR2 Snowing from Michael Irving on Vimeo. The snowing didn’t last long and the skies started to brighten as the landscape began to transition from barren wasteland to meadows. 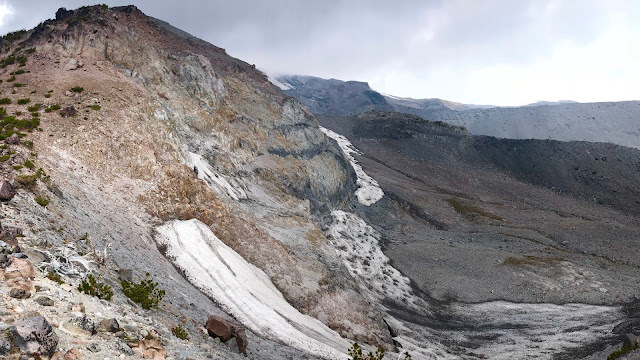 This is looking across Reid Glacier to Yocum Ridge, where I hope to be later today. 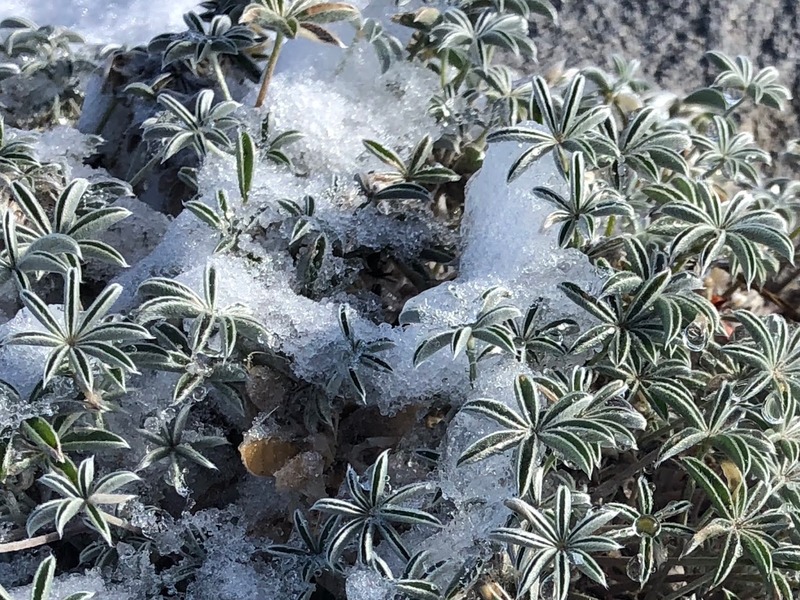 The snow/rain was making for some pretty pictures too as I was getting back to the land of living plants. 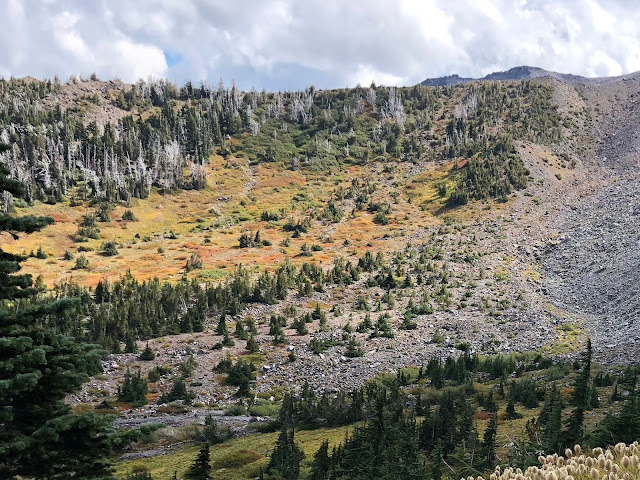 Just before reconnecting with the Paradise Park Trail, that branches above the Timberline Trail, there are some shrubs that have to be bushwhacked through. I was very happy with my GPS track as this was minimized and not a big deal at all. At 11:40am, and at a total average pace of 1.3 mph, I met back up with the Paradise Park Trail. It felt good to be back on a trail. I was very happy with my GPS track on this segment and wouldn’t change a thing. 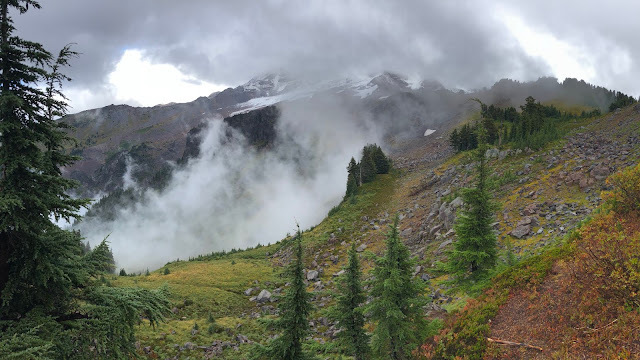 It was cloudy today, but normally, being able to see Mississippi Head, the Reid Glacier and the upper portions of Paradise Park are quite beautiful. 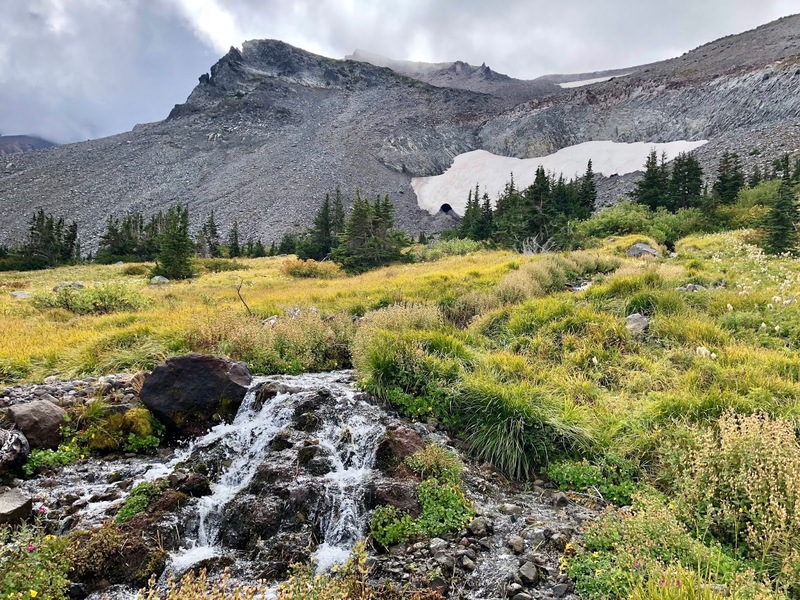 I easily made it down the Paradise Park Trail back to the Timberline Trail in about 10 minutes. I’m not gunna lie…I was not starting to think about the cougar that was going to attack me after the first death reported in the state had occurred the week prior just across Highway 26. I wasn’t really worried about it…but it did cross my mind! 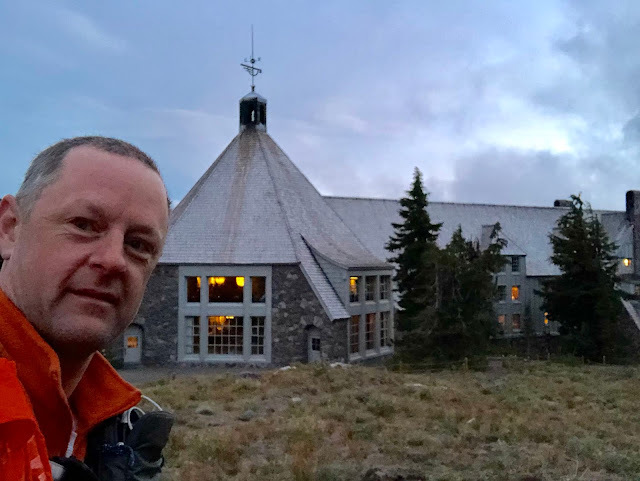 It was also interesting to realize that I had actually taken a shortcut here from Timberline Lodge as I had travelled 5.1 miles to get to this point, whereas it was a mile longer back to Timberline via the Timberline Trail. I guess that’s what switchbacks will do for you. 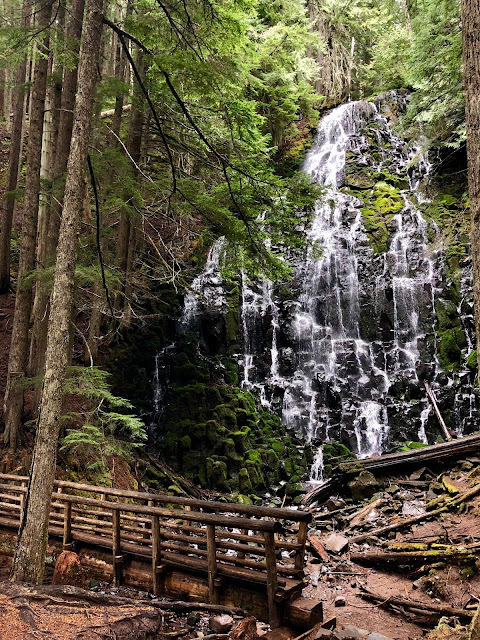 I was really cruising down the trail now and got the traditional pictures from the trail up the Paradise Branch to Paradise Branch Falls. 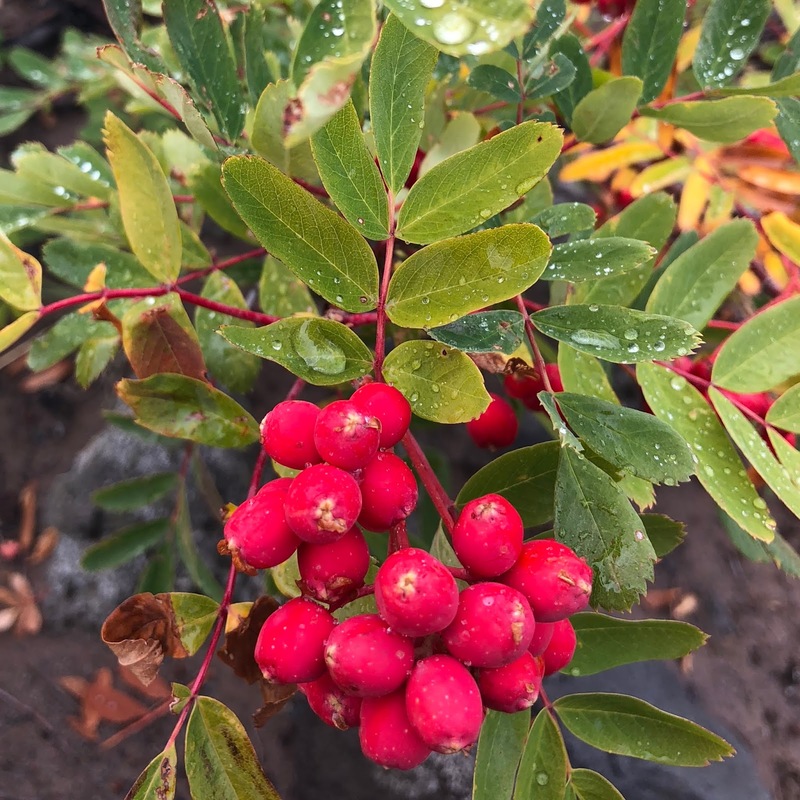 There were still huckleberries to be had, but fall is coming! 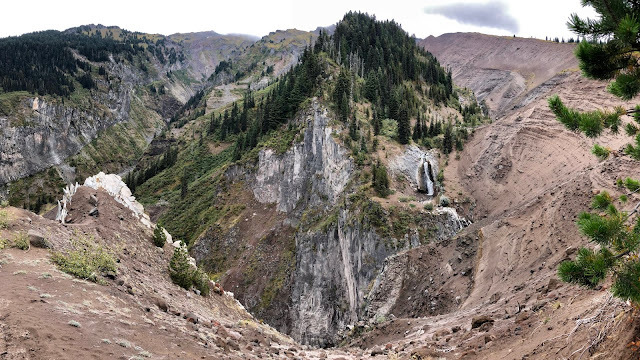 This is one of my favorite views on the trail where the Paradise Branch comes together with the Reid Glacier canyon. I hiked down along the right side of this picture from above. Being that the wet season is coming, I saw a lot of new mushrooms cropping up with this (Fly Agaric?) being one. and some False Salomon’s Seal?? As I was cruising down the trail, I kept hearing hiker voices behind me. I kept going though. Eventually they caught me. Of course they were speedy thru-hikers looking to get to Canada before the snow. I hiked with the two of them down to the Sandy River, visiting with them. I asked if they were crossing their fingers to get to Canada, (as they are a little late in the season). They replied that they WILL get to Canada, no doubt about it! I liked the confidence. It’ll be nice for them not to have to deal with any fire detours either. We all crossed over the Sandy River with no problems on a make-shift bridge of random fallen trees laid over the river here near the headwaters. We motored on up to near Ramona Falls where they were going to take a break and wait for their friends to make sure everyone took the correct turn to see Ramona Falls on the PCT alternate trail. I wasn’t thinking I’d run into any thru-hikers on this hike, so I didn’t plan for any trail magic. I couldn’t let the opportunity pass, so I gave each of them a choice of something in my food bag. Each pair chose a Snickers bar to share. One commented how nice it was to eat a Snickers bar that hadn’t already melted at least once! The group consisted of Peachman from Northern California and Rocket from Australia, (who I had been hiking with), and Freewheel from California and Merman from Ireland. After visiting for a few minutes, I moved on to Ramona Falls. I got to Ramona Falls at the 9.1-mile mark at 1:40pm and at 1.6 mph pace. It was time for lunch! I had my specialty of a foil tuna packet packed in oil with 2 packets of mayonnaise and 26-month-aged Gouda cheese on a tortilla…good stuff! After collecting water and getting ready to go, I met Starburst (bright pastel clothes) from Seattle. She took my Honey Stinger waffle for her trail magic. Here is a video of the Ramona Falls area, it really is a beautiful area. 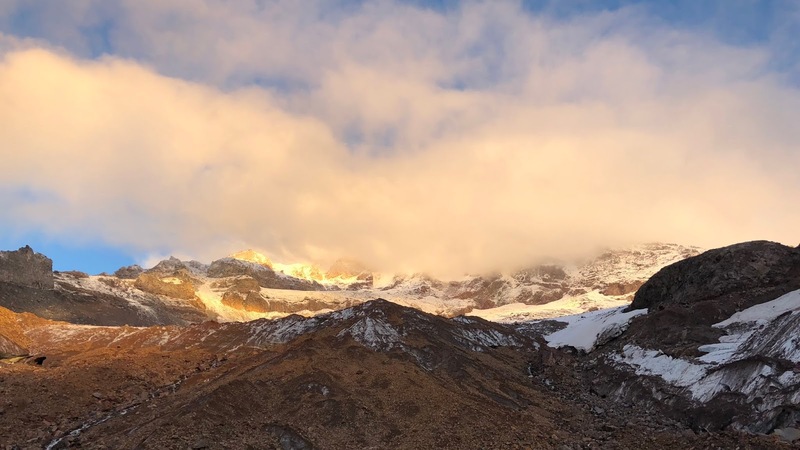 It was 50 degrees here, the warmest of the day, which is to be expected with its low elevation point of 3,600’. 2018-09-13 1HR3 Ramona Falls from Michael Irving on Vimeo. This segment was obviously very easy and predictable. I wouldn’t change a thing in regard to the track. 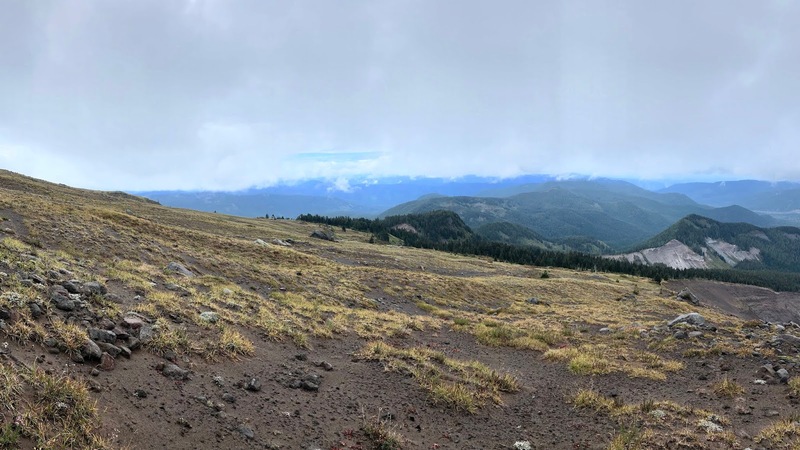 I headed up the Timberline Trail about a mile to the Yocum Ridge Trail and hung a right on that. The pitch of the trail was a “flat-up”, so it was very quick hiking going up this well-maintained trail. 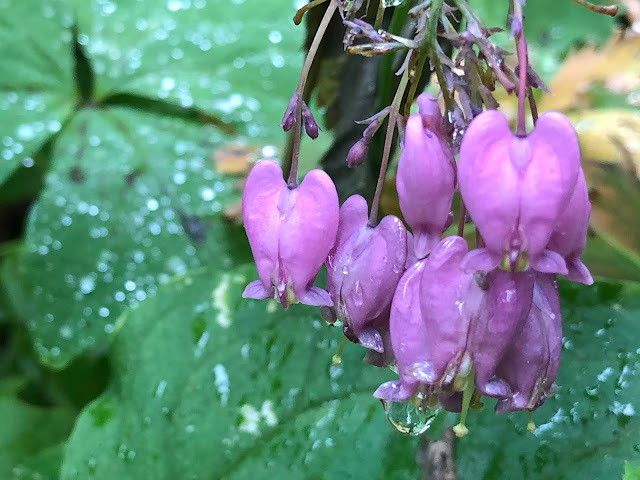 I heard a Pika in some limited talus that I crossed (but couldn’t find it), and also saw some seldom-seen, Western Bleeding Heart. The fungi wasn’t just growing from the ground as I saw this fungal conk on the side of a tree. 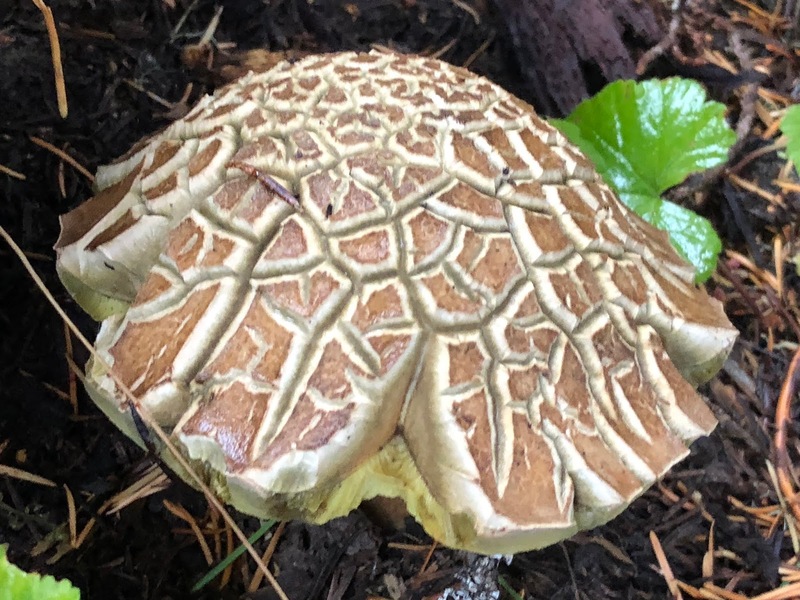 Here’s another mushroom variety of which I don’t know the name…any help? 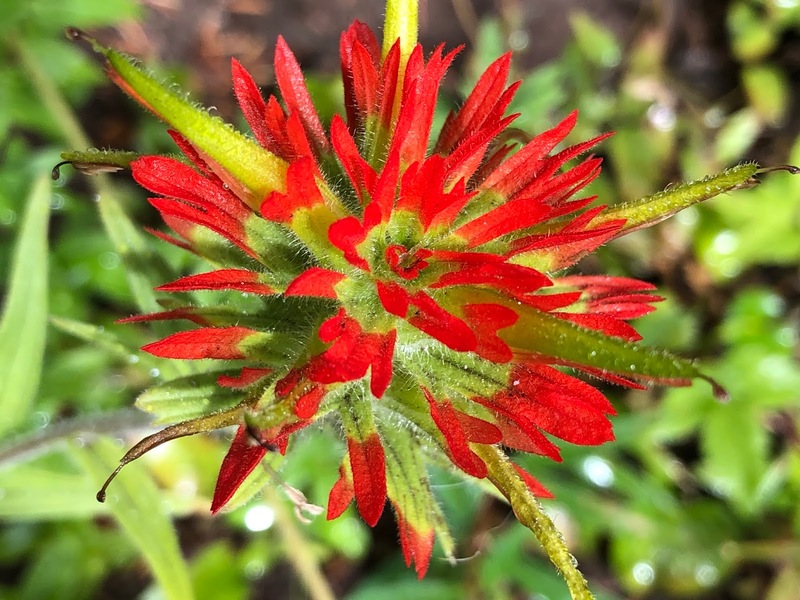 The Paintbrush still is looking good. It started pouring rain as I approached the upper meadows. I pulled out my umbrella which I had slid under my top pack-strap as if it were in a holster. This worked great for my upper body, but with the meadowy terrain and its grasses and lots of growth, my legs and feet (in my trail runners) were getting soaked to the core. I wasn’t really cold as I was pounding up the trail, but it wasn’t the most comfortable part of the day. 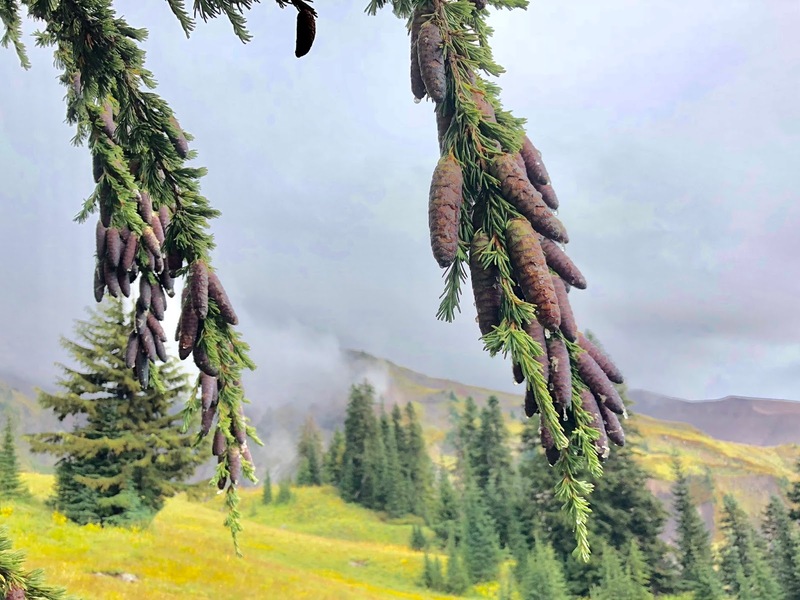 These fir cones were pretty cool looking. 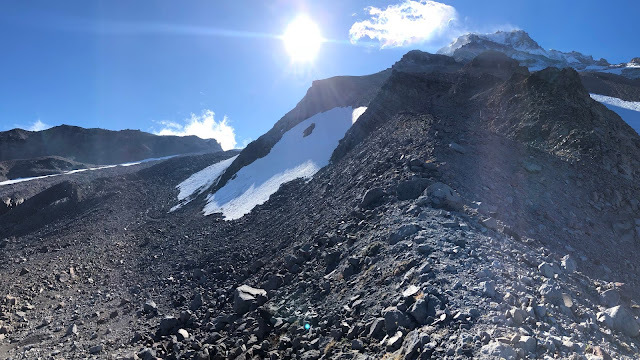 I made it to the edge of the canyon for the Reid Glacier and it was spectacular. On the far upper-right of the picture you can see the desolate ridge that I had come down earlier in the morning. This will give you a good appreciation why I dropped down to cross this sucker. Here is a video tour off the edge. 2018-09-13 1HR4 Reid Glacier from Michael Irving on Vimeo. 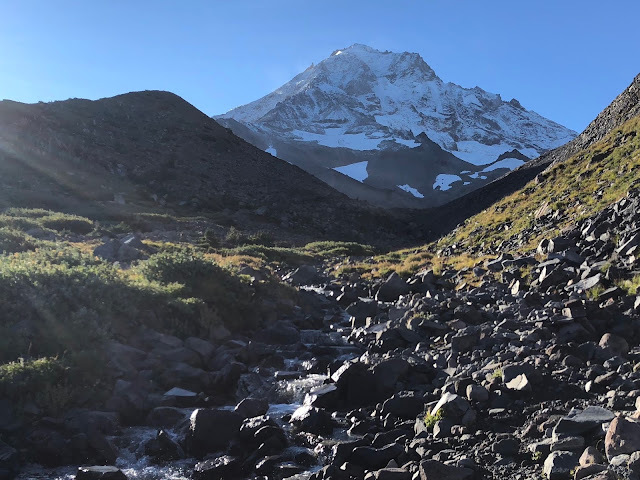 I backed away from the edge, crossed the meadows, and started on the trail for the crest, to cross over to the Sandy Glacier side of the mountain and a new view. Within about a mile, at 4:30, I came to my new view, the Sandy Glacier (4th largest/237 acres). 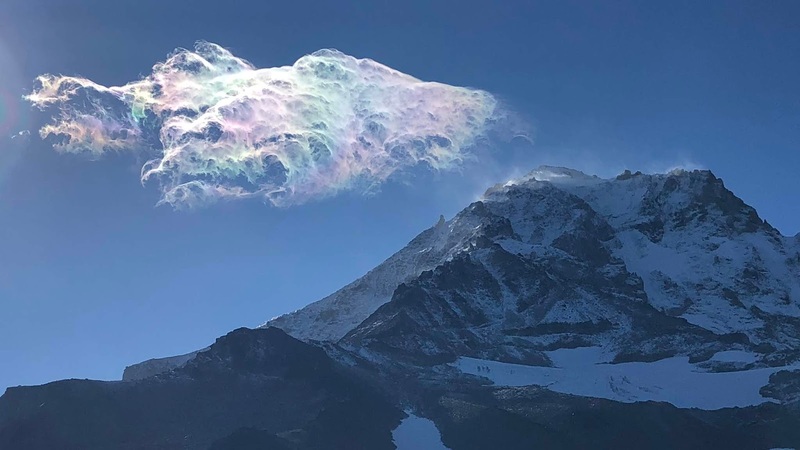 The clouds blowing through made for a striking view. 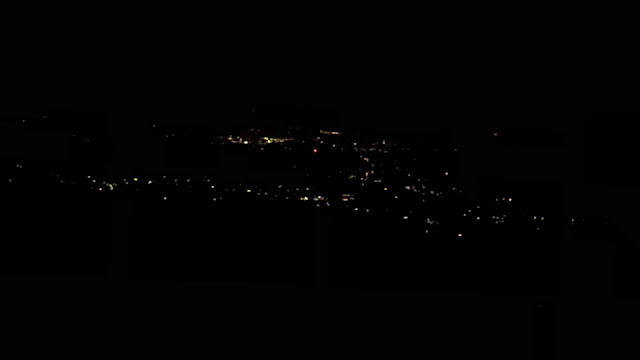 Here is a video clip panorama of my new view. 2018-09-13 1HR5 Sandy Glacier from Michael Irving on Vimeo. 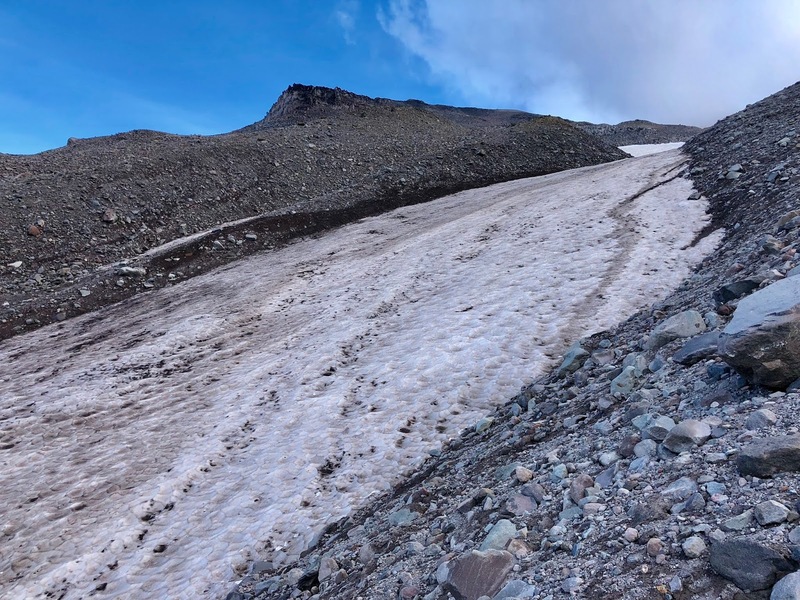 I saw my first Monkey Flower in here and a Ptarmigan (which always scare the crap out of me when they suddenly burst into flight with all the noise they make) right about when I got to the junction of the use-path that drops down onto the Sandy Glacier. I got here at 4:45pm and was 14.7 miles in on my hike for the day at an average pace of 1.7 mph. This was another very straight-forward segment, all on-trail. I was pleased with my path and wouldn’t change a thing. I easily took the pathway down onto the base of the Sandy Glacier, this is a super easy entry that is almost a trail. The trail goes away quickly though. There is also a good, small creek down here for water as there is no water up on the ridge. Then it was time to head up and over the top of the big falls and cliffs to get to the other side. This is a reasonably steep hike up. It’s generally quite consolidated, so the majority of the rocks are stable (YMMV). There is not “one way” to get up through here, but having said that, I liked my track and would generally recommend following it. After getting up on top of the first part, you’ll be about a 1/3 of the way across. There are some possible flat and relatively smooth camping spots in this area. Here is a shot looking up into the glacier. Continue on over, again, the track doesn’t have to be precise. I had no snow in this area, but when I scouted it earlier in the summer a couple years ago, there were some snow crossings where traction would be helpful. 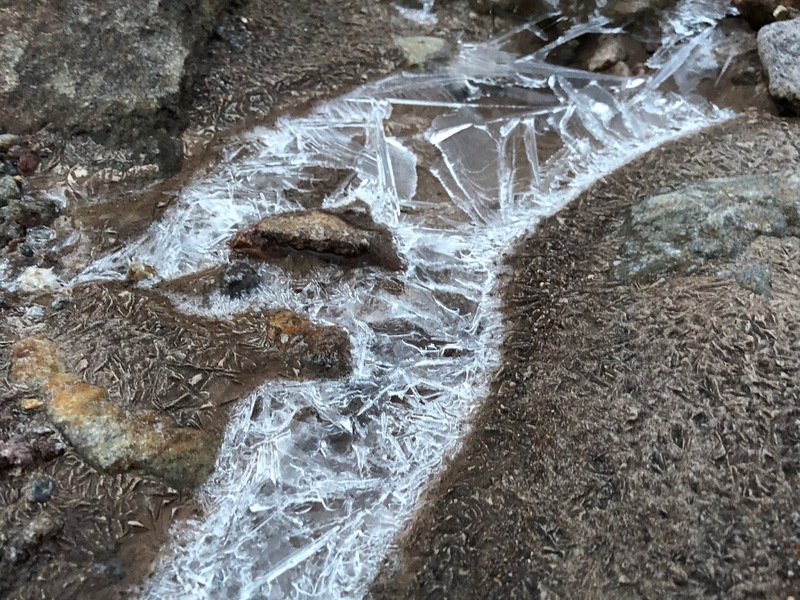 I crossed some small braided streams of water with a hop and kept traversing and dropping gradually in elevation. Right next to the next campsite listed on my track (which is on top of an outcropping and a spectacular view, but maybe not the most comfortable) you drop into the left of the outcropping and down the running creek-bed, which provides stable rocks to step upon. I kind of jumped back and forth along this descending creek depending on which side had exposed rocks to step on instead of a side-hill of scree. This section was pretty short, maybe 50 yards, until it opened up into an easier, flatter area to continue the descent. My feet did not get wet in the creek. This is a pretty good way to come through and the second time I’ve come through this way. I think going around the other way involves steep, unconsolidated walls on each side of the creek. and then hopped over the creek I had been coming down alongside, which was an easy crossing. There are some pretty, small waterfall cascades too. 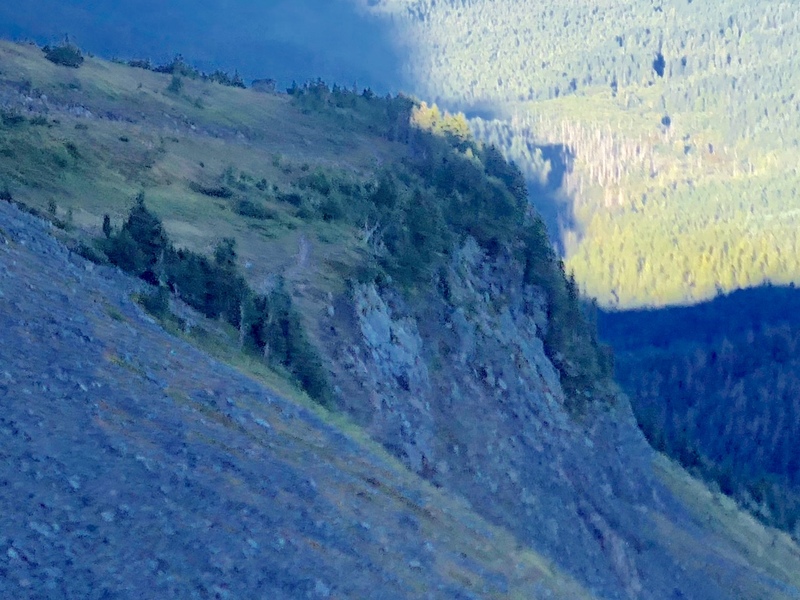 This video clip is looking up to the creek wash I came down and then down over the cliff to the base of the Muddy Fork and Timberline Trail. 2018-09-13 1HR6 Muddy Chute from Michael Irving on Vimeo. The next creek to hop, was the slightly bigger, primary path of the Muddy Fork. This is looking down the Muddy Fork before it cascades off the cliff as a waterfall. You can also see Bald Mountain (4,591’) way down there in the sun too. Here is a video of the running Muddy Fork. 2018-09-13 1HR7 Muddy Fork from Michael Irving on Vimeo. After crossing, I immediately turned up to go up the giant, and kind of steep, rock pile. Most rocks were stable, but it was slow going as it was steep. Not scary steep, but tiring steep. Once I got out and above the first steep part, it leveled off more to a more comfortable pitch. This is another section where there isn’t a single way to go, but again, I liked my track and would repeat the same way if I did it again. As I got up to where I wanted to camp, I was looking for the two solo campsites that I had marked on my scouting trip two years ago. I found the first one, but decided to check the second one up closer to the glacier. They are both on the crest as you go up toward what’s left of the ice caves that were so mesmerizing a few years ago. I got to camp at 6:20pm, 16.2 miles in and at a 1.6mph pace. 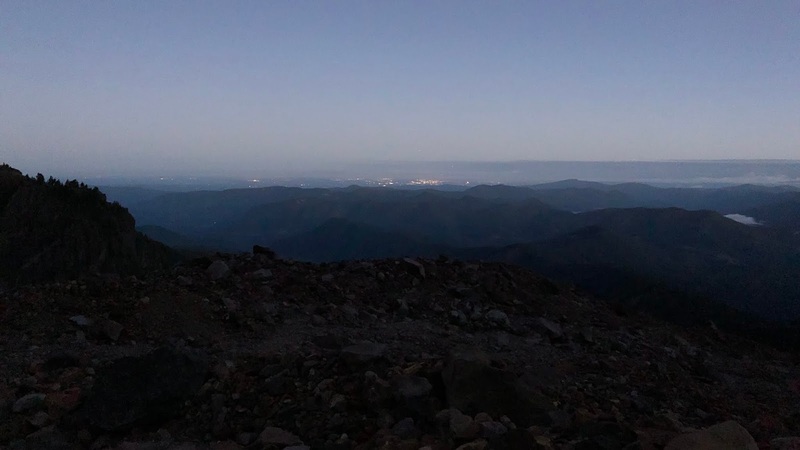 I thought I might be able to get to Cathedral Ridge, but if I did, it would have likely been right at dark, and I wanted some daylight to wind down and to set up camp. 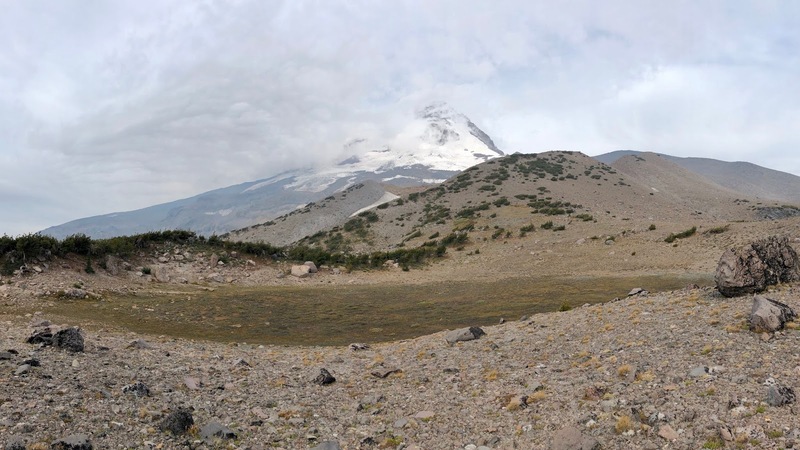 Plus, camping at the base of the Sandy Glacier is pretty cool too! I was right next to one of the creeks for a water supply. 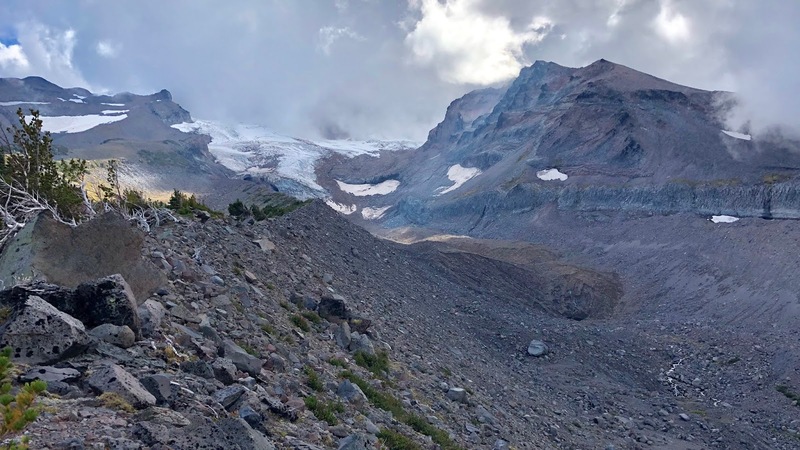 This is looking up the glacier with the remnants of the ice caves up and to the left. Here is a video tour looking around my campsite. 2018-09-13 1HR8 Sandy Camp from Michael Irving on Vimeo. 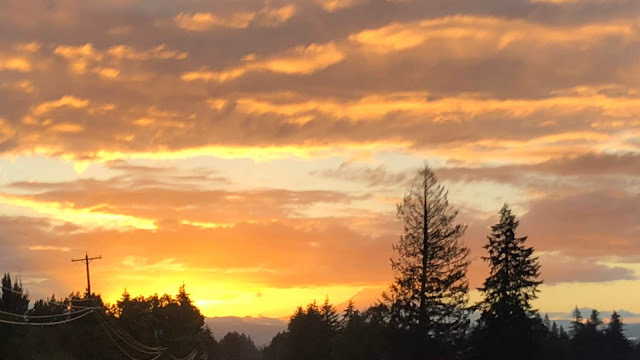 The sunset seemed to be cutting through the clouds, which made for a very pretty evening. and looking down the Muddy Fork, towards Portland. The sunset was dynamic with all the cloud movement. Here is my setup for the night. I promise, my tent was on a flat spot with mostly sand/scree. It was better than it looks. And looking back toward Portland. It was time to climb in bed as it was getting cold! I alternated between wearing my hiking shirt with and without my fleece over it as I hiked today. I don't normally take my fleece on my hikes, particularly my overnight ones, but I really liked hiking with it today as it breathes so darn well. It's great to hike hard in it in the cool, and not have to deal with dripping sweat underneath, like a shell. The breeze was pretty calm, so that wasn’t much of a factor, which was nice. So far, the crossing of the Sandy was very predictable and I wouldn’t change anything on the route. I pretty much matched my scouting trip from two years ago. As I lay in bed, it started to rain just a bit. I was wondering about my odds of being able to continue the hike in the morning…we will see! A fantastic first day. I was absolutely shocked that I was able to start this hike. I was very pleased with my route, which went exactly as planned. It was fun to run into the 5 thru-hikers as I always enjoy spending time with them. Please let me know if you have any questions or suggestions for improvement! That the weather was reasonable! I was shocked! I woke up at 4:50am to start day-2. I figured it was a good sign that I couldn’t hear any rain, it wasn’t windy, and there was no water flowing through my tent! I packed-up and got dressed in my tent and peeked out to the day. 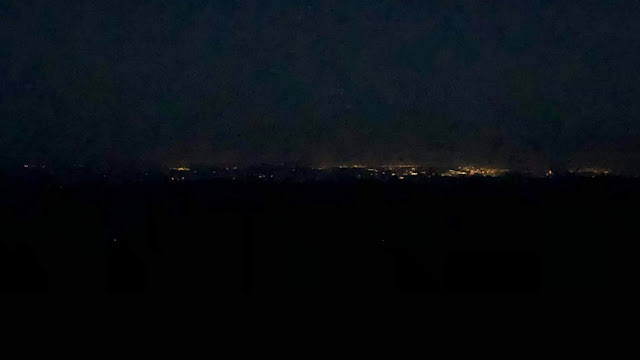 I was pretty excited that I could see the lights of Portland to the west. 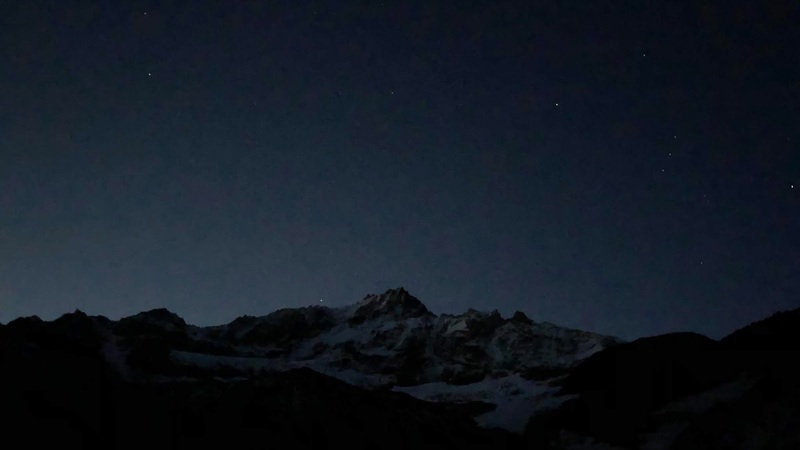 And I was even more excited that I could see the summit and the night constellations drifting away in the morning light. Can you see the constellation Orion (The Hunter) in the upper right? The 3 stars in the middle are his belt. Then there are the four stars in the corners around the belt. The star in the upper left is Betelgeuse. It’s so big, that if you put its center at the center of our sun, the earth would be inside of its surface. That piece of trivia has always blown my mind. Morning was coming quickly and the views didn’t disappoint. 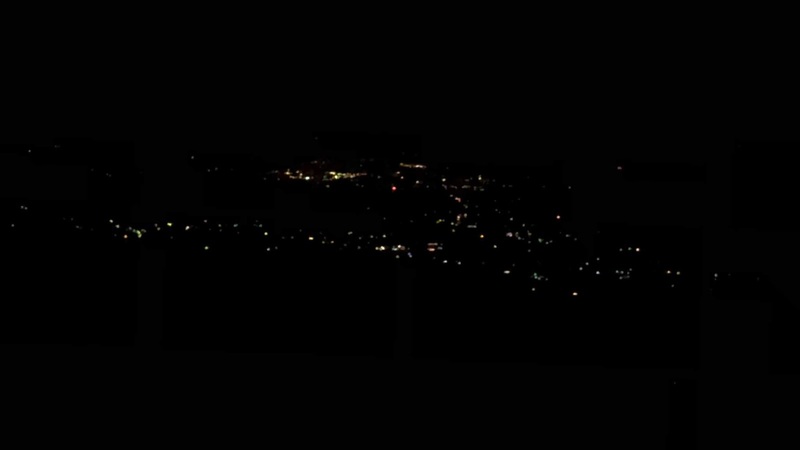 Here’s another view to Portland with a little more light. And a video clip of my camp at departure in the morning light. 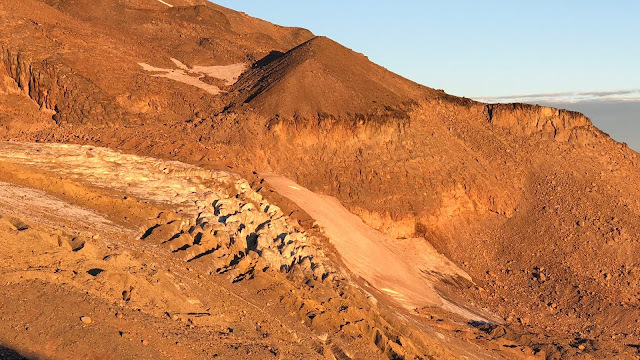 2018-09-14 2MHHR1 Sandy Glacier from Michael Irving on Vimeo. 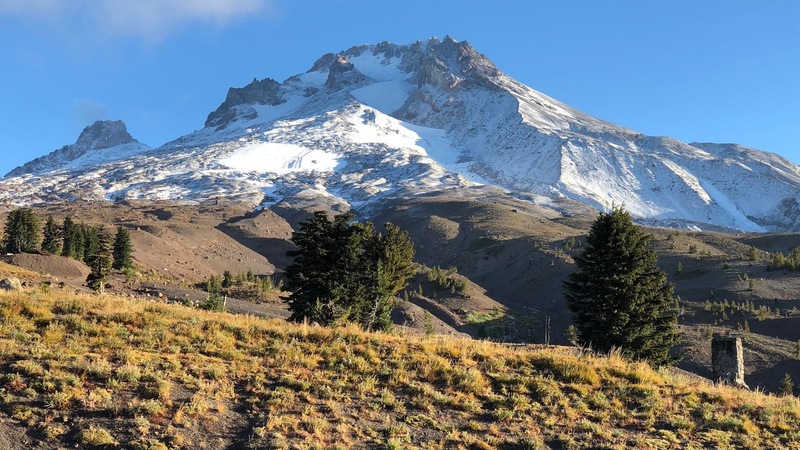 I left camp at 6:30, enjoying the views of the recent dusting of snow on Mt Hood. Apparently it was a little chilly last night. I continued my path across Sandy Glacier. I went pretty much on a contour to start, before realizing that I was standing on rock that was on top of the glacial ice. I figured I better drop down a bit to have more predictable footing. 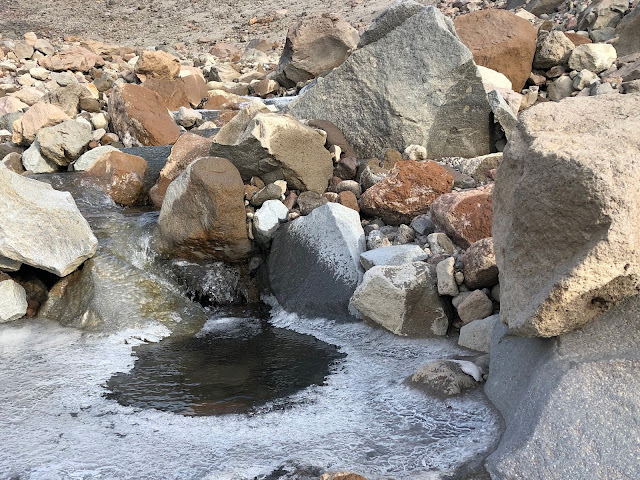 With the glacial ice constantly moving, the rocks tend to be less stable for footing. Here you can see what I’m talking about as I looked behind me, that’s glacial ice under that rock and dirt. I continued downward and over in somewhat of a diagonal path. If I did it again, I’d probably drop directly down from my camp a hundred yards or so before contouring over toward Cathedral Ridge. After hopping a few small creeks and winding around some mini rock crests, I finally made it out of the rock desolation back to some living growth in the ground. I also had some great views (minus the clouds from last night) down the Muddy Fork toward Bald Mountain. 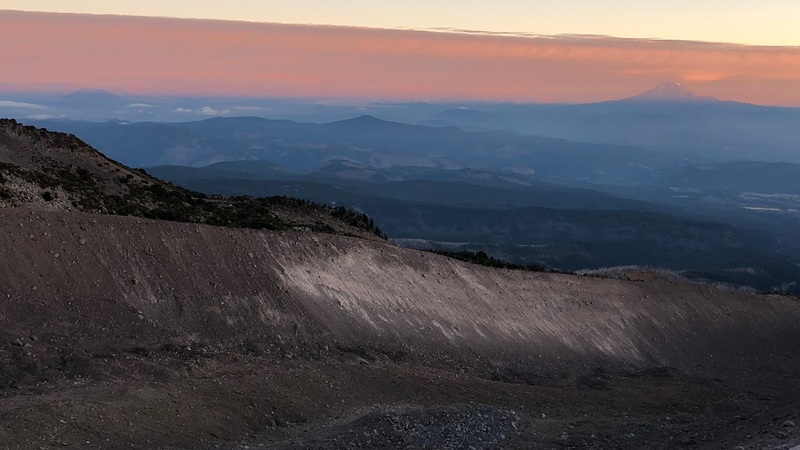 You can also see the shadow of Mt Hood in the upper-left of the picture. My final approach to Cathedral Ridge involved contouring the slopes up to the crest. There is a lot of low-growing shrub in here that is about a foot tall. There seems to be some sporadic, barely worn use-trail through here, but not enough to really pay attention to. This is actually some of the hardest part, as it involves walking along a decently steep slope and trying to watch your footing as you can’t really see the ground through the shrub much for a lot of the way over. I was happy with my track and wouldn’t change anything with it. This is just before arriving at Cathedral Ridge, looking back over the Sandy Glacier traverse. I started a bit in from the right, on the ridge line, on the other side and then climbed up and over the rock/cliff band, dropped down through that little creek, hopped the creek, climbed up to the base of the glacial ice and then contoured over to Cathedral Ridge. I arrived at the ridge at 7:35, 16.9 miles in on the hike. It took me an hour and 5 minutes to get here this morning along the 0.7 miles with my 0.7mph pace. 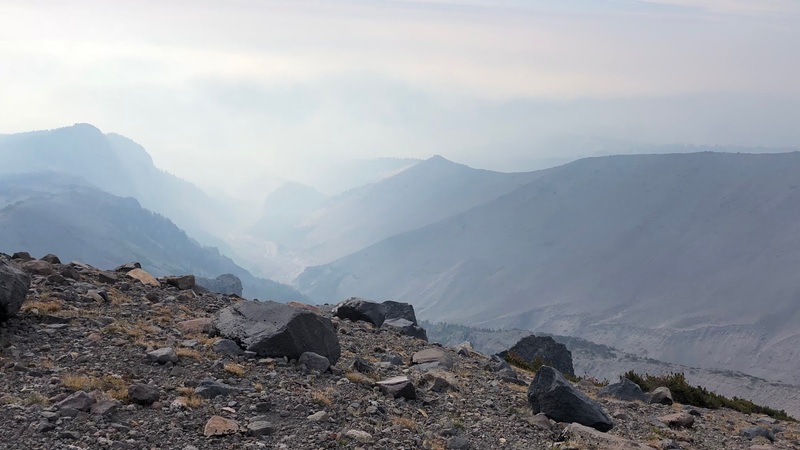 2018-09-14 2MHHR2 Cathedral Ridge from Michael Irving on Vimeo. Up the trail I went for 20 minutes and 0.4 miles until I reached the adjoining ridge that I’ll call Glisan Ridge, unless there is a more official name for it. A nice optional bonus would be to continue up Cathedral Ridge to where the trail ends, which isn’t too much further. There is a very cool single campsite up there that I've seen before. I started down the spine of Glisan Ridge. I finally got to see the sunrise and my first views of Glisan Glacier (12th largest/~10 acres). You can follow pretty much the exact crest all the way down. 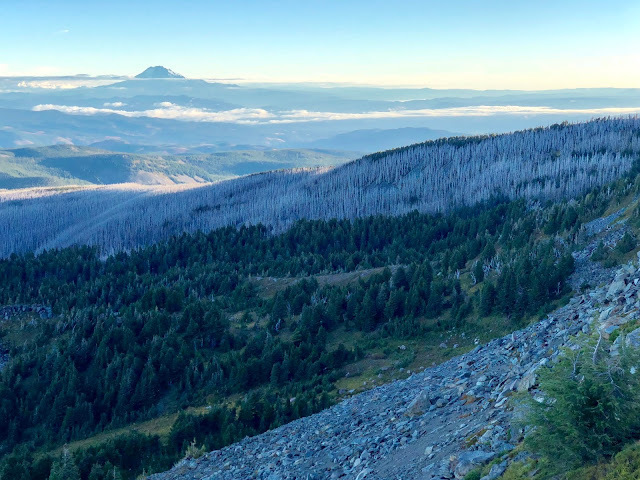 I could see McNeal Point and the shelter as the trail on the crest dropped below the timberline, which led to just a bit of bushwhacking before meeting up with the McNeal Point Trail. See if you can find the stone shelter in this picture at the top of the Point. I think my track makes it the best as possible through the brush, so I wouldn’t change a thing. Don’t worry, the bushwhacking is very short. 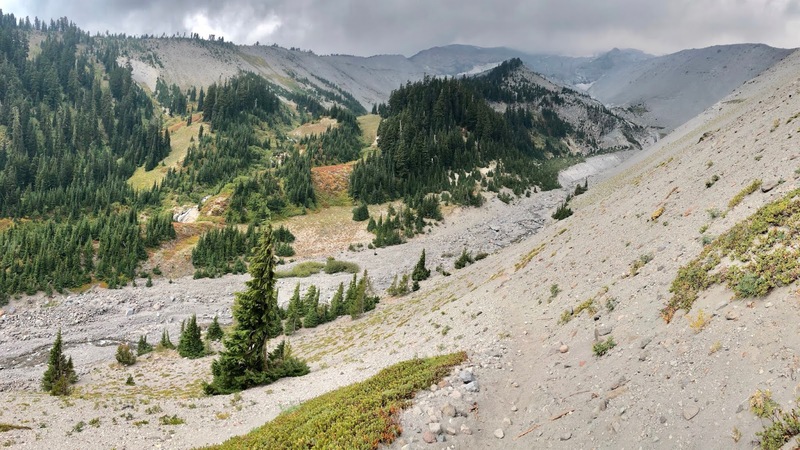 It was a very short tenth of a mile to meet up with the Timberline Trail and Glisan Creek. I filled my water here. There are some acceptable camps in the area too. It was 8:35am and I was now at 0.8mph pace at 1.6 miles for the day and 17.8 miles for the trip. 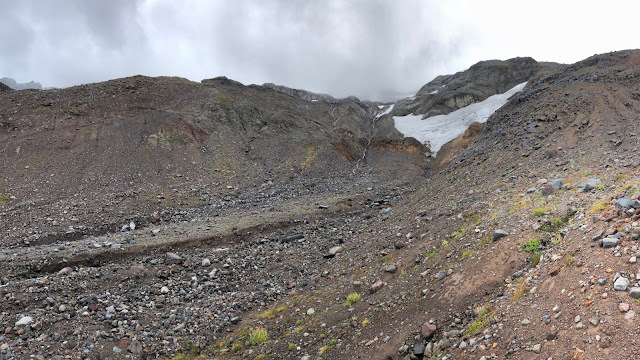 I left Glisan Creek and headed pretty much straight up the terrain to gain the crest of the moraine of Ladd Glacier (6th largest/165 acres). 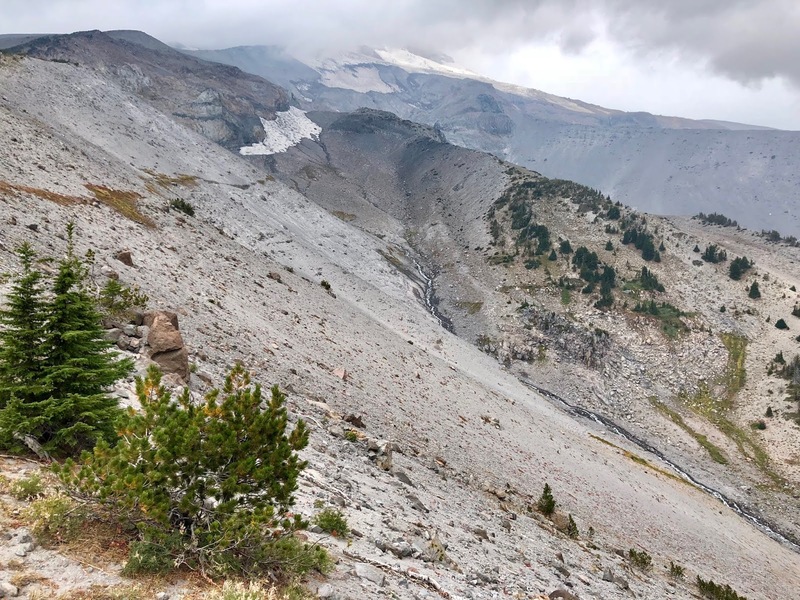 My track was fine, it might be a tad better to gain the ridge as fast as possible from the creek as it’s easier to hike on its crest than on the side-hill leading to it, but not a big deal either way. I took this picture just after reaching the crest of the moraine. 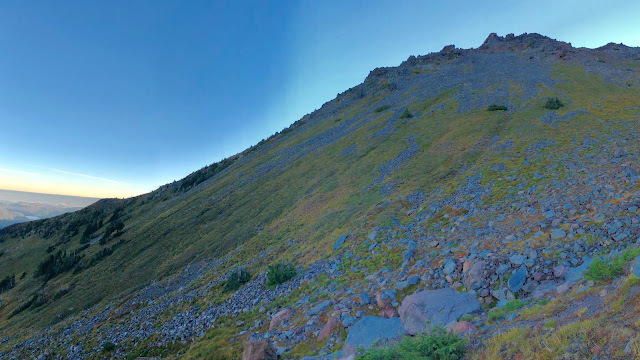 It is looking up the moraine crest where I will go. Ladd Creek is on the left and you can see Glisan Glacier on the far right. 2018-09-14 2MHHR3 Ladd Ridge from Michael Irving on Vimeo. Here is another slightly different angle with a wider view. Getting to the peak of the moraine, I was ready to drop down onto Ladd Glacier. 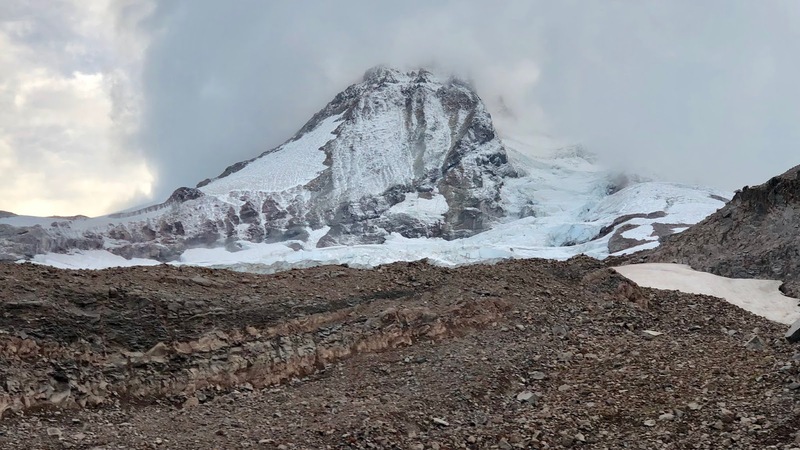 I dropped off the short distance to the floor of the glacier seen on the left side of this picture. Here is a video clip as I start up Ladd Glacier. 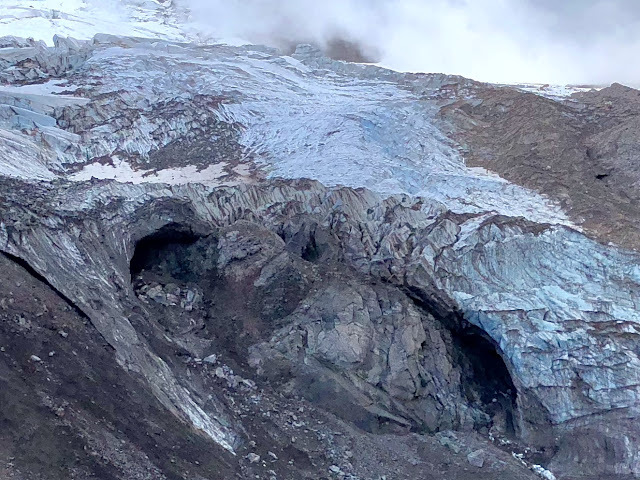 2018-09-14 2MHHR4 Ladd Glacier from Michael Irving on Vimeo. Last summer I scouted this segment 5 weeks earlier in the summer. I wore microspikes all the way up this slope from here. On this day I never put them on my feet. The headwaters of Ladd Creek we’re coming from the base of the glacier as I got toward the top. This was also pretty easy hiking. It’s always interesting looking at the edges of glaciers. 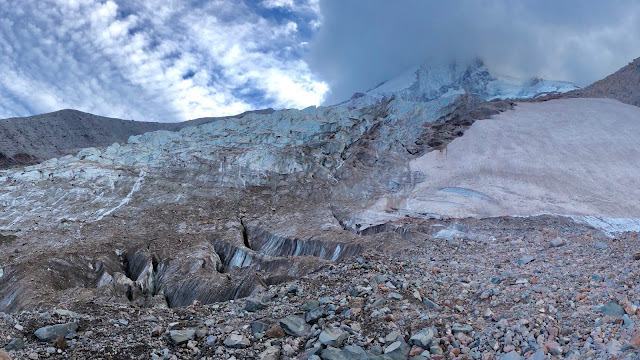 As I approached the top of Ladd Glacier, it merged with Coe Glacier (3rd largest/296 acres). You can also see Pulpit Rock (8,737’) on the left third of this picture. 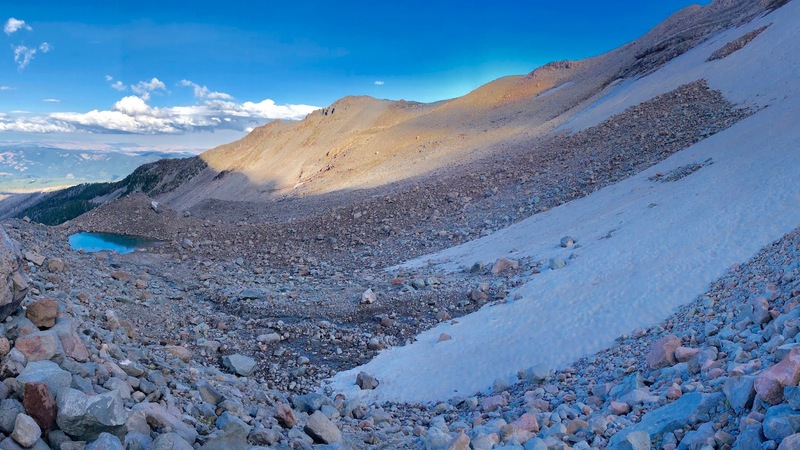 Now I did some rock hopping to get over to the base of the nose of Barrett Spur (7,853’). There was a lot of glacial ice in this area too, but things seemed pretty stable (YMMV). You can get a good view of the glacial crevasses here just at the base of Barrett Spur. This is the nose of Barrett Spur below on the right third of the picture. This is a crux of the hike today. 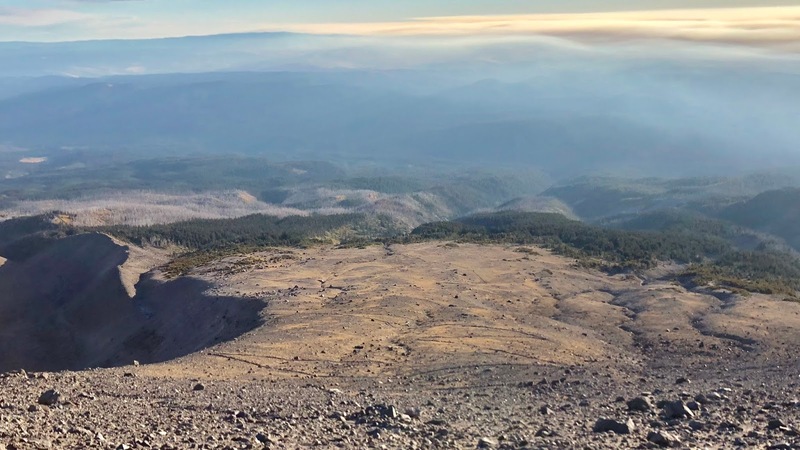 Barrett Spur is the large rock outcropping that you can see from Portland that seems to stick out from the left side of Mt Hood. There is a very obvious “best way” to go up this nose. In my opinion, my track is really the only way to approach it. This is my second time up this route. My path goes right-to-left along that rock band and then up the side to the top. It’s all pretty consolidated, but a tad on the steep side so caution is definitely needed just to make sure you don’t do something silly as it’s a potentially perilous fall if you fall and tumble. This is one of the sketchiest part of the whole hike. It’s actually not that bad, what makes it bad are the consequences if you slip and tumble. Slipping doesn’t mean you’d also tumble, so that’s why it’s so important to take it slow and careful. This is the only part of the hike where I strapped my trekking poles to my pack and scrambled with my hands on the lower part of the approach. The sketchiest part is the short, maybe 20’, section through the rock band. It’s very sure-footed, but not good if you slip. 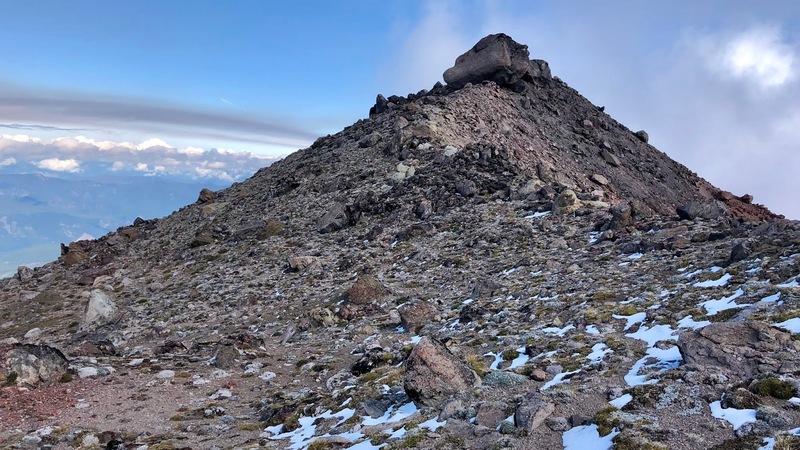 When I think about doing this high route in the opposite direction, this would be the crux of the hike as I think going down would be worse than going up. Having said that, I think there are several other spots on the hike that would be better to go the other direction. After strapping my poles to my pack and sending a satellite text to my dad to tell him to make sure my auto-tracking pings keep progressing, I started along the rock band. There were a few hand-holds to make sure I was super stable and then before I knew it, I was through the short section and heading up the semi-steep side slope that was pretty stable. When I got to solid footing, I grabbed my trekking poles back. I used them to to help push me up the hill. I was aiming for the bigger rocks embedded in the dirt hillside to increase the likelihood of solid footing, which worked pretty well. As I worked my way up, the slope continued to slowly decrease in pitch. Then, my pole planted in between a couple rocks and I lost my footing for a split-second. It was no big deal, but I did have to make a sudden movement to regain my balance. Then I heard “SNAP!”. Dang it! I snapped my trekking pole about a 1/2-foot up from the bottom. Those are spendy little suckers. Oh well. I continued to use it with my remaining good trekking pole to get to the top as the bottom few inches flailed off to the side. It started flattening even faster…and then it was flat. I did it…I’m glad that’s behind me. I sent another message to my dad that all was good. 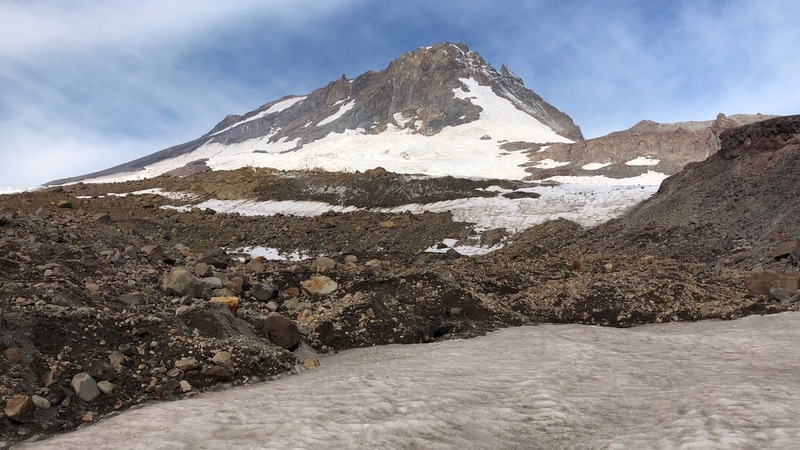 I walked easily to the front of Barrett Spur to overlook the Coe Glacier. This is probably my favorite view on all of Mt Hood. It feels like a front-row seat to Coe Glacier and the summit of Mt Hood. As an optional add-on, you can take a short spur trail that extends off the nose of Barrett down to an even closer overlook. I did it on my scouting hike last summer…it really is a must if you make the effort to get here. It was cloudy around Coe and very windy, but it looked pretty mystical! 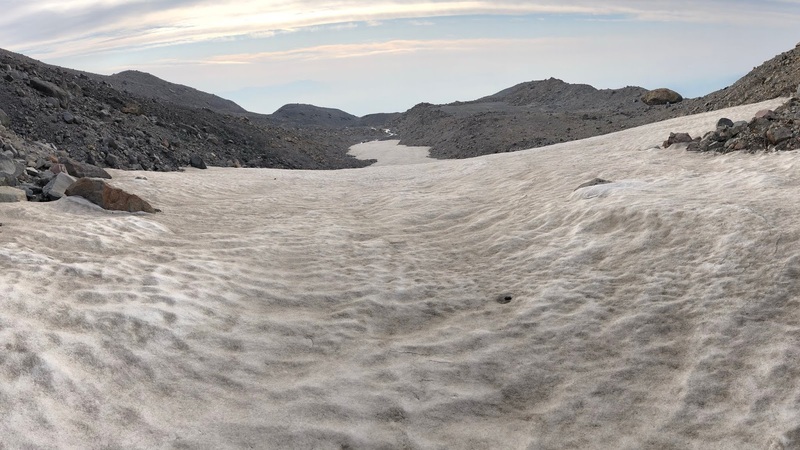 Here is a wider shot that also captures the top of Ladd Glacier. 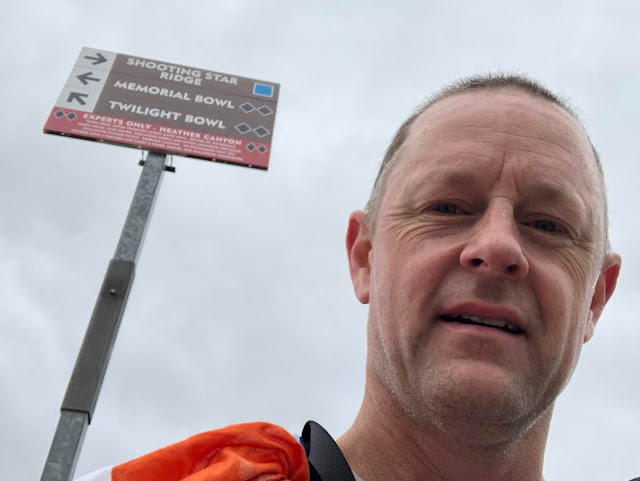 I arrived up here at 11:00, and 3.2 miles into today’s hike and 19.4 miles total at a pace today of 0.7mph…I was flying. It took me 20 minutes to get from the base of Barrett Spur up to the top of the nose of it. I wouldn’t change anything on my track to get up here. 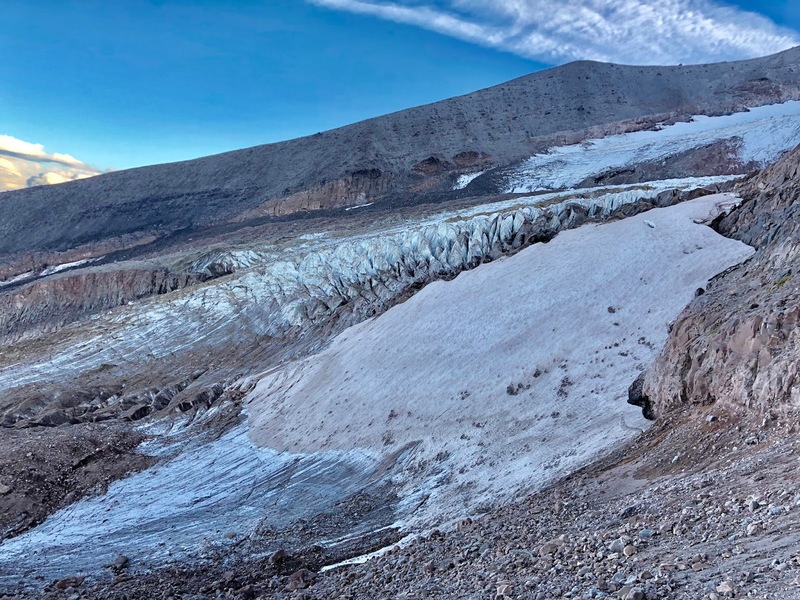 Once at the top of Ladd Glacier, there are multiple ways to get to the base of Barrett. The general path is to stay on the high ground as best you can and aim for the up-point. The other side of the high ground seems to have some crevasse activity, so I’d generally advise staying off that side during the ascent to the base of Barrett. ALTERNATE 1: If going up or down Barrett is intimidating, it looks like you can follow the base of it back north to where the crest of it drops down and rejoins the main part of the mountain. I have not gone this way so proceed at your own risk and research. ALTERNATE 2: I’ve also heard of some people traversing the Coe Glacier in between Barrett and Hood. This seems to be out of the scope of this hike as it appears to cross some significant crevasse activity and also it appears to have a challenging exit to get out onto the moraine on the other side. 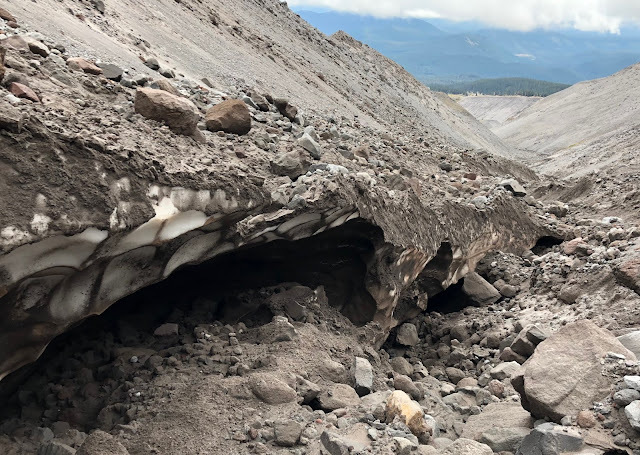 I would not do this and would not recommend doing it unless you really know what you’re doing and have the crevasse experience to deal with it. I’d be very interested if anyone has additional insight into these potential alternates or even my primary route getting up on top of Barrett. Here is a video clip from the nose of Barrett Spur. 2018-09-14 2MHHR5 Barrett Spur from Michael Irving on Vimeo. 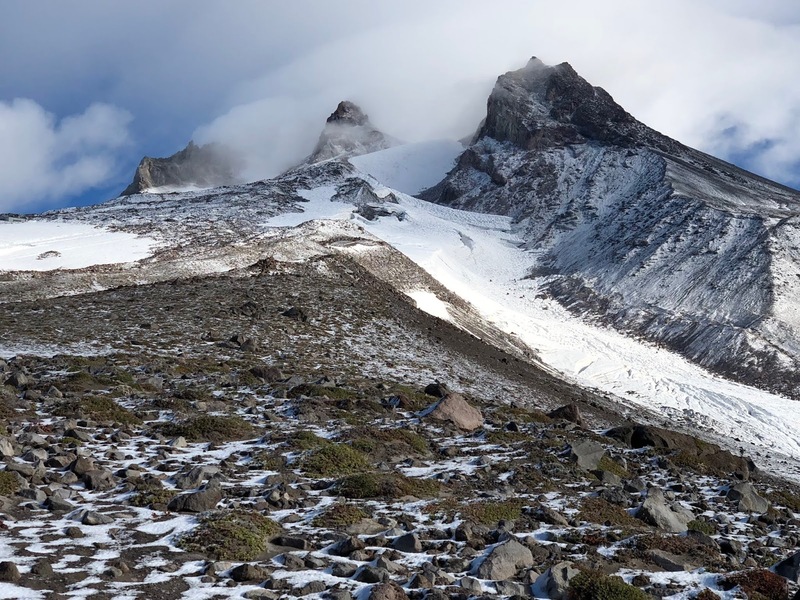 I turned away from the mountain to head back along the spine of Barrett Spur. This is certainly one of the most majestic parts of the mountain. You could almost play a football game up here there is so much space. There were no logical places to camp, but it could be done. It wasn’t perfectly flat, but close. The real summit of the spur is about halfway back along the spine. There is a massive boulder perched up on top. This is looking to the right, down to Coe Glacier. You can see why I wasn’t a fan of crossing it. 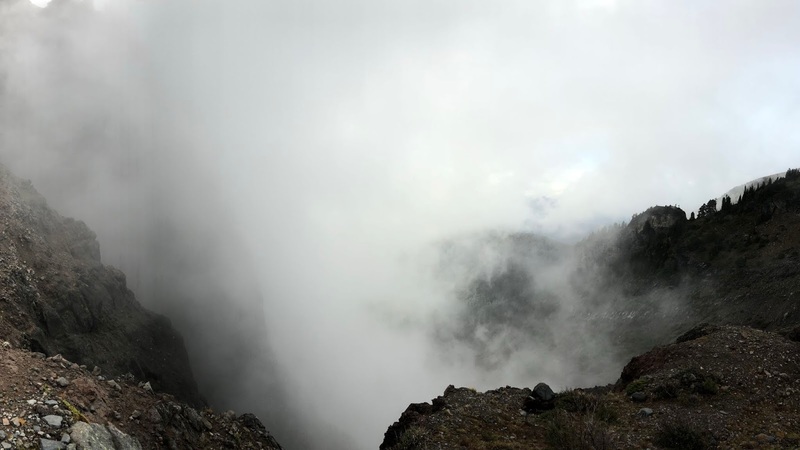 in the distance, you can see Langille Crags which is the ridge in the upper left, and you can barely make out the Cloud Cap Inn in the very left edge at the bottom end of the crags. Getting on the true summit of Barrett Spur, I turned around for another view of the mountain as the clouds would come and go. Once reaching the summit, it drops off kind of steeply to get down the approach from the non-mountain side. It requires pretty careful stepping. I wouldn’t call it sketchy as everything was pretty solid (YMMV), but it was definitely picking and choosing steps to lower down off the top. This picture is looking back once I got down off the spur. There was a bit of a use-trail, but it would come and go, so it was hard to always stay on it. I went down the ridge toward Dollar Lake. just when the talus/scree turned to grass/growth, I dropped down off the ridge. I went along the edge of a stream that was running down the hillside on the mountain side to the creek. It was pretty steep, but the grass kept the ground firmly in place and allowed for a reasonably easy descent. The main challenge was to take small steps to avoid the feet from sliding out and landing on my backside (which wasn’t much of a fall as it was pretty steep). Once down the steep portion, I curled to the right to descend through a meadow of easy grade to Elk Creek. 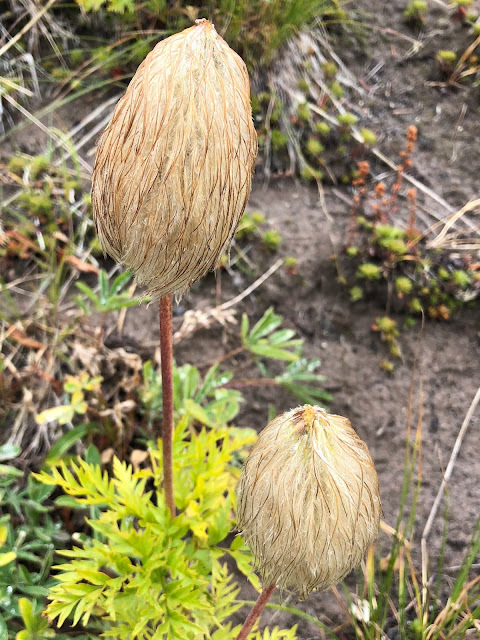 There were tons of Western Pasqueflower through here. 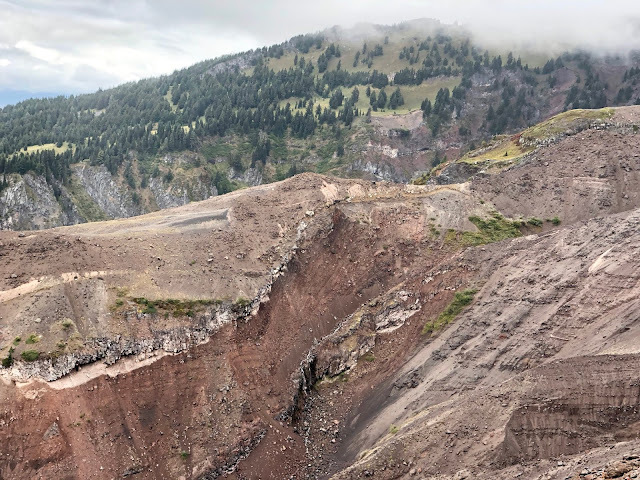 In this next picture you can see the talus/scree slope on the right side. In my scouting hike last summer I thought it looked like a good option to come directly down that instead. It was a nightmare! It wasn’t necessarily dangerous, but it was slow-going, ankle-turning and dusty/dirty. Just don’t do it! The way I went this time was SO much better and faster, even thought it was a little longer. I made it to Elk Creek. This was my next water supply and my lunch stop with another of my infamous tuna burritos. I needed it…this has been a hard day of hiking! You can see Barrett Spur in the background. I arrived at 12:55pm at 4.9 miles in for the day and 20.1 miles for the hike. My pace for the day was 0.7mph here. This location is very close to Elk Cove on the Timberline Trail if you need to bailout. Of course it would be easy to drop to the Timberline Trail to avoid the next up-and-down, which happens very quickly, but we’re not looking for speed here, but to maximize the high route and the views…right!? After my half-hour lunch and water break, I left for the next segment. Leaving the creek, I looked to the direction of west Coe moraine. In the picture below, I hiked up to the lower-left corner area and then fundamentally hugged the edge of the talus all the way to the top. There’s a bit of a dry creek bed in there that seemed to be the easiest way to the top. It’s a pretty easy climb, it gets a tad steep at the top, which slows the pace, but it’s technically very easy. Part-way up, I turned around to have another look at my descent path from Barrett Spur. I dropped off the ridge and cut diagonally on that green band, in-between the talus, and then came straight down the vertical green band just to the left of the tiny creek and brown area in the center of the picture. Then I curled to the right (as I was coming down) to Elk Creek. At the top of the west moraine I got a nice look up Coe Glacier. 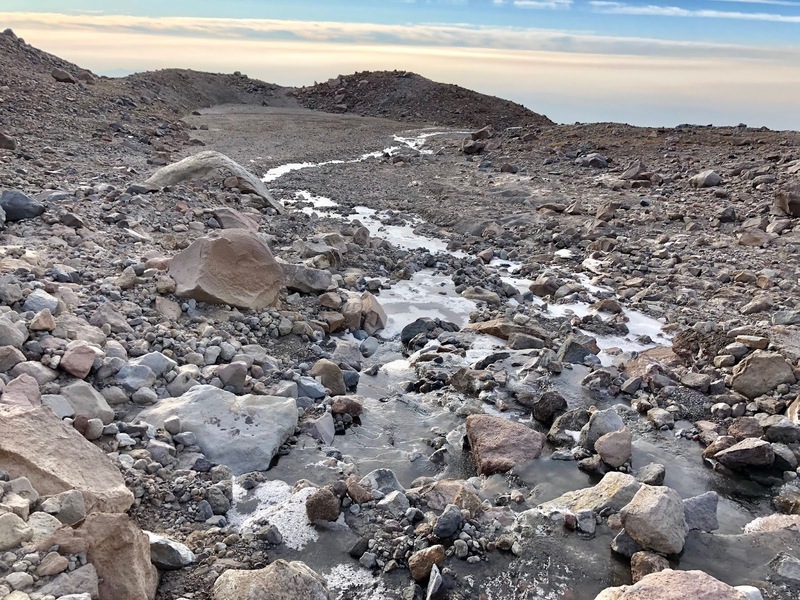 All that dirt out there is on top of glacial ice and Coe Creek. You can also see the challenge of getting up the other side. Here’s a zoom-in to see Coe Creek emerge from the glacier. 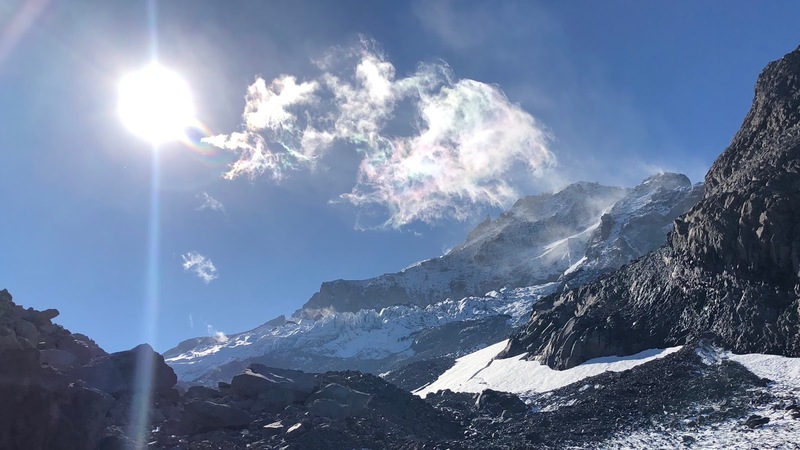 Here is a video clip of the Coe Glacier area. 2018-09-14 2MHHR6 West Coe Glacier from Michael Irving on Vimeo. I started down the crest of the moraine and saw a new plant that I wasn't familiar with...Sitka Alder. It’s reasonably easy to stay on the spine, but there were a few spots where I had to dodge to the left to get around some trees/bushes growing right on the crest. There were some small, dead trees through here with dried out and non-bendy branches that poked me, but it wasn’t too bad. The trick is to always get back to the crest as quickly as you can as that’s generally the easiest traveling. It’s easy to get lulled into drifting away from it and then you get lured into a lot of dead trees on the ground that make for slow-going. 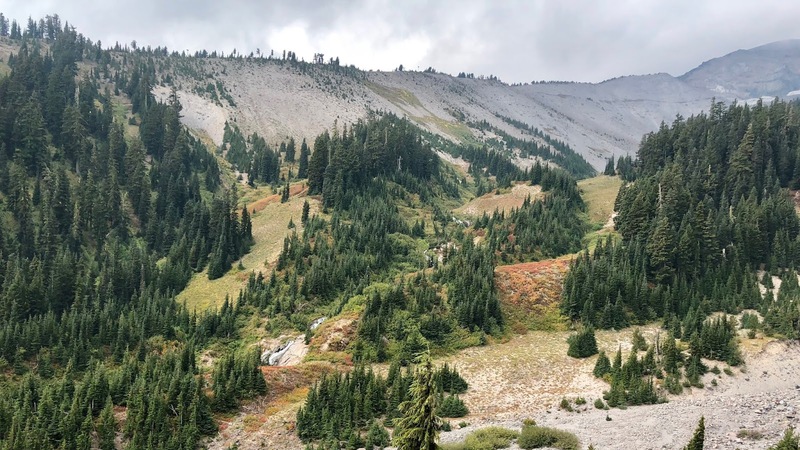 As you drop below timberline, it does require some log hopping and careful navigation, but it’s not too bad. the views down into Coe make it a worth endeavor. Just stay on the crest all the way to the Timberline Trail. Last summer, when I scouted this, I tried dropping down to Coe a little earlier and getting over the creek a bit above the trail. I did it, but it was totally not worth it. the drop to the creek was brushy and there was no real easy crossing…we had to hunt around a bit and our ultimate crossing, while not sketchy, was not easy. 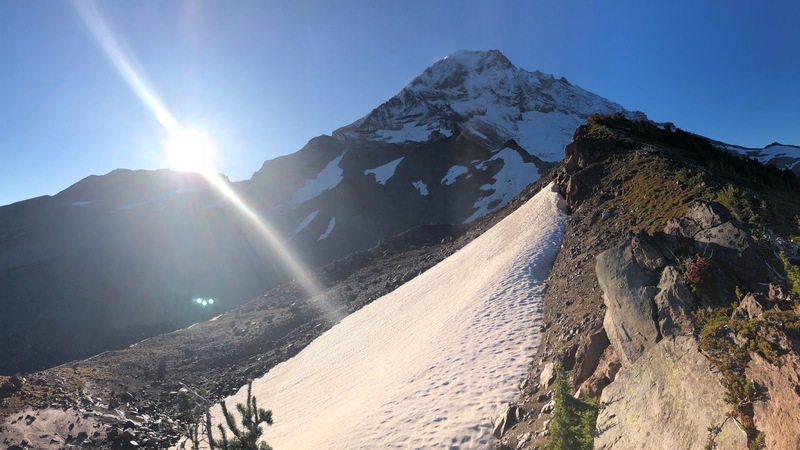 Just do yourself a favor and stay on the true crest all the way to the Timberline Trail. Crossing Coe Creek at the trail was easy and it’s a good water source if needed. 2018-09-14 2MHHR7 Coe Creek from Michael Irving on Vimeo. I’m not going to lie (not that I ever would right?…why do people say this anyway ever? Do they lie sometimes and now they’re just letting you know they’re not really lying this time?? Dumb phrase…okay…I’m never going to use that phrase again.) Anyway…I digress…last time… I’m not gunna lie, it sure felt good to get on the trail! It was only a 1/2-mile or so, but I made the most of it and cruised to my next trail junction. I got there at 3:10pm, 6.8 miles in for the day, 23.0 miles for the hike, and 0.8mph for the day. 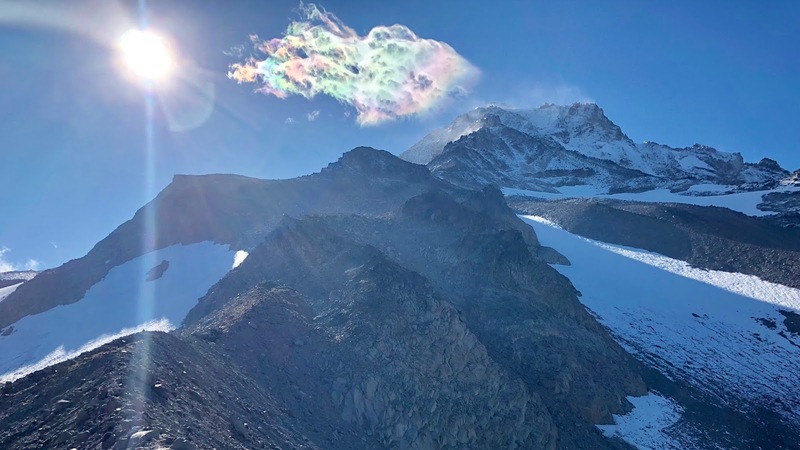 I was pleased with my track and wouldn’t change a thing…unless there was a reasonable way to get directly across the Coe Glacier (which I don't think there is). Let’s just say that this next segment’s beginning is not the finest tread for the Mt Hood High Route. Put in other words…it sucked! Fortunately, the suckiness lasted for a very short time. 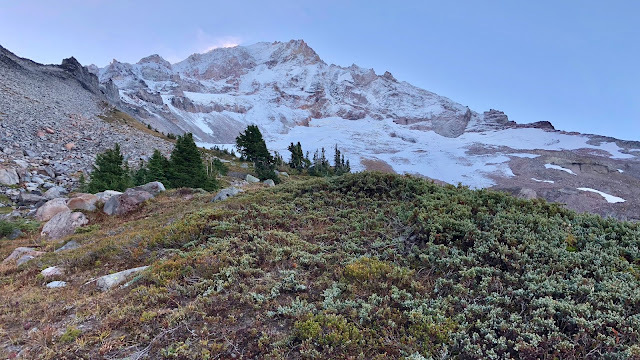 After taking the Timberline Trail a short distance up from Coe Creek, I simply continued up the east moraine rather than hanging a left on the trail. When I did my scouting trip last summer, I started on the Timberline Trail for another mile or so, going up the third ridge. I had to do some army crawling on that route to get under some scraggly trees growing on the ridge and almost turned around. I liked my route today much better, as it got off the trail faster and was a more interesting trail up once I got past the beginning. 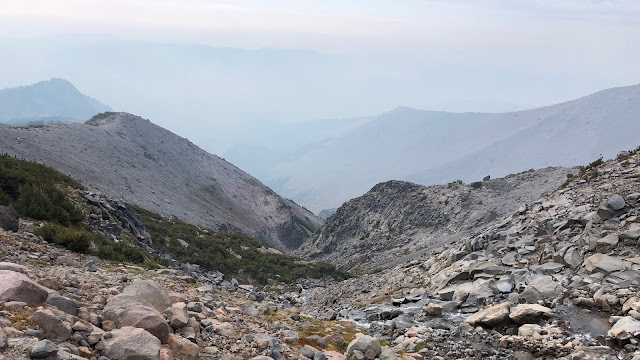 My thinking was to stay on the moraine crest all the way up as I figured it would get out of the scrub the fastest. It was not a great route. No matter which path up you choose, it’s steep and scrub brushy to start. 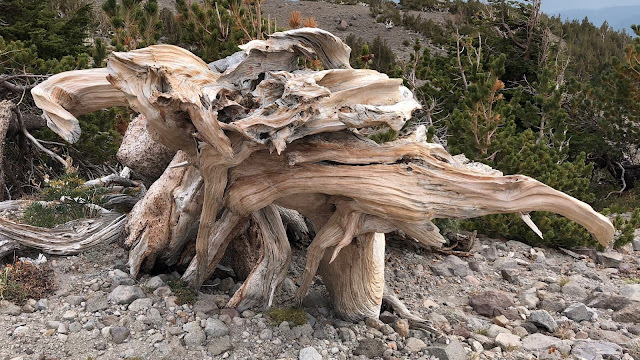 I had to weave through several dead trees on the moraine crest that were a pain in the neck. 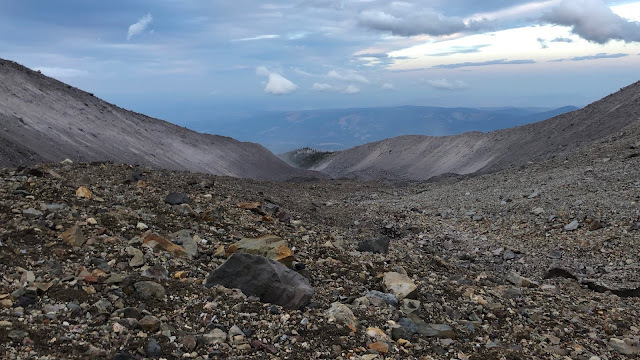 If I did it again, I’d go about 10 yards further on the trail before turning up the slope, thus staying about 10 yards from the crest of the moraine as the climb starts. It may be a bit more scrub brushy, but I think it’s more open so you don’t have to dodge through prickly dead tree branches. Fortunately, this bad part is very short…almost like a gatekeeper trying to keep you out. It’s only about 100 yards to get out of this mess. Once I broke free, I had more nice views up Coe. 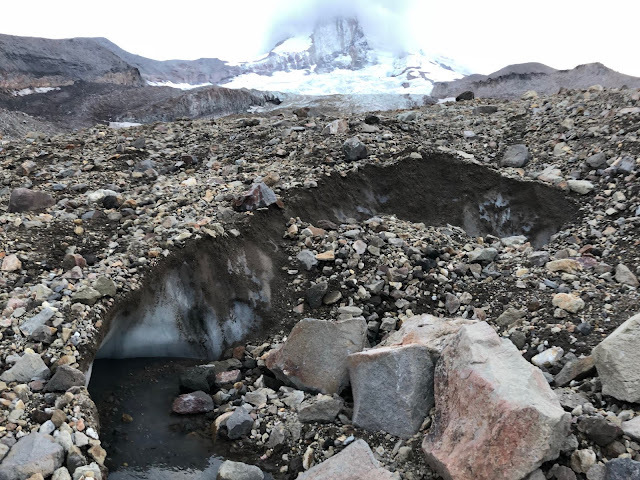 To get your bearings here, you can see Coe Creek coming out of the glacier, which is from the opposite side of the picture I showed you earlier. Barrett Spur is the giant pile of rocks on the upper-right. You can also notice that the clouds were starting to form on the west side of the mountain. Barrett Spur seemed to be the demarcation line that kept them away from me on the dryer east side. 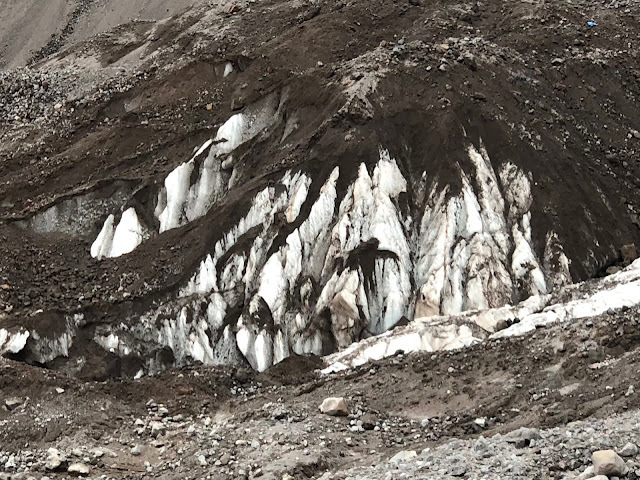 Here is a clip from this side of the Coe Glacier. 2018-09-14 2MHHR8 West Coe from Michael Irving on Vimeo. I generally stayed on the moraine crest as I went up. There were some trees and shrubs occasionally that made me drop off the side. This side is much more pleasant that then other as the walking along the moraine was pretty clean. In fact, part way up there was a perfect gully that was very pretty to walk through and protected me from the wind that was picking up. At the very top of the east Coe moraine, I had excellent views to some glacial caves. It was very cool. 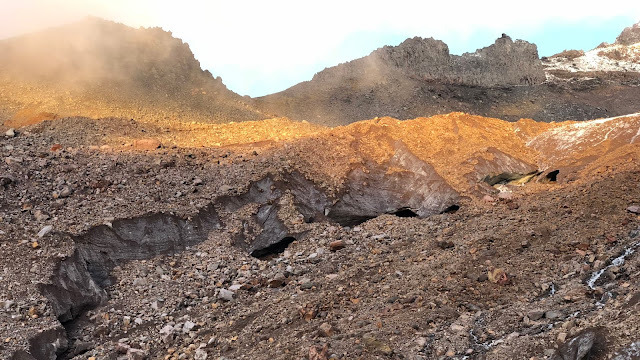 Here’s a pano of the caves on the left and Barrett Spur on the upper-right. 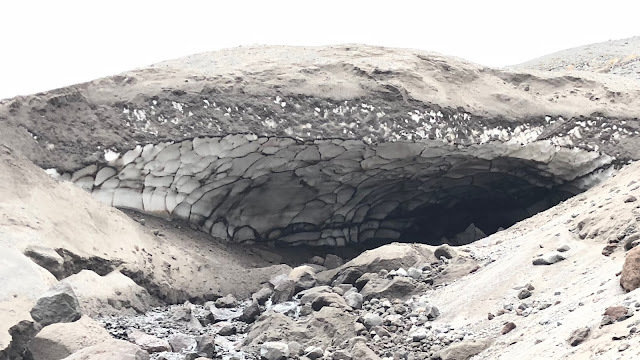 Here is a video clip from the top of Coe moraine, looking at the ice caves. 2018-09-14 2MHHR9 Top Coe from Michael Irving on Vimeo. 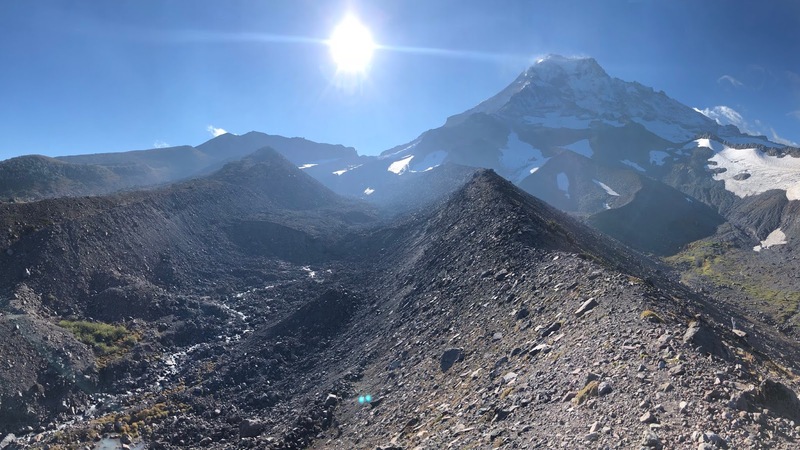 I got off the moraine crest and contoured east and dropped down the talus to the Langille Glacier (10th largest/38 acres). This was just a tad sketchy as it was about as steep as I would want to go down with rock that was reasonably consolidated, but not totally locked in place (due to it being smaller in size). Fortunately it was not far to get down it. I was a little intimidated about the possibilities of getting up the other side since I hadn’t scouted this area before, but by the time I got over there it wasn’t bad at all. It was slow-going getting up the steep slope, but it didn’t feel sketchy at all to me (YMMV). You can also see that snow chute in the picture going down. This is the only spot on the entire hike that I used my micro-spikes. I debated about even putting them on, but figured I should err on the side of safety, so I used them and my ice axe to get across that short stint. Here’s a close-up view of the snow chute that I crossed. Once I got up to the crest on the other side of the snow chute I was rewarded with the view of the Mooney Tarn. Just below the tarn is the site of the Mooney airplane crash from December 1, 1975. (Mooney is a manufacturer of small airplanes.) As an optional side-trip, it is very worthwhile to go look at the wreckage. I saw it during my scouting hike as I had come up through that ridge and gone right past it. I also understand there is a camp in the trees just down and to the right of the wreckage, but I didn’t investigate it. You can also see Langille Crags on the next ridge over from Mooney Tarn. 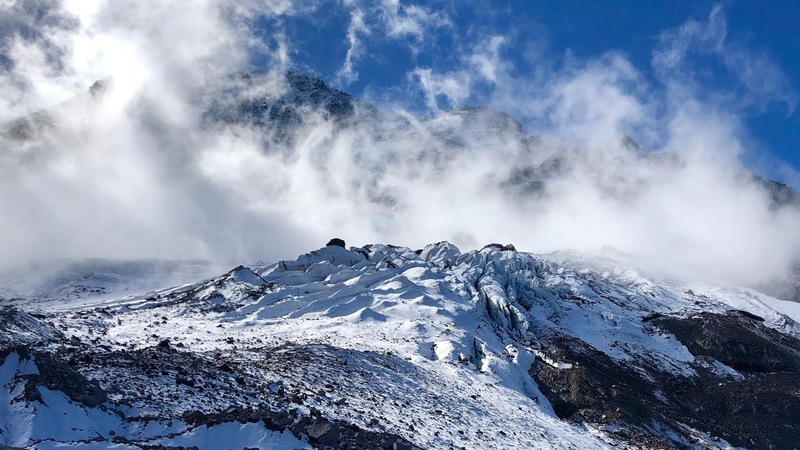 Looking up the mountain shows more of Langille Glacier. Mooney Tarn is a pretty spot, no doubt. I arrived here at 5:15pm, 8.5 miles in for the day and 24.7 miles for the hike and 0.8mph for the day so far. I was generally pleased with my route, with the only changes being that starting point from the trail that I already mentioned in detail earlier. Here is a video clip of Mooney Tarn and Langille Glacier. 2018-09-14 2MHHR10 Mooney from Michael Irving on Vimeo. 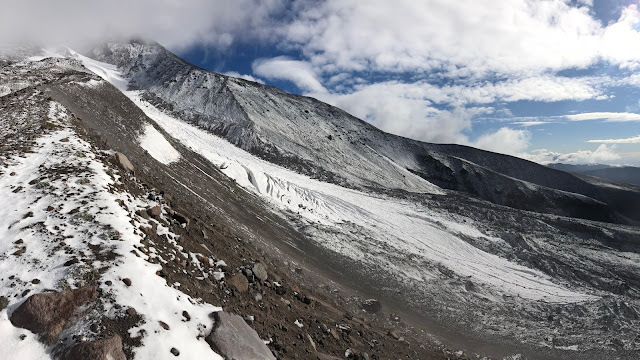 I headed up the Langille Glacier. On my scouting trip last summer, which was 5 weeks earlier in the year, I used micro-spikes to go on snow all the way up to the top of this ridge in the picture. This year, I never needed to touch the snow. After contouring across with a bit of elevation gain, past the Mooney Tarn, I headed straight up about halfway, and then cut over diagonally to the ridge of the top of Langille Crags. This is looking back down on my path from the Mooney Tarn, which you can see just right of center in the picture. Once on top of the ridge, it’s surprising how much almost-flat space is up there. It’s not really flat enough to camp, but it’s surprisingly expansive. I crossed over the flattish area and pointed up to Mooney Point, which is the target for crossing Eliot (or to go down the Eliot moraine to cross at the more traditional route or the new crossing down even lower). My understanding is that there are a couple of camps up higher, above Mooney Point. There are two spurs that run parallel up to the glacial ice. 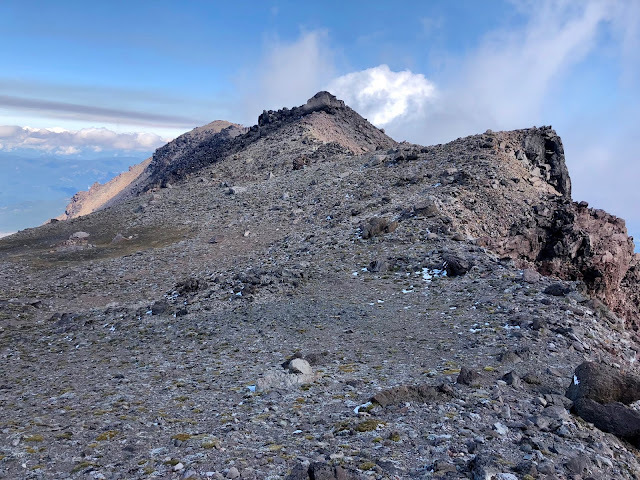 The camp on the left spur is at about 8,100’ and the other one on the right spur is at about 8,450’, so these are optional side-hikes for camps or to simply get to the highest hikeable spot possible on this part of the mountain. This is also the location of “Snow Dome” which is the nickname for the snow above the Langille Crags by these camps that can be skied down in the the summer before all the snow melts. It’s a reasonably popular spot for the backcountry skiers that skin up the slopes on their skis and then ski down. 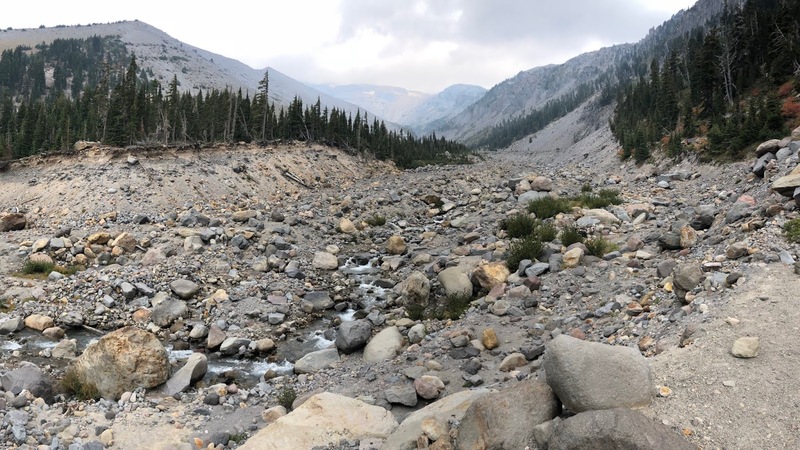 For my scouting hike last summer, I went down the moraine and crossed at the traditional washed out trail-crossing that most have been using over the last decade since the 2006 washout of the prior crossing. I knew that others had crossed the glacier up higher on 3 different paths, but I had always been intimidated to try that. In the “high route” spirit, I had done more research and decided to give it a go. 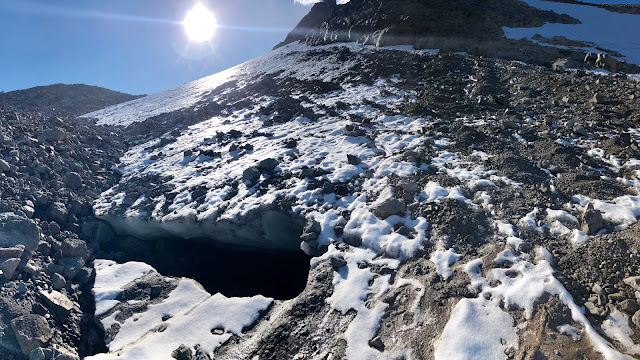 The top of the 3 options goes high on the glacier where there are open crevasses…that was definitely off the list for me. 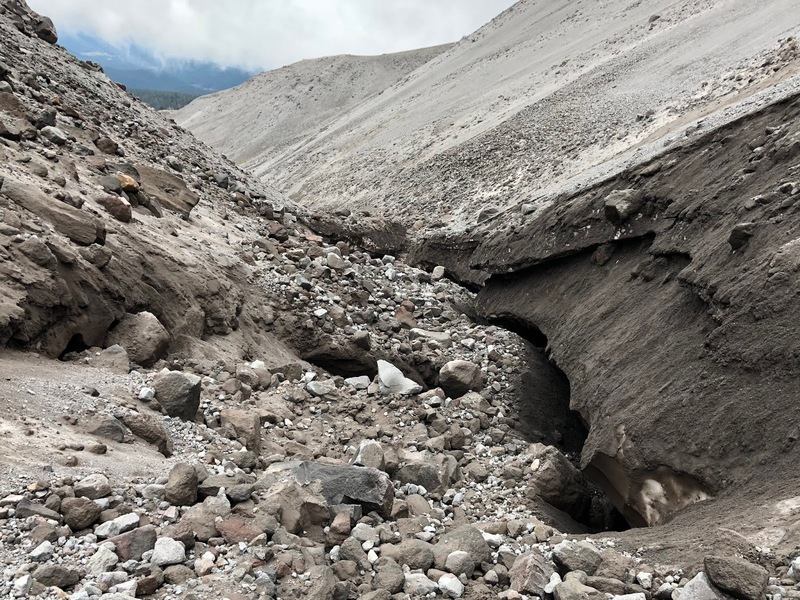 There is a direct route that crosses lower, that still has some active glacier area, and then there is the lowest route that involves cutting down along side it and then cutting over. This is the general route that I selected. I cut in to the drop-in to Eliot Glacier (1st largest/395 acres) just on the front side of Mooney Point. It looks a bit intimidating, but it’s actually not that bad. You can see it in the pointy feature in the picture below. 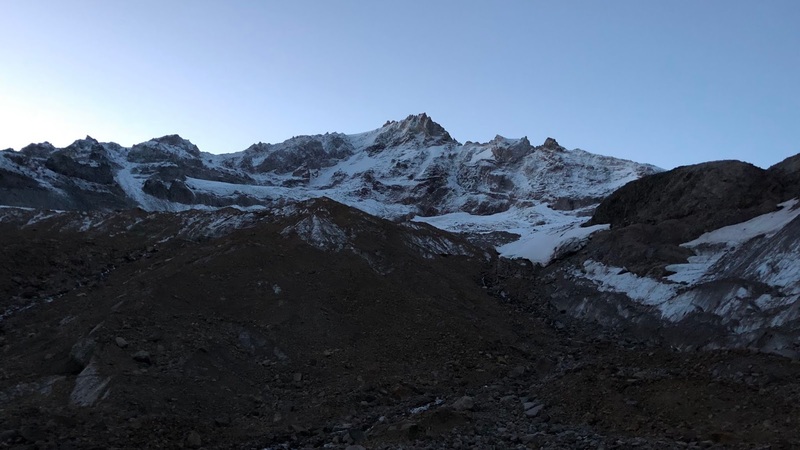 I contoured along its base to get across the short headwall to the rocks that drop down to the moraine and then lower to the glacier. As I’ve never done this route, it was one of my biggest question marks of the hike. I had hoped to have been about an hour ahead of my schedule here as evening was approaching, but it was what it was. 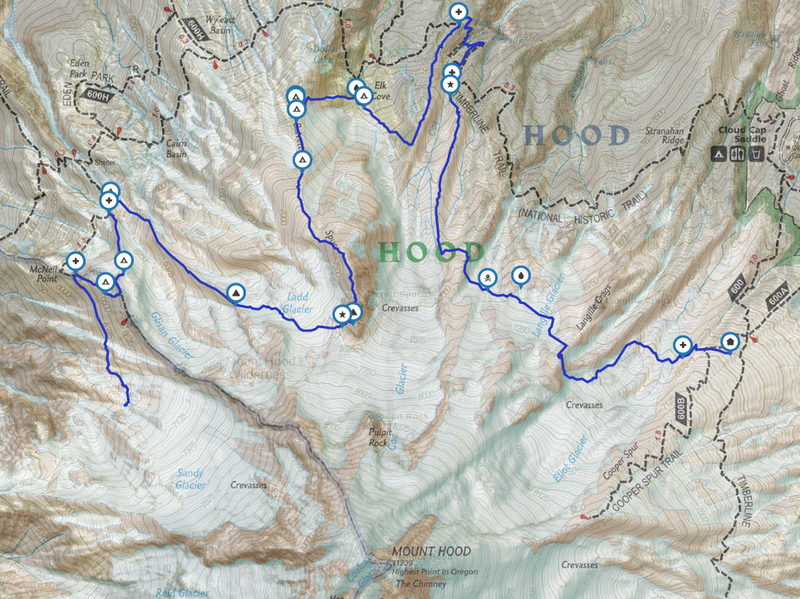 Being that I was a bit unfamiliar, I was studying the three GPS tracks that I had downloaded from other hikers online of the three tracks so that I could constantly check my bearings. I ended up staying higher up longer than I needed to. This led to a steeper decline once I finally started descending more. If I did it again, I’d cut down sooner than I did, similar to when I took the moraine down last summer. 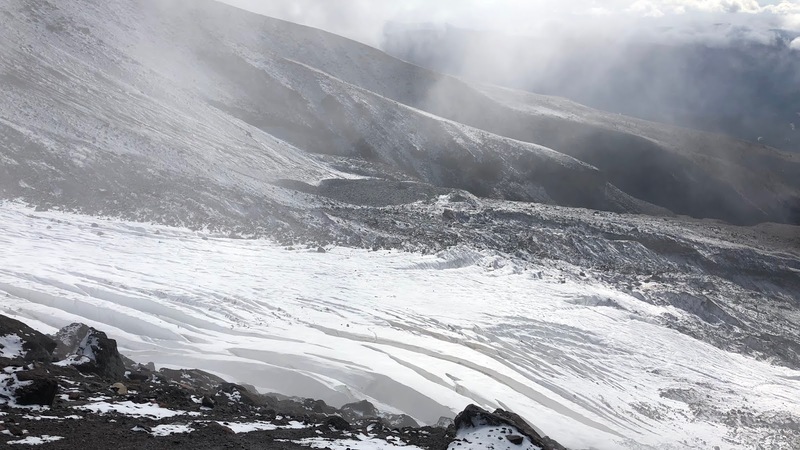 In the picture below, you can see the highest crossing over the glacial ice and the crevasse activity. You can also see the moraine way over there on the other side. This is the largest glacier on Mt Hood, so this was going to take some time. As I gingerly made my way down the boulders, this was another descent that I wasn’t a real fan of. It was borderline sketchy due to its slope and the rocks that were reasonably stable, but not locked-in all the time either. I’d much rather go up this than down. As I said before, I think it would have been better to cut down at a sharper angle from my traverse in front of Mooney Point. As I went down, I slipped up once or twice where I had to catch my footing. It didn’t help that one of my trekking poles was a 1/2-foot shorter than it should be, with no carbide tip on the end of it. One of the times I slipped, I had my good trekking pole down between a couple rocks. You probably know what happened next…SNAP! There went my other pole. Dang it! Now I was reduced to what I called “trekking canes”. 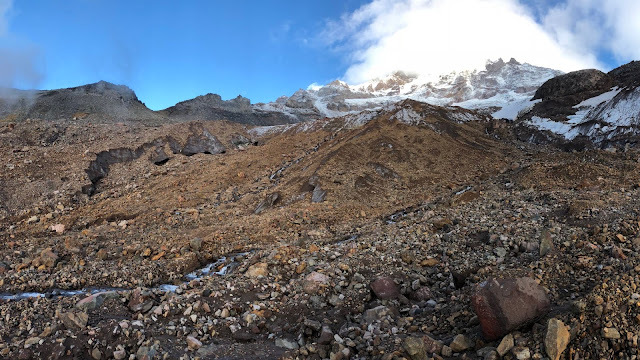 I hugged the near moraine base to get down below the major glacier activity that you see in the picture here. Then I cut over to cross. The tread was pretty typical low glacier path in the sense that the small rocks/dirt are all blended together and not consolidated. It’s like walking in mud a bit with its “squishiness”. It was reasonably easy through here. I came across a stream of water as I started crossing. I though that I should get water here since I knew I was low, and I knew there wouldn’t be any at the shelter, and none until after I had dropped down from my Cooper Spur climb in the morning. Evening was coming though, and I wanted to get more distance under my feet before I stopped. I had a very powerful headlamp with me, so that was okay, but I really wanted to be done by dark. 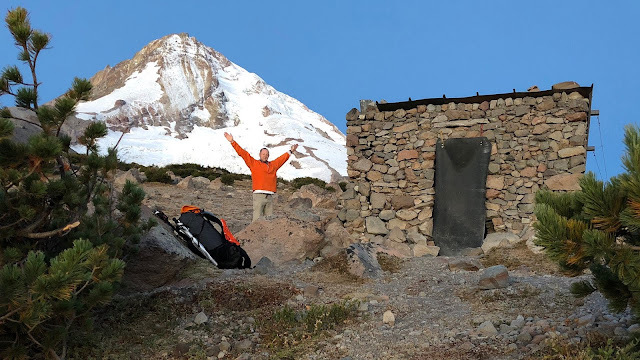 After snapping my second trekking pole, I was on a mission to get to that shelter, as I rely on my trekking poles for the structure of my tent. The back pole doesn’t need to be long, so the one broken one would be fine, but the front pole is long, so that wouldn’t work. This is looking up the Eliot Glacier as I crossed. 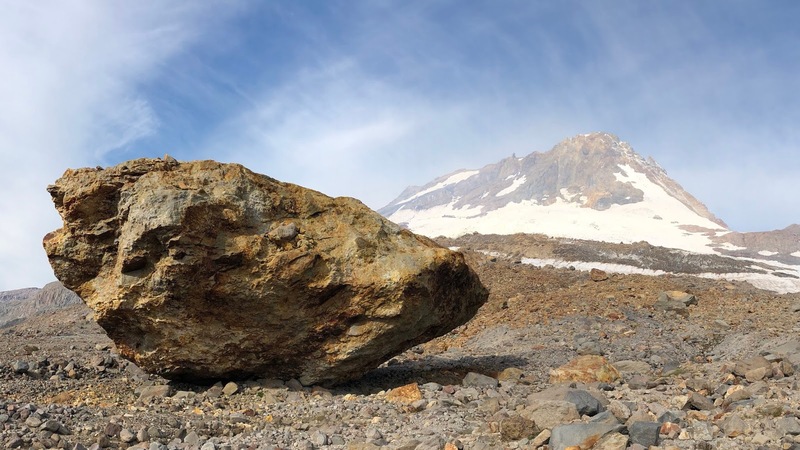 All this rock is on top of glacial ice. This is looking down the center of the glacier. The moraine walls that the glacier has created are so far apart. It makes you feel pretty small in here. Here’s an example of the glacial ice under the rocks. 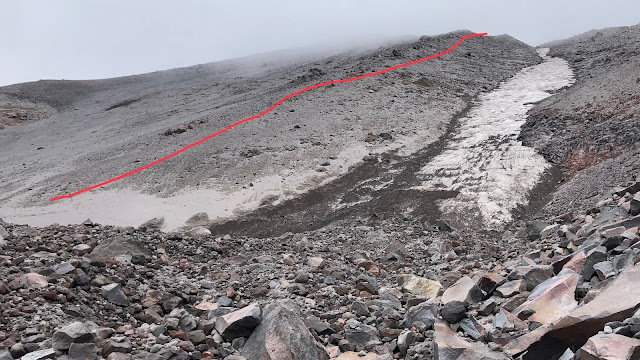 As I crossed, I could see the diagonal use-trail that’s been created to cut down the side of the moraine to the glacier. That’s what I was aiming for. As I got close to the other side, I realized that there were no more water sources…they were all under the ice. Dang it…I guessed wrong on that one. I kicked myself even more realizing that I didn’t need to even filter down here…just collect the water and go and filter later, so the stop time earlier would have been very minimal. To further my challenge, I realized as I got closer to the other side, that I could no longer see the diagonal trail I was aiming for, as I was too close to the side to see it. I had it on my GPS track, but I needed to hit it exactly. Was it not as defined down here and I just need to start going up? Or have I missed it? I was not in the mood at this time of the day after the very challenging day of hiking to play this game. I started angling up and it just didn’t feel right. So I cut back the other way hoping to run into it on my perpendicular angle. Fortunately it wasn’t long and I hit it…whew! Once I was on the use-trail, it was a piece of cake to get quickly up to the top of the moraine. Here is a picture looking back from where I came. You can see the base of Mooney Point where I started the crossing on the ridge on the right side of the picture, just below the cloud there on the far right. The drop-in there looks worse than it was, but that gives you an idea why I wasn’t a huge fan of that part. Here is a video clip of the Eliot Glacier crossing. 2018-09-14 2MHHR11 Eliot from Michael Irving on Vimeo. It took me an hour and ten minutes to get from the top of the far moraine to the top of this one. A little more than half of that was simply getting down to the glacier on the other side. From here it was a stroll in the park for ten minutes to contour over to the Cooper Spur Shelter. I got there at 7:40pm, which was only ten minutes before civil twilight, which then requires a headlamp. Did I mention that it was about 35 degrees and 20mph winds too? I’ve never been so happy to see one of these shelters. I would have been fine without it, but this would make my night a WHOLE lot more pleasant! There is a heavy mat hanging in the door entry that is flexible to allow entry/exit, but it’s firm enough to help block the weather to keep it out as best as possible. 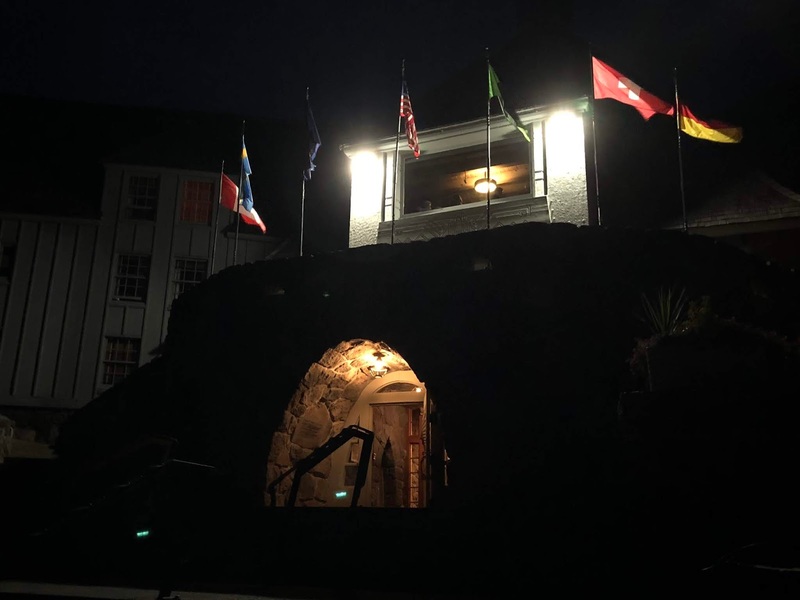 I got inside on its dirt floor and was so happy to be here. It was 7:40pm and I had hiked a grand total of only 10.1 miles today in 13 hours and 10 minutes. Wow! That is 26.3 miles for the hike, and a pace today of a whopping 0.77 mph. The crazy thing is that I pushed HARD all day with heavy breathing on all of the climbs. You can see why I thought that today was the hardest hike I’ve ever done in my life. It was also the most epic hike I’ve done in my life so I guess you get what you pay for. I laid out my tent and staked the corners to use it as a tarp to sleep on top of. Here’s my setup. I was a little chilly in the night last night, so tonight I’m going to wear my long underwear, down jacket, down pants, fleece jacket and rain pants and my fleece hat, inside my 15-degree sleeping bag. Here’s my setup. Here are my sorry-looking trekking poles. They are breakaway z-poles with a cable inside to connect time tight, so I had simply folded the broken part back over the rest of the pole and used duct tape to strap it to itself. That worked reasonably well. Now that I was in camp, I pulled out my tiny knife and cut off the cable to amputate the broken appendages. This was fine, but with the cable severed, there was nothing holding the remaining pole segments together…so they just fell apart. Oops. Never fear…I always carry Super Glue with me in mini single-use packs. I glued those suckers together to cure overnight. That’ll solve that problem! As I cooked my freeze-dried dinner (dang that tasted so good! ), I used up the last of my water. I was fine for the night, but I had a pretty good climb in the morning with zero water to drink. I wasn’t really worried as it’s not exactly hot out here, but I knew I’d be ready for a long drink once I got to water! I went outside just before bed and was a little surprised at how bright and numerous the city lights were from Hood River and The Dalles. I think during the day the views of those cities are washed out by the bright sun, but at night they really shined through. It’s time for bed! As mentioned earlier, the only thing I’d change on this segment is to drop down to the glacier quicker, and pick out landmarks of the moraine trail on the other side so that it’s easier to find once over there. Everything else was perfect I think. As I lay in bed, recapping my day, the wind died down almost instantly. At about 9:30 or so it was like someone threw a switch and shut off the wind for the day. The 20 mph winds went to dead calm. In my shelter it didn’t matter much, but it was nice that it would make for a quiet and peaceful night. Good night from the cozy shelter on Cooper Spur! Wow! What a day. 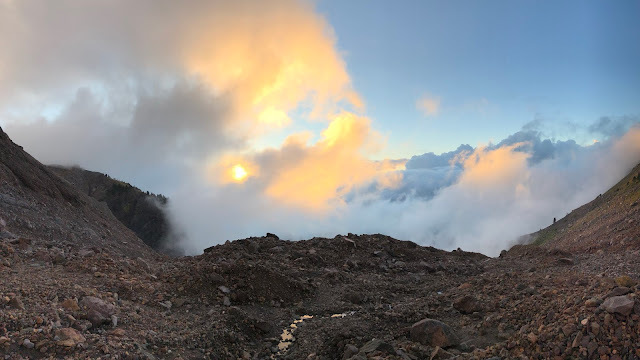 My hardest day of hiking ever and my most amazing day of hiking ever, from dawn to dusk at a blazing pace of 0.8mph and breaking both of my trekking poles! I was exhausted and so glad to have the shelter to be in tonight. It was my 5-star hotel...well...I guess there was no turn-down service, so maybe only a 4-star. Ha! 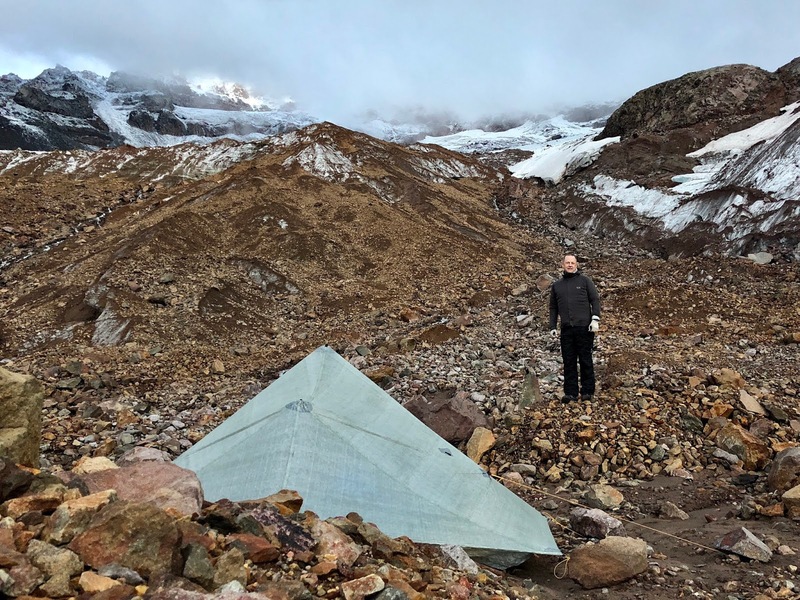 Finding a better route up to the Langille Glacier, crossing the Eliot Glacier, and getting to camp in the Cooper Spur Shelter instead of being in the 35 degree wind without a proper trekking pole to set up my tent. 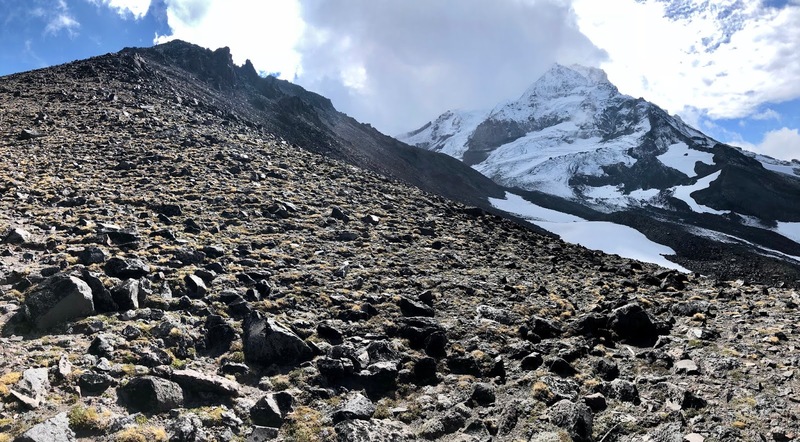 Breaking both of my trekking poles and the tough descent into the Eliot Glacier. Verizon Cell Service: LTE in most places except dropping down to Newton, Clark and White River. I was up at my usual pre-dawn hour. 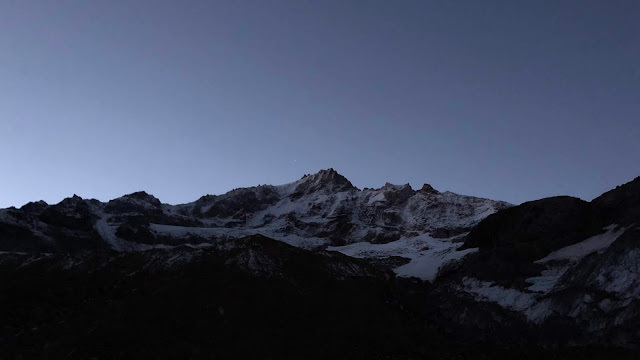 The only downside of sleeping in the shelter, is that you don’t get to see it get light and transition from dark to morning. That’s okay, that was a price I was willing to pay! With no tent to breakdown, it was a simpler morning to get ready. I was all packed up and ready to go (with no water) just before 6:30 to start my final day. I was pretty motivated to get going and get this thing done to beat the weather. I started straight up Cooper Spur, but before long I was in the familiar switchbacks that methodically make their way up to the top. It was cool to see down the Columbia River from this height. Again…this is a bit of a unique sight as the bright sun during midday usually washes out this view. 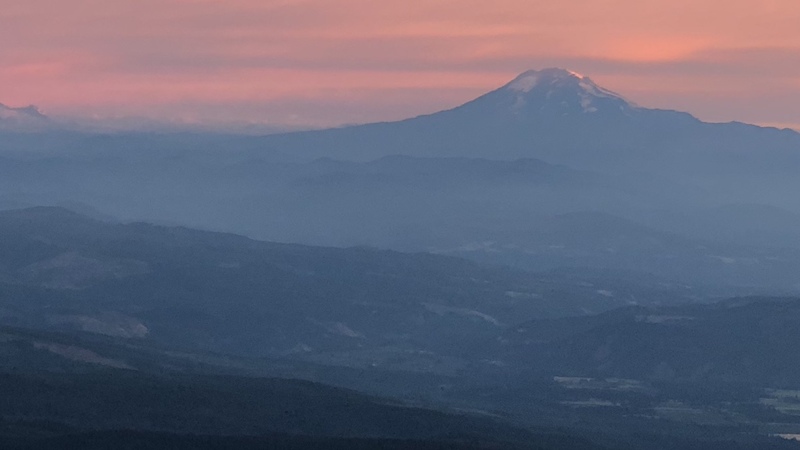 Mt Adams was looking good in the morning light. 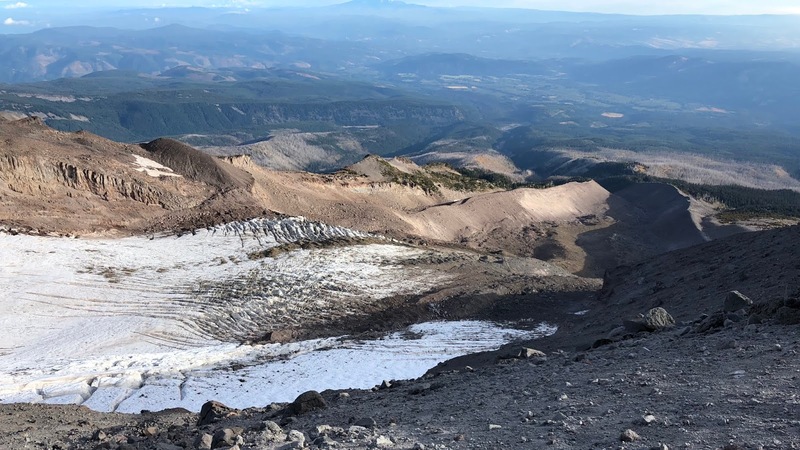 You have to look hard at this one, but that is Mt St Helens just in from the left edge, Mt Rainier the the right of center, and Mt Adams on the right, with Eliot Glacier in the foreground. 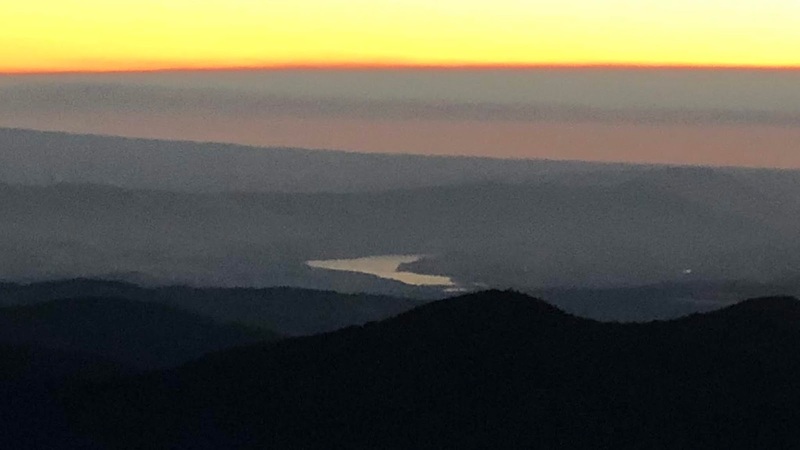 Here comes the sunrise, with the Columbia River on the far left. 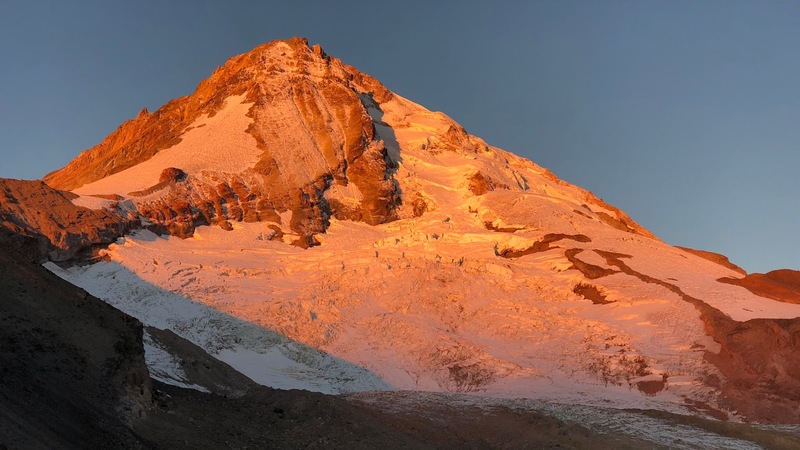 The morning light on Mt Hood and upper Eliot Glacier was beautiful in the golden hour. This is looking out across Eliot Glacier, with Mooney Point on the far right, which is where I cut into the glacier just below it. Here is a video clip of the area. 2018-09-15 3MHHR1 Cooper Spur Eliot from Michael Irving on Vimeo. Looking down this picture, you can make out the switchbacks that I had been climbing. The Cloud Cap Inn is also in here on the far left, right where it transitions to green in the background of the picture. 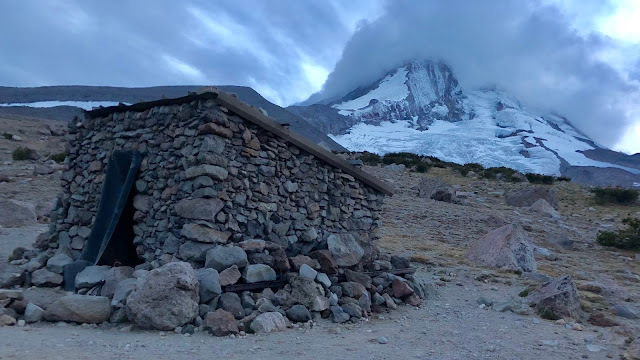 At the Cooper Spur peak are several campsites protected from the wind by rock walls that have been built-up by campers. 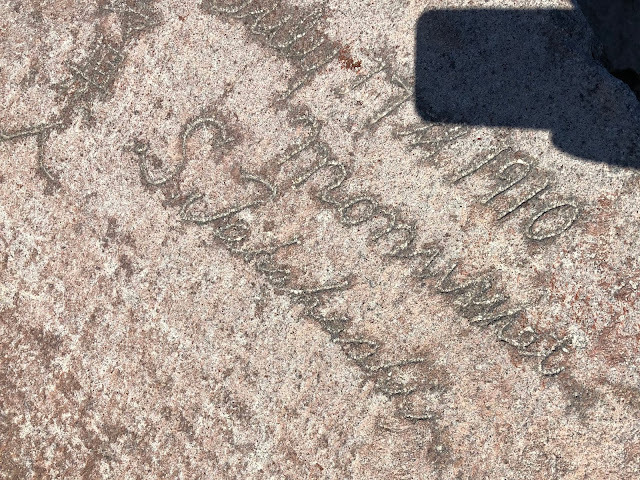 There is also a very cool rock with a Japanese inscription from 1910. I’d have loved to have heard the story behind that one. Graffiti is only cool if it’s over 100 years old! Ha! From here, you can still go a bit higher on the spur before it turns into ice. That’s Eliot Glacier on the right and Newton Clark Glacier on the left (2nd largest/245 acres). 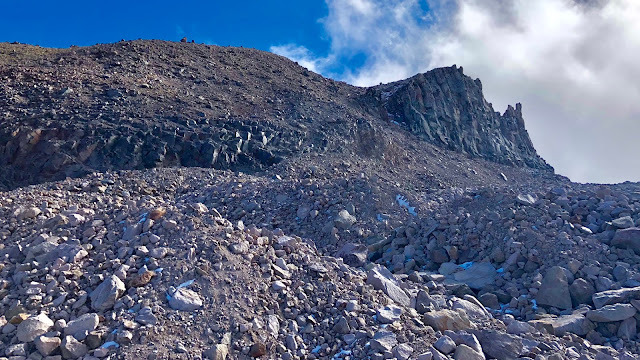 I continued up to just past that big rock on the crest of the moraine, which I think is the one nicknamed “Tie In Rock” that signifies to the climbers that it’s time to rope-up and tie-in to each other for the steep, glacial ascent to the top. It was windy and cold up here, so I decided it was time to turn around and continue my journey. In the future, with better weather, and without my time crunch, I’d probably go on up further to where the snow starts…but not today. I went back to the primary peak of Cooper Spur where the camps and inscription were located. The elevation up here was 8,500’. Here is a video clip of the surrounding view. 2018-09-15 3MHHR2 Top Cooper Spur from Michael Irving on Vimeo. and to the right, down Newton Clark Glacer…where I’d be going next. I got here by 8:00, which was 2.0 miles into my day and 28.3 miles into my hike with a pace today so far of 1.3mph. I dropped down Cooper Spur just a bit to take the steepness out of the side hill and then I went straight down the the side which was pretty easy going. This was new terrain for me as I hadn’t scouted this route before. 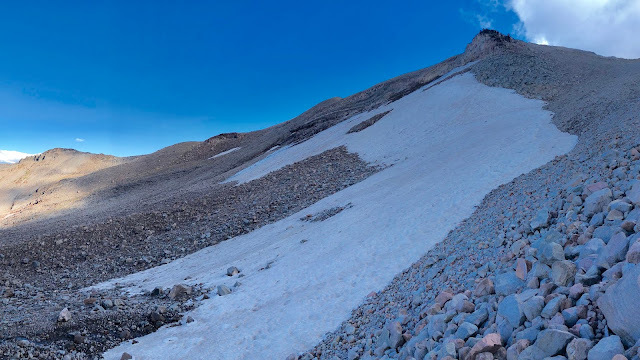 At the base of the steepest part, I checked my new angle of view up the Newton Clark Glacier to the summit. As it flattened, there were a few options for camps in here…and I heard water! After two hours of hiking, I’d get my first water for the day. I won’t need ice cubes for it either. Here’s the view up from my water source. I followed the stream down to a pancake-flat area that was eerily perfectly flat. I waltzed down to the end of it to look over the edge. I was fortunate that I was in pretty much the single spot that had a pathway down to the next tier. There was a short, but steep section, with some grass in it to stabilize the surface. I scooted down to get down to the next flat area. If this had been a longer drop, it would have been a bit sketchy, but it was so short, that it wasn’t a big deal. This is another area that would be easier going the other way I think. 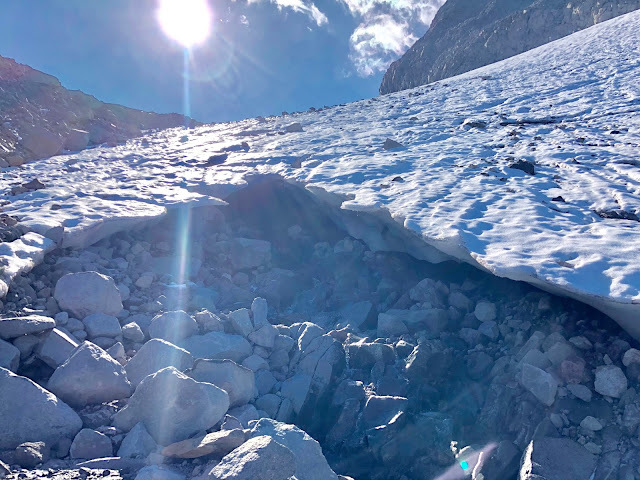 Before dropping down I could see the glacial ice and its overhangs with rocks over the top of it…another deceptive section where you think you’re on ground when you’re actually on ice. Hey…happy birthday! 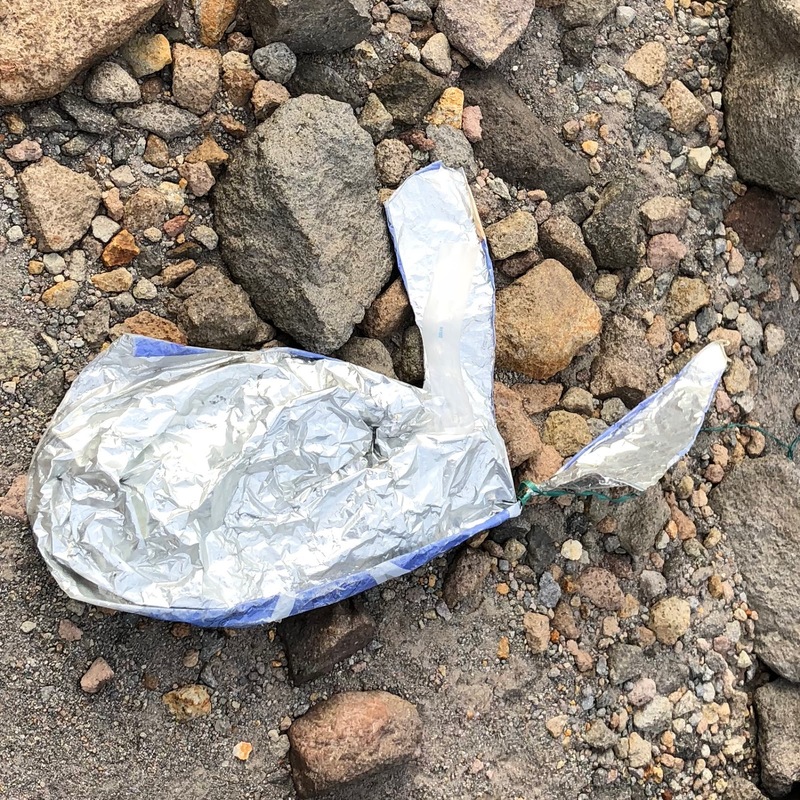 Here is exhibit A of why it’s not a great idea to release balloons into the sky, as it’s basically another form of littering. I stuffed this in my pack pocket to throw it away later. I crossed this snow field which was not steep and frankly a nice break from the rocks. Here’s another view up top-side. I then arrived at a very cool find! I was quite happy with this new path and its interesting features. 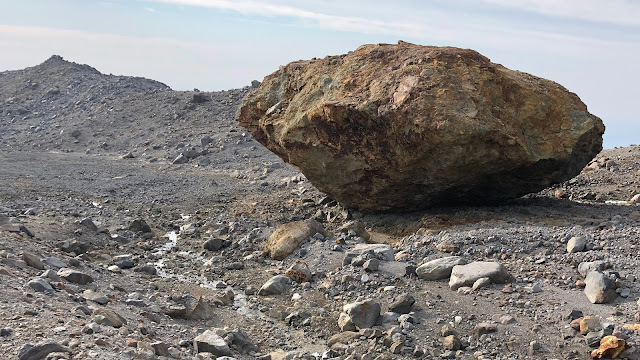 Not knowing if this massive rock has a name, I called it “Spaceship Rock” as it is massive and looks like an alien spaceship that has landed on earth. You can see the creek running by it and what I called “The Football Field” to its left, which is an even bigger, totally flat field with only pebble-sized rocks on it. This rock was something like 30’ tall. Here is another angle of it, looking up to the mountain. I crossed The Football Field and went through the end zone to look over the edge. 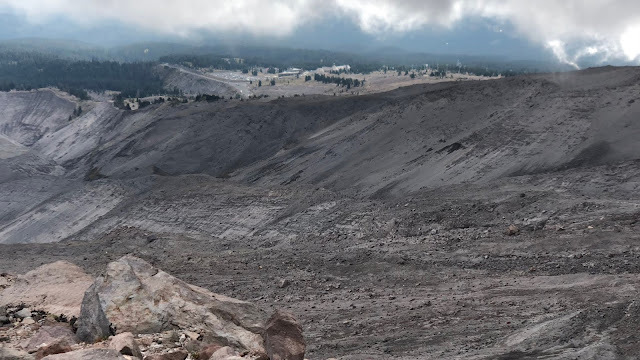 Here is the view behind me…you can see Spaceship Rock on the other end. I cut over to the next ridge, climbed up a few feet to its crest, and got my first good view down Newton Creek canyon. 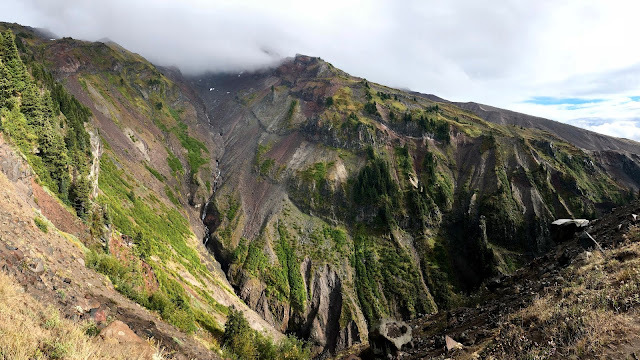 This is a massive canyon that I’ll be crossing way down below on the Timberline Trail. I also noticed that it was starting to get smoky from the forest fire smoke. I was glad that I was able to get so many clear pictures early in the day before the smoke cropped up. Here are the views looking upward…not an easy route to get over this canyon. I’d be interested if there are any known routes across that are in the scope of the sketch-factor of this hike, but I’m guessing not. I cruised easily down the ridge line and hung a left to hop across some of the headwaters of Newton Creek, just above a waterfall that was maybe 15-20’ tall. On my GPS track, you can see a little spur trail to the base of the waterfall, but I realized I’d have to climb back up on the other side, so I opted to just cross above it. It might be a nice spot for a break on the bottom side of the waterfall for a nice view. Here is where I crossed. And here was the view down the canyon. 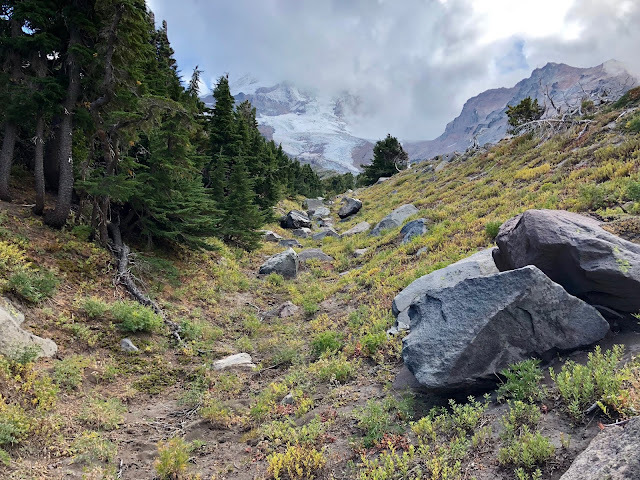 I contoured along the hillside and found a nice tree-free path up out of the wash. As I was beginning to drop below timberline, I had to start paying attention to trees impeding my path again. 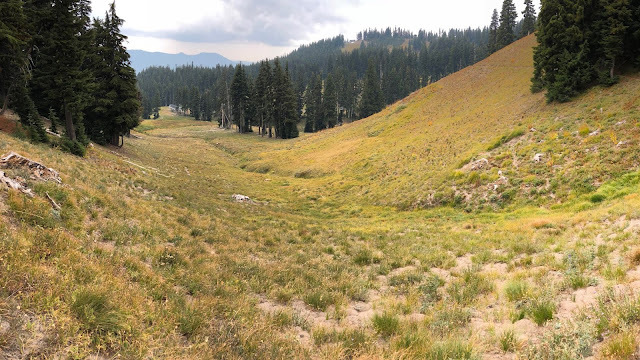 At the top of the wash was another surprise…a beautiful high-mountain meadow! It’s very odd to see that in this desolate part of the mountain. There was also a campsite or two right near the meadow at the top of the unmarked hill. Gentian were the only flowers I saw today. 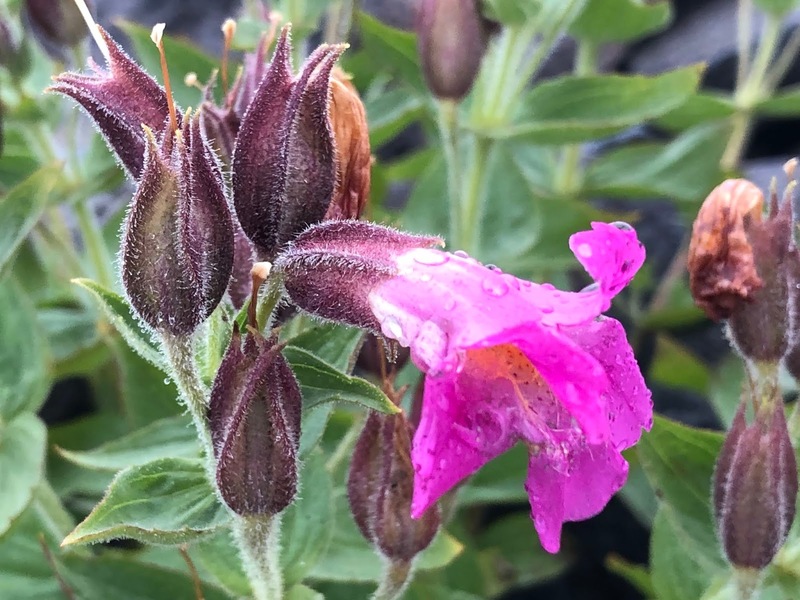 It was odd to me that they appeared to just be blooming…as we were entering the fall season. From the meadow and hill-peak, I pretty much dropped straight down, winding through a few scrubby trees, to intersect with the Timberline Trail. I was looking forward to some cruiser hiking on real trail for a bit. I got here at 9:50, 4.5 miles into my hike for the day and 30.8 miles for the hike at a pace today so far of 1.4mph. It was time to motor on an actual trail. It wasn’t long until I saw the first people I had seen in the last day and a half. They were loopers that were doing the entire trail in one day. They looked awfully cold in their running gear in this cold wind…and it seemed that they were late in the morning to only be this far…but whatever, we all do our own crazy things. I quickly got to Gnarl Ridge, which is one of my favorite views on the Timberline Trail. This is looking up Newton Canyon. You can see why I opted to drop low to cross it. If you look really close at the bottom of the vertical green band on the right part of the picture, you can see the waterfall that I had crossed just above about a 1/2-hour ago. Here’s a closer-in shot so you can see the waterfall in the dead-center. This point at Gnarl ridge is very exposed and gets lots of wind. I love this cairn. It used to be a 4x4 post. 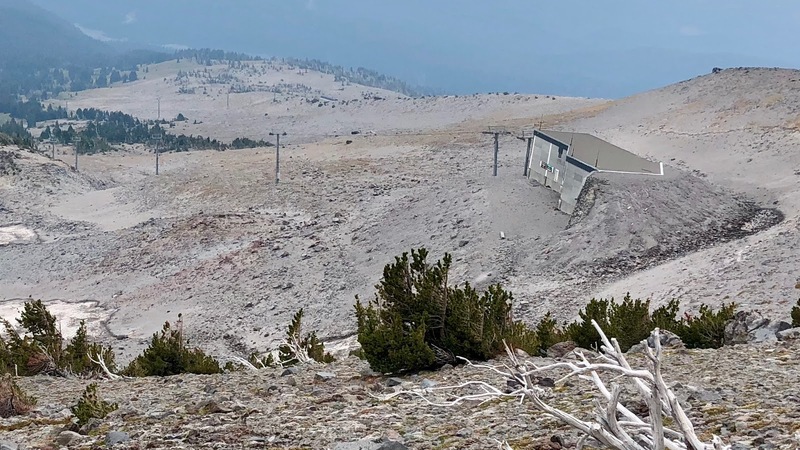 Check out what the wind and snow have done to it. Here is a video clip of the surrounding area. 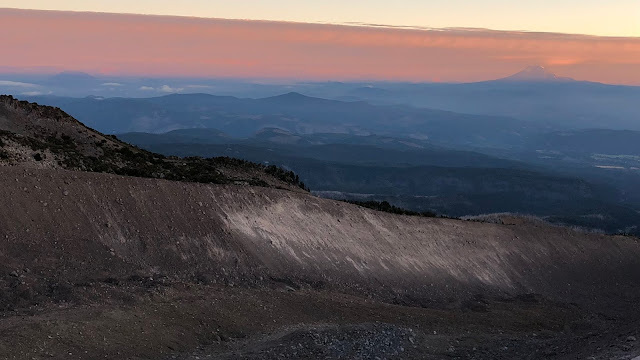 2018-09-15 3MHHR3 Gnarl Ridge from Michael Irving on Vimeo. You can see how Gnarl Ridge got its name. 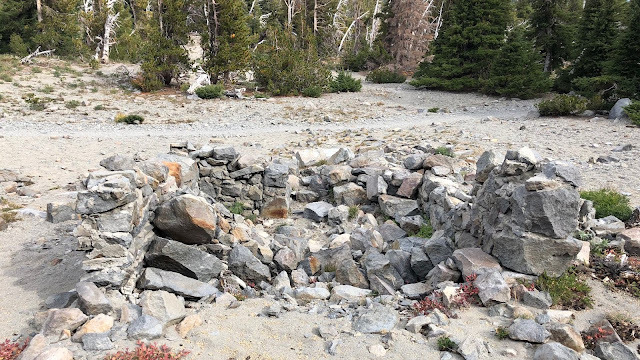 I dropped elevation down the ridge and passed another of the famous stone shelters built by the Civilian Conservation Corp (CCC) back in 1934, the year the full Timberline Trail was opened, also finished out by the CCC. This one collapsed many years ago and this is all that remains. The one in Paradise Park also collapsed. That leaves the remaining standing ones at McNeal Point, Cairn Basin and Cooper Spur. I’m afraid all of these will be distant memories in the years ahead. I’m glad I got to experience a night in one of them finally. As I approached the lower crossing of the crest of Gnarl Ridge I saw someone sawing in the distance. I was thinking, “What the heck is going on, is someone getting carried away with building a shelter for the night??" It was actually a Forest Service Ranger making a new trail sign for this intersection of trails. 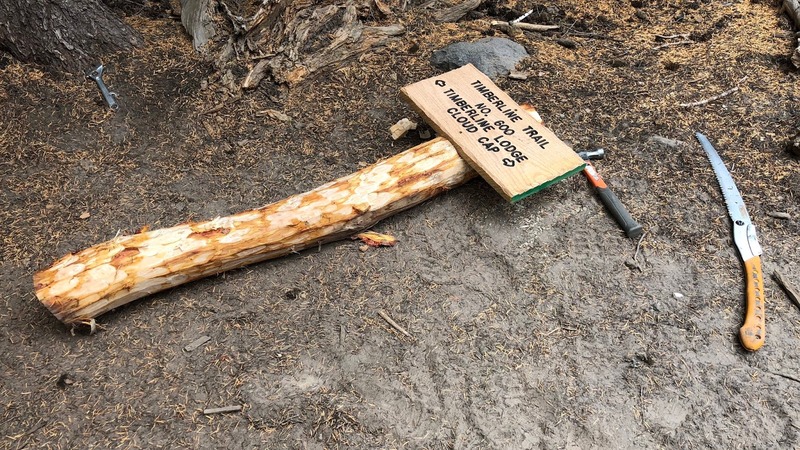 Being that we are in the wilderness, they can only use non-powered tools, so he was using a hand saw, a chisel and a hand-drill. It was fun to see this craftsmanship in action. I thanked him for his work and continued down to Newton Creek. I finally made it to Newton Creek where I had lunch and resupplied my water. This is looking up the canyon. I was way up on that farthest crest earlier this morning. 2018-09-15 3MHHR4 Newton from Michael Irving on Vimeo. I left the creek to climb up and over the next small ridge to get to Clark Creek. Fall is definitely here. This is looking back at the cliffs leading up to Gnarl Ridge…another example of why I chose to drop low to cross. Just before the first major switchback to get to the crest of Newton Ridge (what I’m calling this nameless ridge) I looked up the hillside toward the summit. 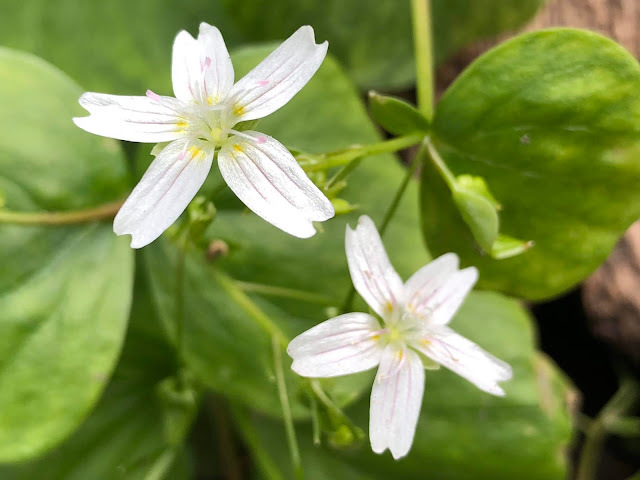 It is pretty much a meadowy type surface with grasses growing out of it and not too steep. I was thinking that it would be easy to cut the angle to the top and then I could more directly get over through the upper parts of Clark and Heather Canyons. My memory reminded me though that the other side of this giant moraine is desolate, unconsolidated rock that is I think a bit steeper than this side. My sense was that I better not go that way and to continue with my plan. As I dropped down into Clark Canyon and Clark Creek, I could see the Heather Canyon chair lift that serves Mt Hood Meadows. Heather and Clark Canyons are my favorite places to ski in Oregon as they are technically in-bounds, but have a back-country feel to them. I was really interested in the view to the Heather chair as it had no chairs on the cable and looked like maybe new lift towers. The top station looked the same though so I’m not getting my hopes up. This is an old fixed-grip chair. I’d love it if they converted it to a high-speed detachable chair, and/or at least added a half-way on/off point at the base of Shooting Star to shorten the trip back up to the top of the canyon. It’s a 3-chairlift process to get back to the very top of the canyon currently, so any improvements would be nice. They might just be doing routine maintenance on the cable…we’ll see! Here is the view across the canyon and up Heather Canyon. All the ski bowls drop down that talus from the ridge. There are 5 options to do this next part and I’ve done 4 of them. 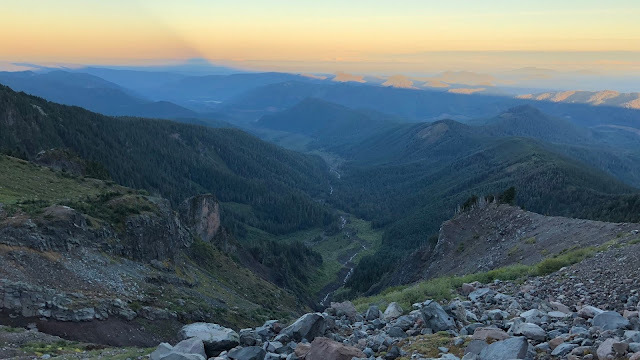 In the picture below you can see Clark Canyon to the right, The Hinterlands along the crest in the middle, Heather Canyon to the left and Shooting Star Ridge that runs along the top of Heather. 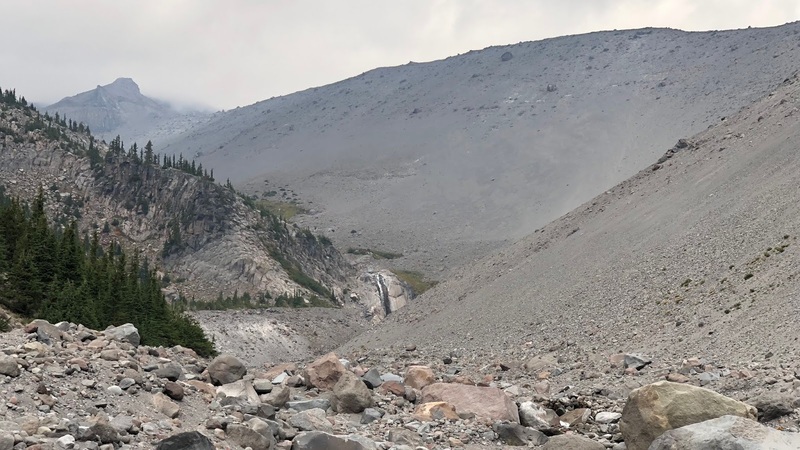 This picture is dedicated to Clark Canyon where you can see its waterfall and the steep, desolate, unconsolidated slope of the Newton/Clark Moraine that separates Clark from Newton Canyon. I will list out the options from right-to-left. Use the idea I had as I climbed out of Newton Canyon to continue up the slope at the first major left-switchback, up the meadowed slope to its crest. Cross the crest in the picture directly above about at the point perpendicular to the waterfall. Drop down the unconsolidated slope into Clark Canyon, hop over Clark Creek (which is a snow bridge into the late summer) and then head up the Hammer Bowl area up to the top of the Hinterlands crest, down and angling up to Heather Canyon to the base of A-Zone and then up A-Zone, which is the top double-black-diamond run at Mt Hood Meadows at the top of the Cascade Chair. I have not done the moraine crossing described in the first part of this up-and-over the Newton/Clark Moraine. As mentioned earlier, it looks too sketchy to me, but sometimes these look worse than they really are. I’d be interested if anyone else has done this traverse and what they thought of it. Go directly up Clark Creek. Just before reaching the falls there is a trickle of a stream coming down the Newton/Clark Moraine. This stream has eroded the loose sand and rock out so that the footing going up the stream is pretty good. It’s a scramble to get up the creek for about 100’ to get out of the bottom of Clark Canyon. 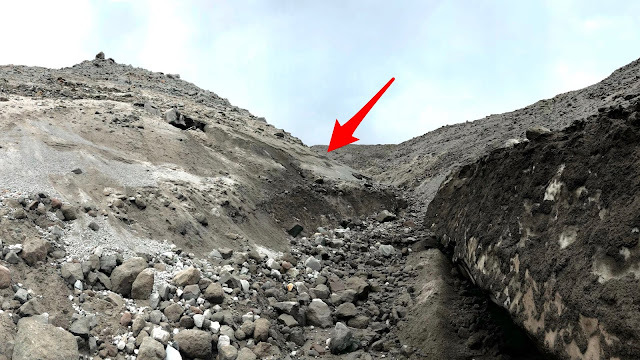 This feels pretty sketchy as it seems like a loose rock from the unconsolidated slopes above could come barreling down at any time. After going up about 100’ or so, you ease out of the creek trickle and on to the side slope. It’s just barely not steep enough to call sketchy. Having said that, I kept looking up-hill to make sure there were no rogue rocks careening down my way. this curls over above the waterfall where you can jump Clark Creek and continue on up Hammer Bowl as described in Option 1. Again, Clark Creek has a snow bridge into the late summer, so beware of that, and remember you’re above a tall waterfall. I did this route last summer and it felt pretty sketchy. It as super slow-going and I vowed never to do it again. I don’t recommend it. Go up the Hinterlands crest. This is a pretty good option. it’s a bit steep on the nose of it, but it flattens out as you go and as you get to more of the proper ridge line the footing also gets easier as you go above timberline. Up at the top of Hammer Bowl continue over to Heather Canyon as you would in option 1 or 2. I did this route coming down last summer. It’s a pretty good route and a solid option depending on your ability to get up (or down) A-Zone. This option is to simply go up Heather Canyon before crossing Heather Creek and its large waterfall (going clockwise). Start going up the canyon. There is a bit of a use-trail as you start, but it quickly gives way to thick 1-foot deep brush that you have to slog through. I stayed just a little high on the side to stay out of Heather Creek. It gets better the higher you go. 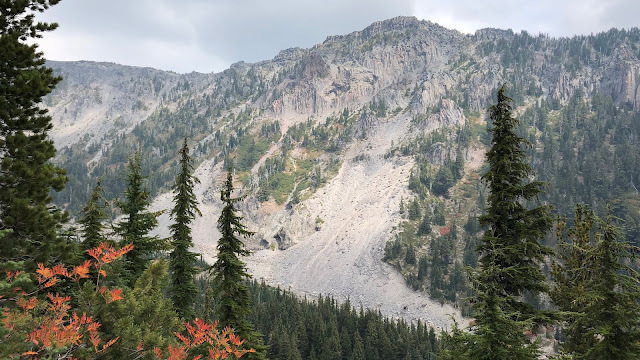 When I did this route last summer, about midway up, I finally dropped down onto the snow that was still present in the base of the canyon (about 6 weeks earlier in the summer than this hike). 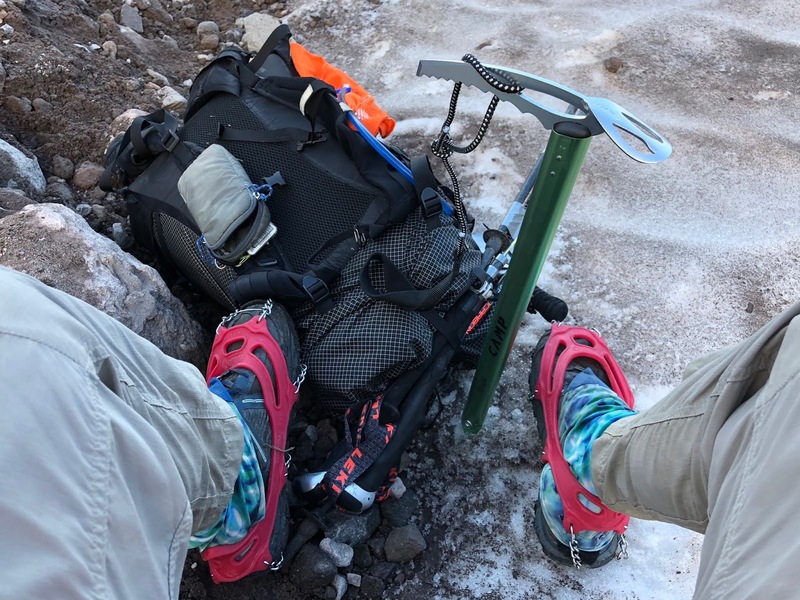 I put on my micro-spikes and really enjoyed the relatively easy climb up the rest of the canyon, on the snow, to the base of A-Zone at the top. I kicked steps in the soft corn snow to get up to the top of A-Zone. 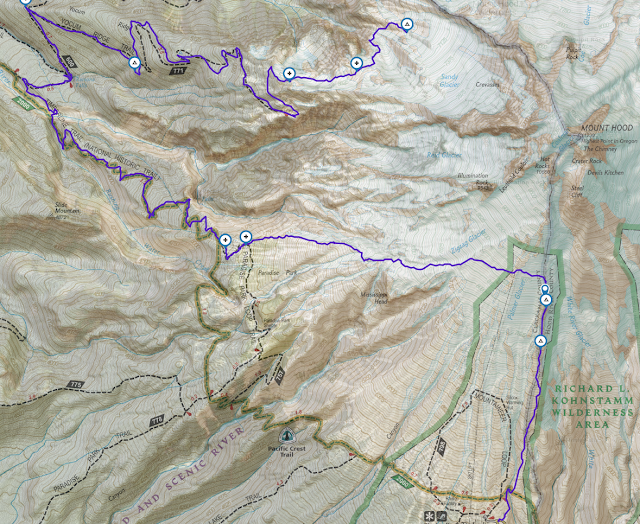 My sense is that without snow cover, it would be too unconsolidated in the rocks to make this a practical route. Could it be done? Maybe? Would it be fun? Probably not. For this reason, currently, my recommendation is to only do routes 3 and 4 if there is snow pretty much all the way to the top of A-Zone and that you use micro-spikes and an ice axe as it’s pretty steep…let’s be honest…it’s a double-black diamond ski run. (One of my favorites!) I don’t think you’d die if you slipped and tumbled since it runs out into the flats at the bottom (YMMV), but it would not be a fun experience, so take your spikes and axe! I would have chosen this option if there had been snow in A-Zone. 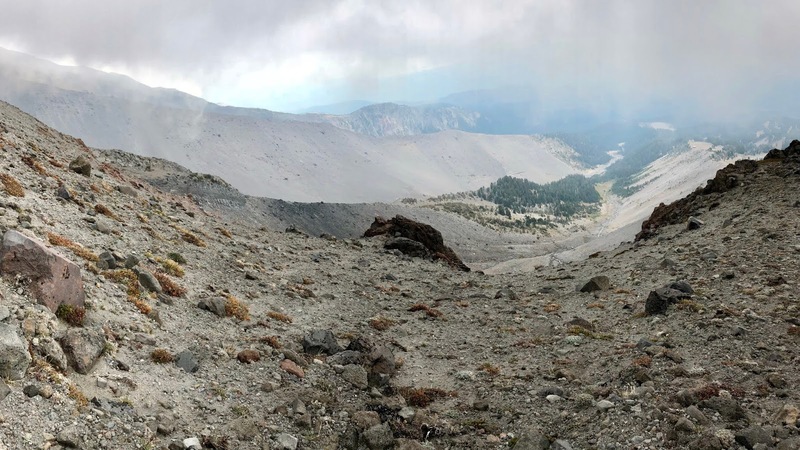 This is the new option that I did on this hike, which is not the most exciting option, but certainly the safest and most predictable by a long shot. After getting water at the Heather Creek waterfall, I continued through Jack’s Woods (another one of my favorite runs to ski with fresh snow through the trees). Through the trees I could see the Timberline Trail on the other side and where it had been routed up and over a small landslide that had happened in the last year or two. 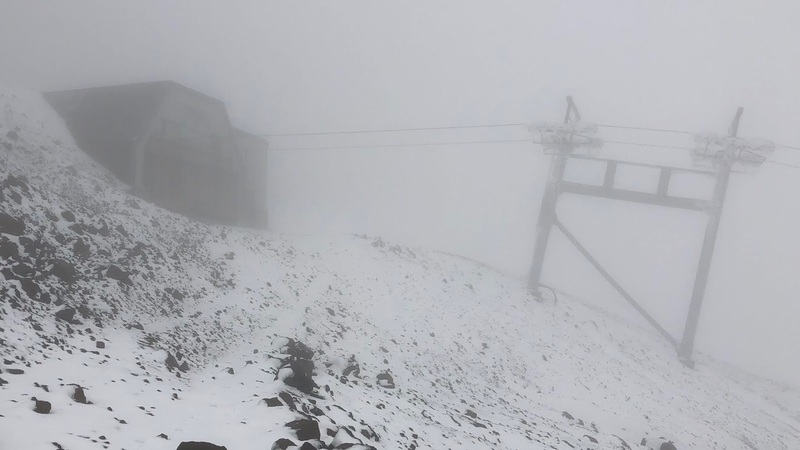 I was quickly up to where the Timberline Trail spills out almost at the base of the Shooting Star chair lift. This is looking down to the base of Shooting Star. I got here at 12:50pm, 8.9 miles into my day and 35.2 miles for the hike, with an average pace today of 1.7mph so far. I turned up the Columbia ski run to finish out my “Option 5” route. Columbia is a black diamond run, but it’s not very long, so I made my way up the grasses up to Shooting Star Ridge, which is a blue run. Going up the ridge was pretty easy and comfortable on this wide ski run. I got up to the top of it near the top of the Shooting Star chair lift. Skiing anyone? These are two of the runs that go down the moraine to Heather Canyon below. I left the ski run and continued straight up the ridge line. It wasn’t long until I got to Memorial Bowl. I now know how it got its name. I had never seen this memorial before. It’s probably easily buried in the snow for the majority of the winter. I marked its location on my GPS track for reference. Here is the view looking up to the top of Heather Canyon. You can see the creek running up and then where the canyon curls to the left at the head wall and into A-Zone. That’s the Hinterlands ridge on the uphill side of the creek on its other side. Then I got to the top of the main Mt Hood Meadows ski area at the top of A-Zone and looked down into the top of Heather Canyon. There indeed was no snow on its slope. I’m glad I went the way I did. This is definitely my recommended route for no snow on A-Zone. With snow, I’d opt for the Heather route first and the Hinterlands route second. 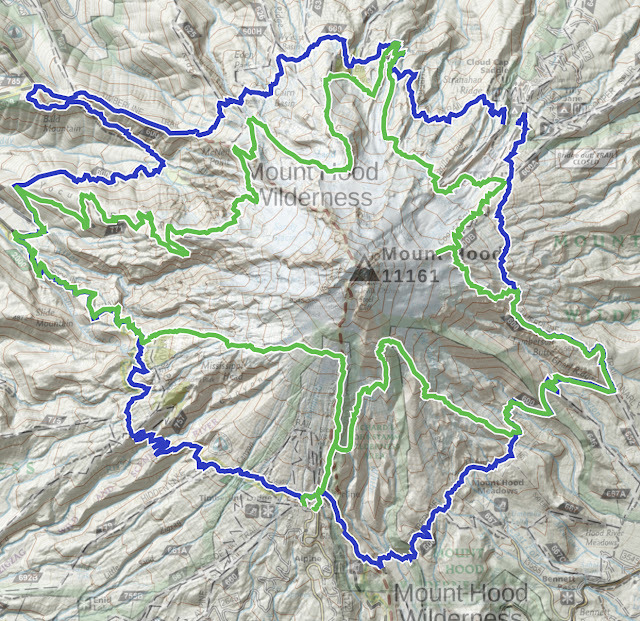 I would not do the Clark Canyon route and I don’t think I’ll even attempt to do the Newton Ridge route unless someone convinces me otherwise. Here is a video clip to get a better perspective on A-Zone. 2018-09-15 3MHHR5 Meadows from Michael Irving on Vimeo. 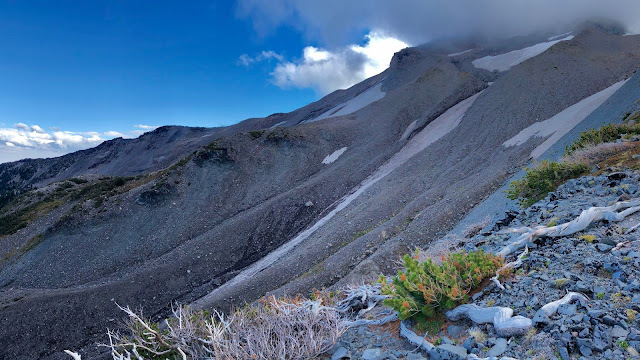 It was a bit too steep to continue straight up the ridge, so I contoured over and up a bit for a few hundred yards toward the Cascade Chair top station and then curled right to go straight up the slope to regain the ridge line that I had left momentarily. This piece was kind of interesting as it was mixed terrain that made for pretty easy footing albeit on a steep slope. I turned around to get a view of the top of the Cascade Chair and looking off to Vista Ridge. I continued straight up the ridge line to where my ridge eventually combined with upper Vista Ridge at about 7,900’. This is looking down the Super Bowl run that is only open a few days a year and requires avalanche beacons, probes and partner skiing. That’s Clark Canyon on the left and Heather Canyon on the right. It was really getting nasty. It was now 30 degrees with about 40 mph winds in the fog. It was pretty rad. Ha! I think the worst part about hiking in the wind for me is the noise…it’s SO loud! 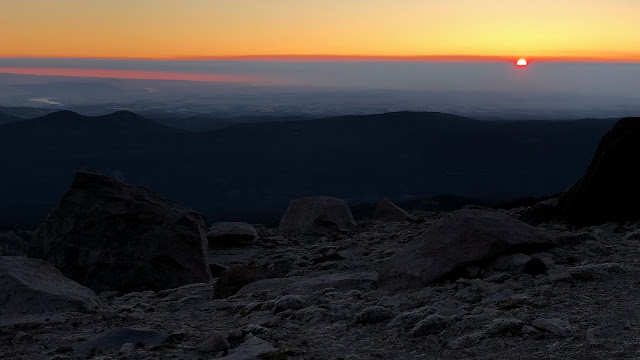 2018-09-15 3MHHR6 Above Meadows from Michael Irving on Vimeo. 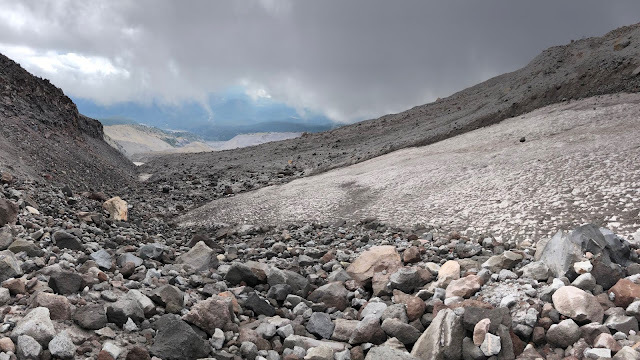 I got up to 8,575’ where I was able to cross the snow chute to my left with out any snow anymore and without a major dip down-and-up as I traversed. 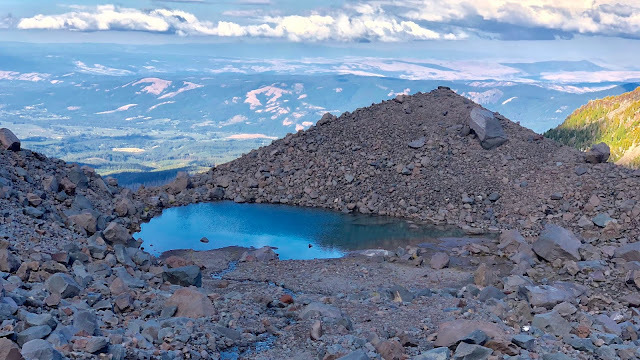 In my scouting hike last year I went up to 9,000’ which was where it noticeably transitioned to a steeper, more mountain climb slope, so that’s about as high as you’d want to go with the scope of this hike. 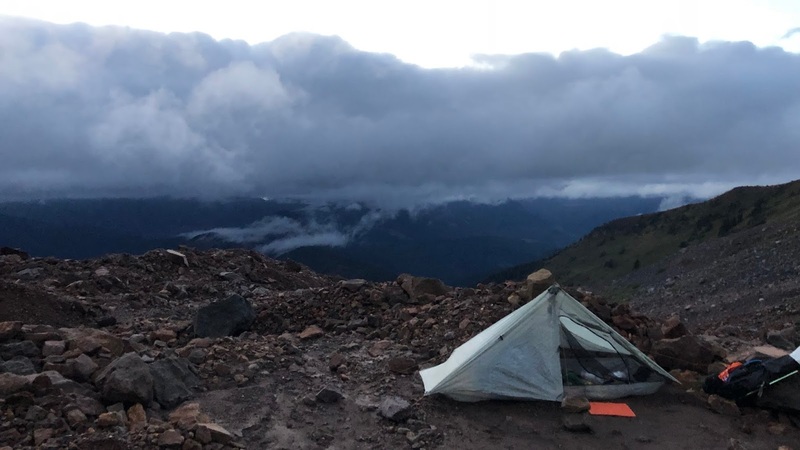 As I contoured over to the next ridge, I actually came across a nice depression in the mountain with a sandy base that would be pretty nice for a camp. It was actually protected from the wind and it looked to be a pretty nice spot to have a high camp for the night. This was my high-point for the entire hike. I got here just before 3:30, 11.1 miles in for the day and 37.4 miles for the entire hike. My average pace today at this point was 1.2mph. I cruised down my ridge pretty easily. I found a big rock to sit on its leeward side to get reprieve from the wind while I dumped out the scree and sand in my shoes. I wear gaiters, but I was really putting them to the test as I plunge-stepped down through the small scree/sand. Just a few steps more and I was at the end of the ridge on a point. You can’t go off the point as it’s cliffed-out. I did what I did last summer, which was to cut back toward the mountain peak as I dropped off the side of the point through rock/shale to the base of the chute next to it. I came down the red line roughly. It looks worse than it was, but it wasn’t awesome, it felt okay. Once at the bottom, I looked up the small ridge on the other side of the snow chute. I wished I had done it as it appears to be the better route. My recommendation would be to take this route going either direction (YMMV). I’d love to have input on this ridge if anyone has any. It really doesn’t seem that steep. Once here at the bottom, I flipped back to go downhill across this patch of snow. 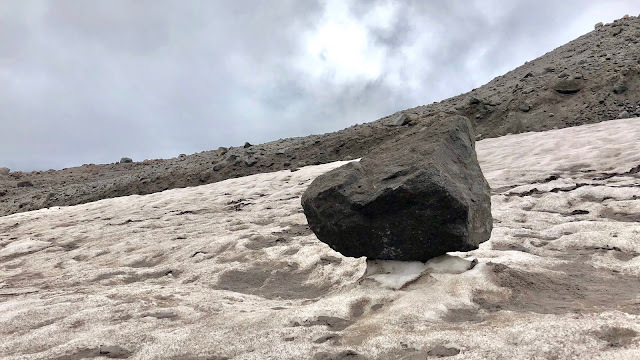 It’s always fun to see rocks perched on snow that has melted-out around it. 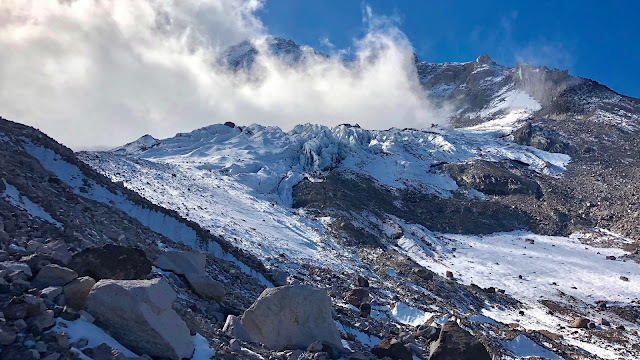 As I entered the glacier it was similar to Eliot in the sense that I had to find my way up and over with some slight ups and downs to find non-steep pathways over the mini-crests as I went across the glacier. It was pretty routine (YMMV). Then I saw a good-sized piece of metal! 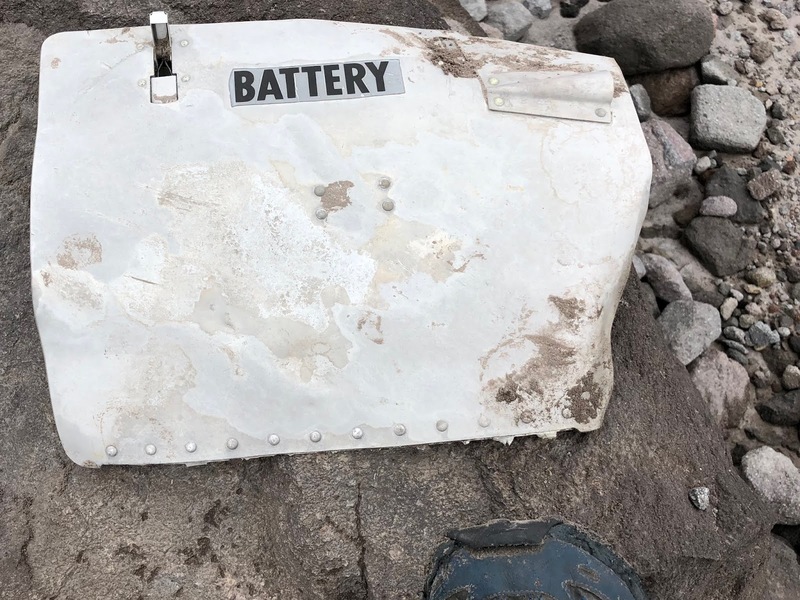 I examined it and saw that it appeared to be an airplane part. Due to the raised rivets, I’ve been told, it’s likely from a small aircraft. I did a cursory search around it in a circle and did not see any other parts. It seemed to be just setting on top of everything as if it fell off an airplane flying overhead. 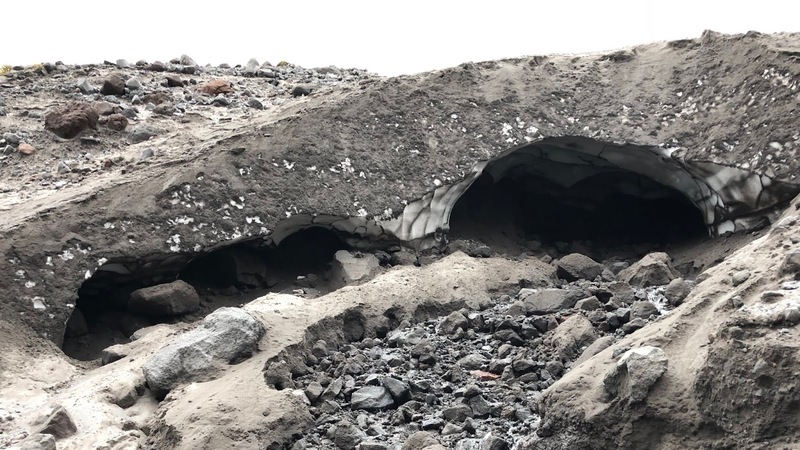 No part of it was wedged into the glacier itself. The picture has my trail-runner shoe in it for perspective. I continued crossing the glacier. I had to go up and down some mini ridges that were all generally fine. On one of them, I slipped my step a bit, even though I was using my “trekking canes”. Guess what I heard next? Yep…SNAP! I somehow managed to break one of my already broken trekking poles again! I didn’t really need a “trekking baton”, so I just stuffed both of them in my pack and used my ice axe instead. 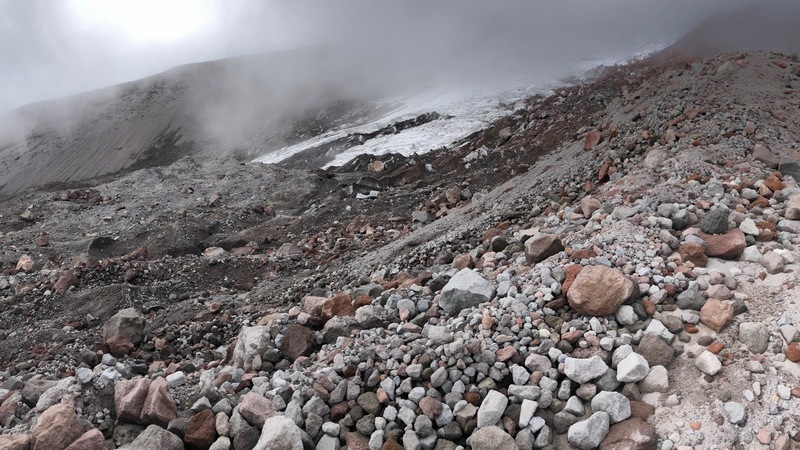 Here is a view of the area with some glacial ice views above. This ice was some of my favorite on this glacier in regard to its formation. 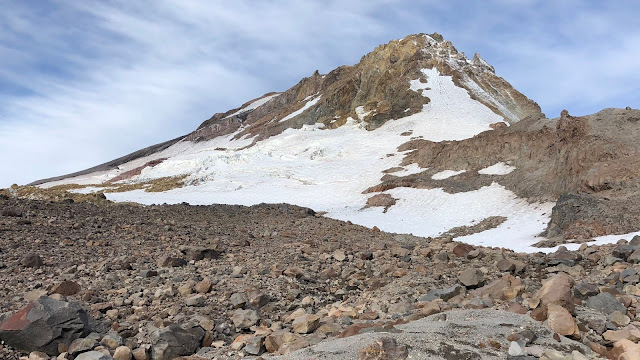 My original intent was to go down the crest of the moraine closest to the exit point to Timberline Lodge. As I started down towards it I encountered a wash that curled off to the right and down to the creek bed of the White River. it looked so gentle and perfect to get down into there. I was a little worried that the moraine would be too steep to get off of and I’d have to backtrack and I really didn’t want to do that at this point of the day and really wanting to get this thing done. 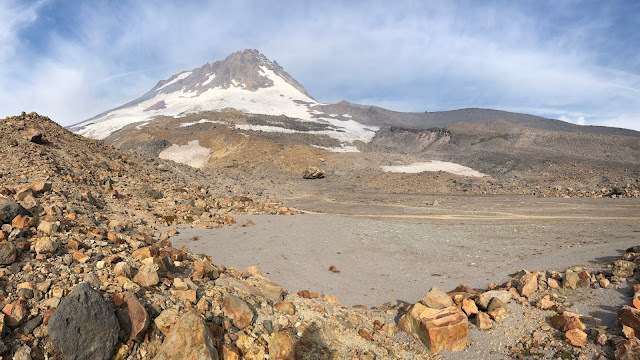 When I scouted this last year I went down to the Timberline Trail along the east side of the glacier, so once I started crossing the glacier it was all new terrain. I made the decision…down I’d go to the creek bed on this nice gentle descent. Well…it started out nice, but once I got to the creek bed, the last drop-off into the creek was a bit of a doozy. As you can see in my GPS track, I tried to contour down to see if it got better…it got worse. So back I went. I decided to scoot down on my backside as it wasn’t a very far drop. I wasn’t really worried about the distance, but more about dislodging big rocks around me on the way down. I did my best to use my ice axe too to assist, particularly if I slid at all. Here goes nothing! I slipped down rather clumsily to the creek bed. It was really loose in the rocks and I was not a fan! I took a big breath once I was on the creek bed and looked back at what I had just dropped down from. This is the only part of my entire hike that I really wasn’t feeling good about. Particularly since I realized that I really didn’t want to have to go back up that if I had to as the rock was so loose. I wasn’t happy. My drop-down point was in that sandy horizontal band in the middle. You can see my foot plunges right in the center. It’s hard to have the proper perspective with this 2D picture. Here's a video clip showing the situation I was in for better perspective. 2018-09-15 3MHHR7 Top Wash from Michael Irving on Vimeo. It was great…until I rounded the curve…and saw these crevasses. I thought about going through it…it probably would have been okay, but I’m not a fan of “probably”. I really didn’t want to risk slipping down into that mess. And I really didn’t want to go back up that mess of loose rocks. Ugh…I am not happy! I just stood there and thought about it for a minute. I decided to put my ice axe to use…boy was I glad to have it. 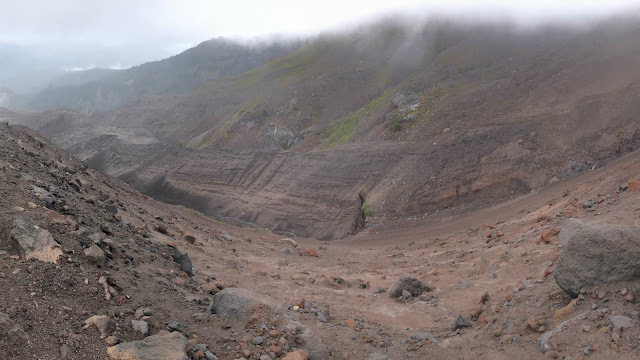 You can see the scree slope above the crevasses on the right side. 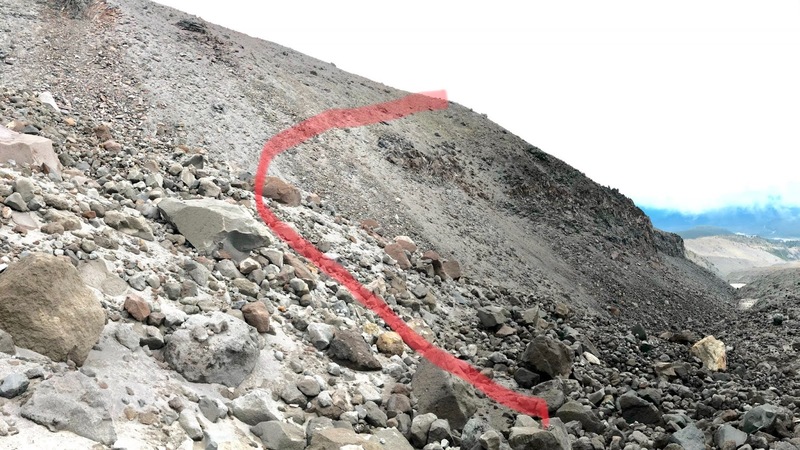 It’s cutoff on the right side of the picture, but the scree came down to me dry, around that darker brown, wet stuff. I took a step up on the scree and plunged my ice axe shaft easily into the scree, all the way to the head of the axe. I grabbed the adze on one side of the head with one hand, and the pick on the other side of the head with my other hand while facing up the slope. I side-stepped about a foot with each foot. 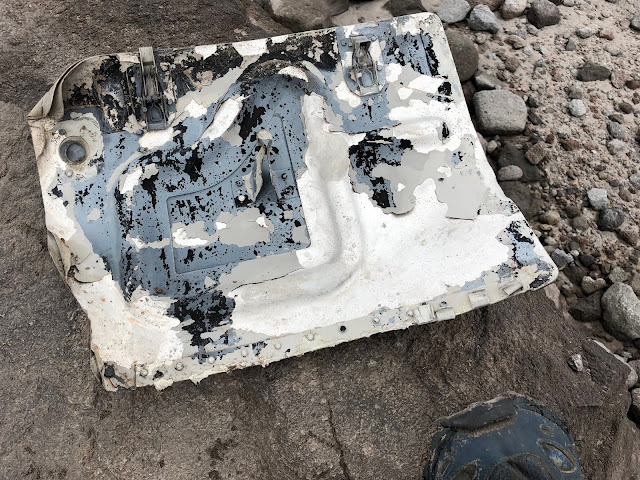 I lifted the axe out, brought it over about a foot, and plunged it back into the scree up to its head and repeated the process. I realized that if I pulled hard enough that I would be able to pull the axe free to the side without pulling the shaft out vertically. Fortunately, it grabbed just enough to provide stable balance as I shuffled side-to-side above the crevasses. it took me about ten minutes to get across the top and back down to the creek below the crevasses. Boy, that was hard work as I was breathing hard. I felt great to have that behind me, but I don’t ever want to do that again! I was a little disappointed that I was this close to the end with my first non-workable route. I hoped I would see something better ahead. The red arrowhead shows my starting point back behind me...you can see my steps across the top if you look closely. There was more ice overhang on both sides as I continued, but the creek bed was good. Then I finally got to the headwaters of the White River. I had run out of water a bit before, so I was glad to get my final, cool, water for the hike. This is where the White River water finally exited the ice. You can also see Crater Rock and the summit of Mt Hood in the background as the clouds lifted momentarily. Down the “river” I went (I think it’s safe to call it a creek here). Here is a video clip of the surrounding area for perspective. 2018-09-15 3MHHR8 Bottom Wash from Michael Irving on Vimeo. There were several side creeks that quickly joined the river from side ice caves. And more caves with creeks. It was amazing how quickly the river gained size with all the tributaries coming into it quickly. It wasn’t long until I reached my up-point. Here is the view up the creek from my up-point and the crest of the moraine that I had originally planned to descend. This is looking down the creek. As I took a video of this area, you can hear the realization in my voice that it appears that that moraine drops low enough to have perhaps the perfectly timed descent to the White River! That will definitely be my pending recommendation instead of where I came from. Hopefully it’s the missing link to be the perfect choice for this route. It looks like I could easily drop down off that, hike up-river about 100’ and I’d be in the perfect spot. I think there is a waterfall of some kind down there too, but it’s just below that drop-down point…definitely something else to investigate. 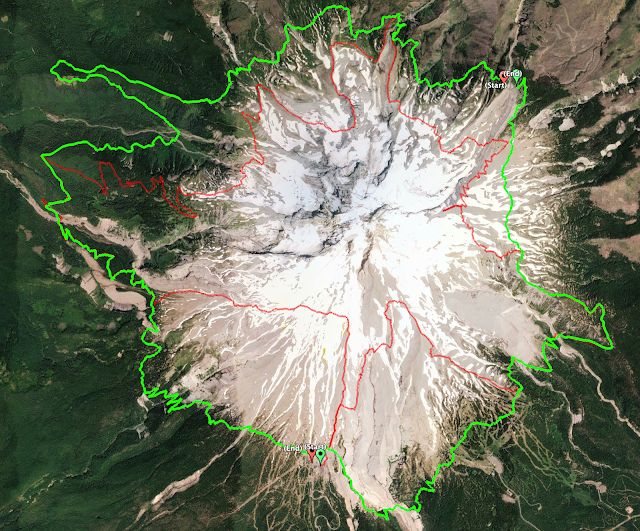 I have spent multiple hours on Google Earth, Cal Topo, and examining pictures, to find this up-point. I think it’s the only reasonable point to get up this moraine along its entire length. There is a nice creek that comes at an angle down the creek and completes its journey to White River down some steep rocks at the bottom. Fortunately, the constant water has eroded the sand and small rock away to leave some pretty solid rock in the creek. I hiked straight up the creek. It was a great way to start the ascent with solid footing (YMMV). 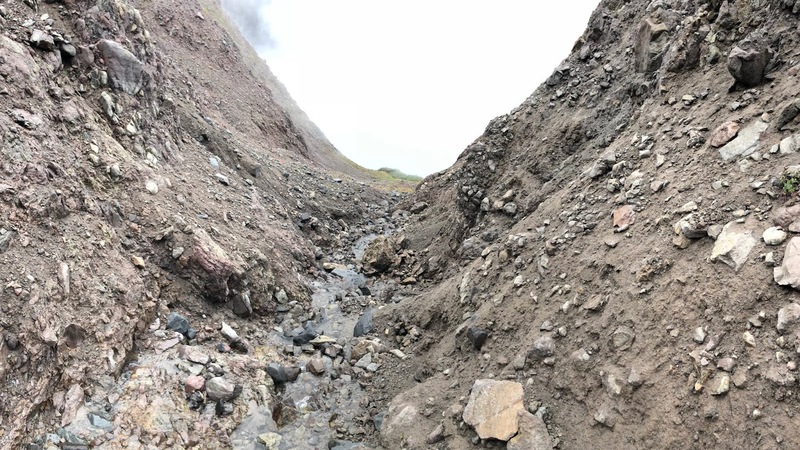 As I got out of the steeper, lower part of the canyon, the creek disappeared under consolidated sandy/rocky slope. Here is the view back to the White River. 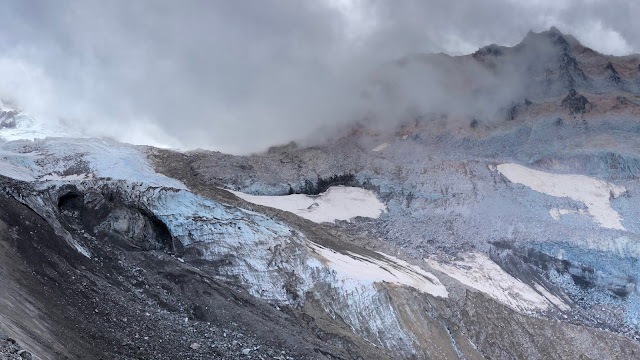 This shows another view of the nose of the moraine that should be my new ascent/descent path to the White River Glacier moraine crest and crossing. Earlier in the summer this wash has a snow chute that goes down it. It’s wide enough that I think the snow chute could still be skirted, but be aware of that if you go earlier in the summer. 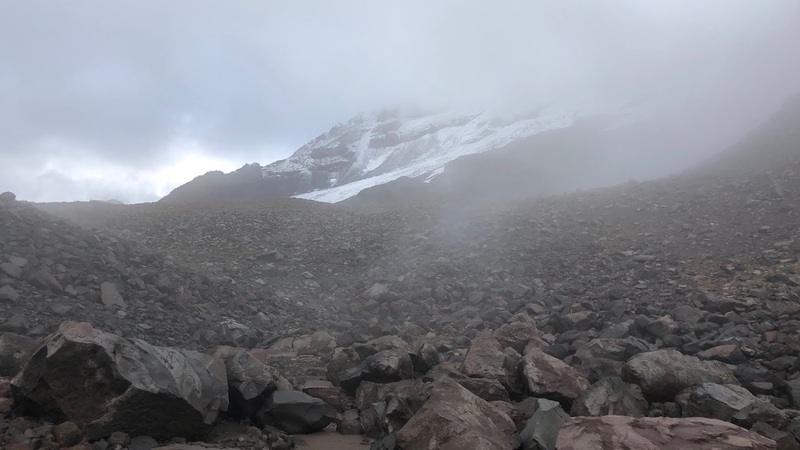 I used my ice axe (which I as now affectionately calling my “scree axe”) to get up the wash. It was not required, but it was a nice hand-hold as it was quite a steep ascent, not sketchy steep, but just below that. It took me a half-hour to get to the top, that’ll give you an idea how steep this 0.2 mile climb was. I popped out at the perfect location, just over and a bit lower than then Silcox Hut. I was now re-joined with the Mountaineers Route that I started the hike on and was home free! 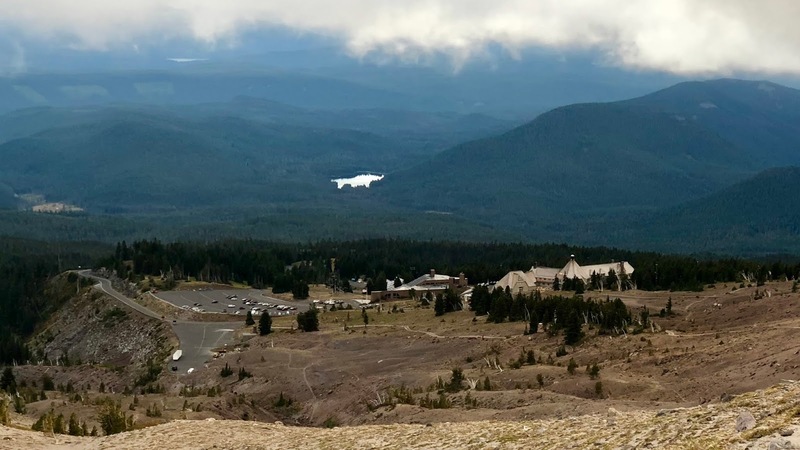 I could see Timberline Lodge clearly below me! I cruised down the use-trail to the Timberline Trail. I decided to come in on the Timberline Trail to the back side of the lodge as that iconic finish would be perfect for this endeavor. I had to get a picture next to the sign of my favorite trail. I dropped down to go in the back door to the finish line of my hike. In my typical fashion, I pretty much finished right at dusk at 7:30pm. I had hiked 14.6 miles for the day, and 40.9 miles for the hike with an average pace today of 1.1mph. I washed up in the bathroom and it felt so good. I just sat next to the fireplace on the main level and soaked in the accomplishment that I had just completed. Then…it was time to move. I left out the front door to make my way back to my car. What a special place this is. As I changed at my car and jumped in, guess what, it started to rain. I was so glad I had pushed to finish today! Of course I had to make my traditional stop on the way home. I hit the Subway in Welches for my foot-long club, loaded with veggies on flat bread with a giant Mountain Dew…ahh…that tasted good! I was the last customer of the day as I just beat the 9pm closing. 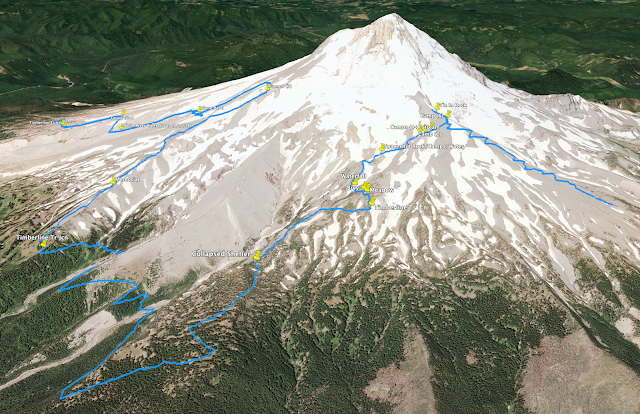 The Mt Hood High Route…COMPLETE! I was very pleased with my new route I found new routes off the top of Cooper Spur and up the ridge of Mt Hood Meadows. It was very cold and windy up high. 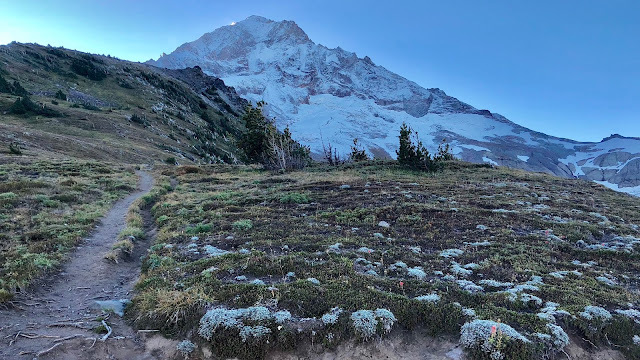 I wished I had chosen correctly coming down from the top into White River Glacier and also on the glacier moraine, but I do feel good that I think I identified some very appropriate paths for improvement in this area for next time. The route took me 36 hours and 25 minutes to complete over the course of 40.9 miles, with a pace of 1.1mph. It was 16,750 vertical feet. 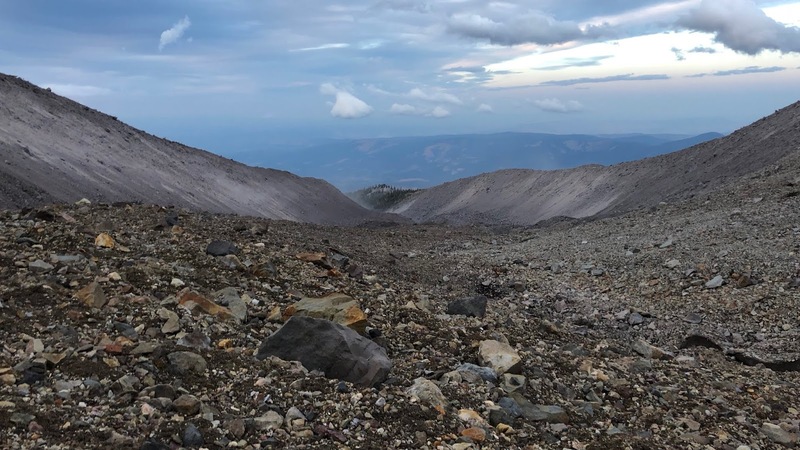 When I hiked the same loop on the Timberline Trail in one day it took me 17 hours and 41 minutes at a 2.3mph average pace and about 10,000 vertical feet. That was less than half the time. I’m excited to try my improvements and to do it in reverse next summer! I want to thank everyone who helped me complete this amazing route. 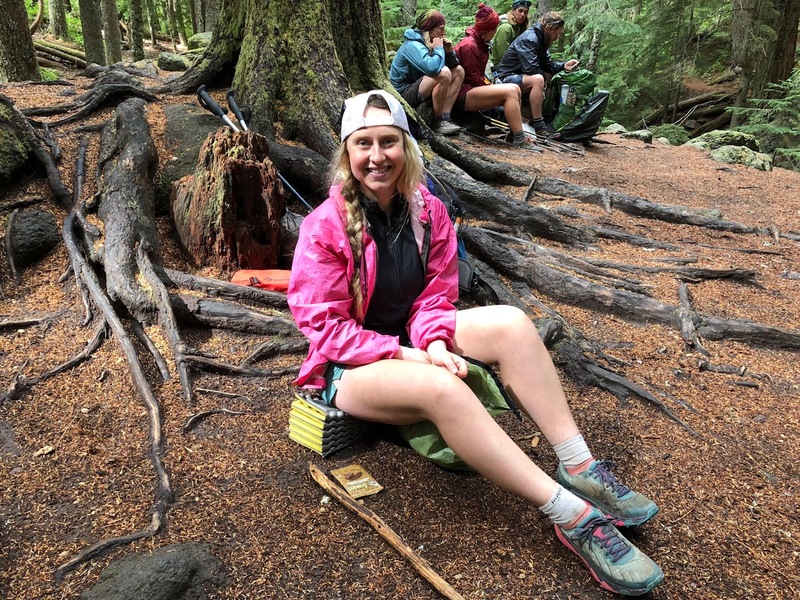 My daughters Paintbrush and Somethin' and her friend Bambi who hiked up the Mountaineers Route last year to the Hogsback that gave me a chance to scout White River Glacier and the path up to Timberline. Matt and his dog Archie, who I met on Yocum Ridge a couple years ago who gave me the confidence and accompanied me for my scouting hike across Sandy Glacier. 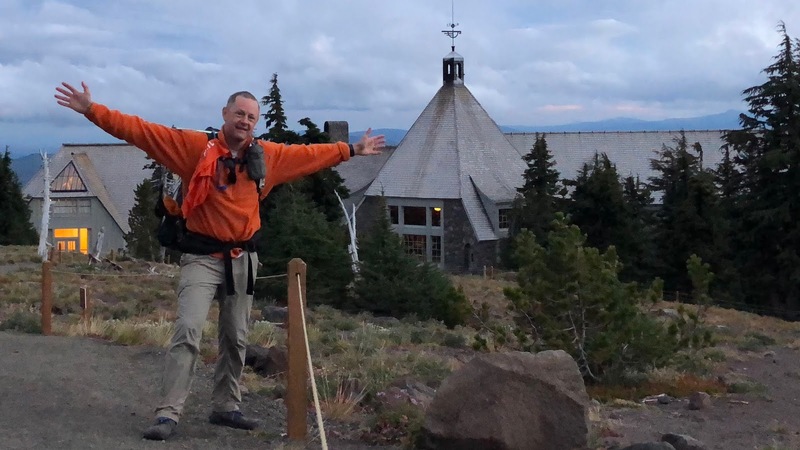 My good friend Daryl (aka Clark Kent) for my scouting hike last year on the north side of the mountain from McNeal Point to Cloud Cap Inn. 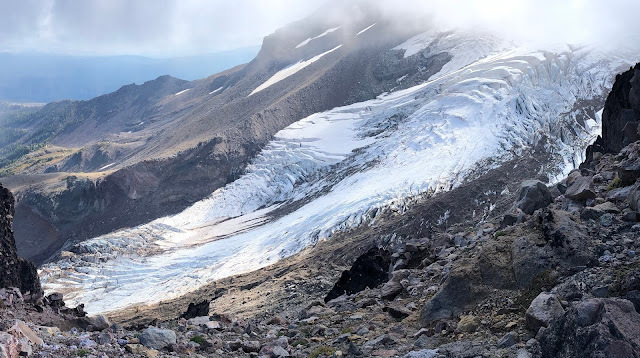 To "Retired Jerry" on OregonHikers.org for all his wisdom and knowledge of the mountain and most specifically, the Eliot Glacier crossing options. To several other "OregonHikers" who provided miscellaneous input on my questions about possible routes over the last few years. My dad Pilot, our great friend Magellen and their friend Craig for helping Daryl and I shuttle from Top Spur to Cloud Cap on that north-side hike last year, and for waiting for me even though I was 4-5 hours later than I though I'd be. My daughter Paintbrush two years ago on my scouting hike in the Cooper Spur area. My friend Daryl again for scouting the Heather/Clark/edge of White River Glacier last summer and bearing with me as I we went up Clark and then waiting for me to go back down the Hinterlands and back up Heather, so that I could scout all three on the same trip. 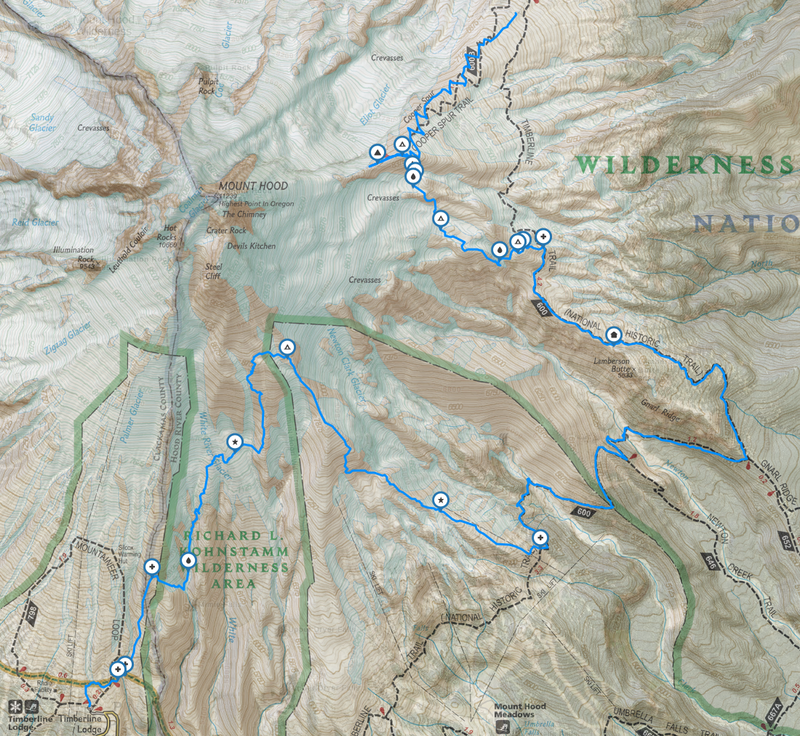 To the makers of Cal Topo, GoogleEarth, the Cooper Spur stone shelter and Leki trekking poles. To my wife for putting up with my crazy schedules, pre-dawn starts, and usually being later than I expect. Finding an awesome new segment between the top of Cooper Spur and Gnarl Ridge & finishing the inaugural Mt Hood High Route! Breaking my broken trekking pole again! And using my ice axe to get over the crevasses in White River Glacier and realizing there was a better route I could have taken...my originally planned one! Last edited by mjirving on October 6th, 2018, 7:30 am, edited 1 time in total. I really love getting high up on the mountain, the stunted plants and so forth. I've done maybe 1/4 of your high route over the years. Nice pics. Go directly from Paradise to Yocum. Cross below Coe glacier to stay above Timberline trail - I've been to right where you got and it seemed too steep and loose to continue. 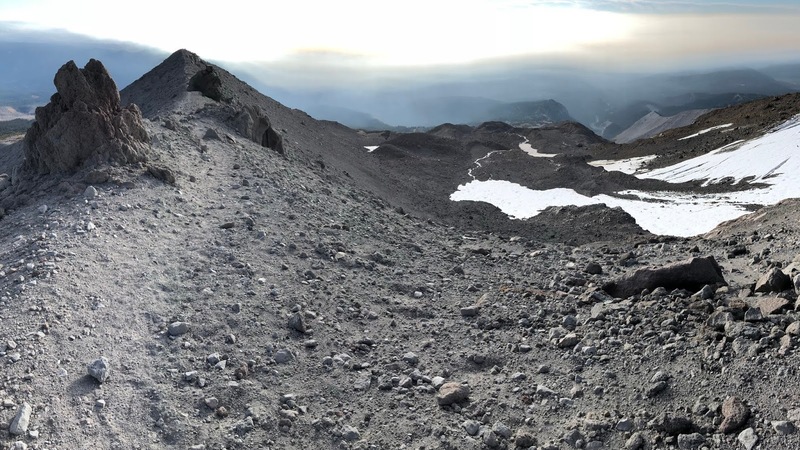 People have posted reports going from Cooper Spur directly to above Mount Hood Meadows, like at 8400 feet or so. Good project. Nice to have room for improvement so you can do it again. This was the first time I've looked forward to a TR I knew was coming. But how will I find time to read all that?! What took longer, the hike or the writeup? I share your love of Barrett Spur, one of the most amazing places on an amazing mountain. Not to diminish your impressive accomplishment, but I thought it would be entirely offtrail. All the same, well done, I admit it's more than I've been willing to tackle. So what's next? Got a crazy scheme cooked up for your next exhibition of lunacy? Dammit, Jerry swooped in and took my "first"
I too wonder if you plan on a refined do-over. Something that's been on my mind is standing on every glacier along the way, but that really ups the ante. Yeah, I'd love to get some intel on some of these options. They all look pretty gnarly. 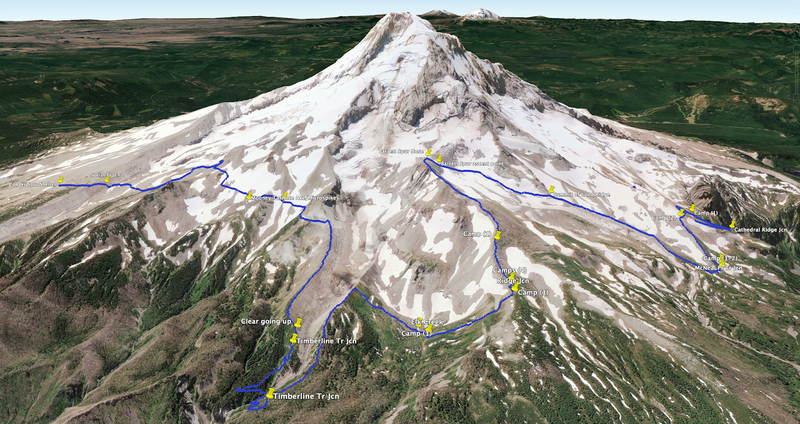 Cooper Spur to above Mt Hood Meadows might have the most promise?? It'd be interesting to do something earlier in the season with more snow maybe to provide easier purchase? Although I really want to stay away from crampons so it might be too exposed for micro-spikes. standing on every glacier along the way, but that really ups the ante. I touched Palmer, Zigzag, Sandy, Ladd, Langille, Eliot, Newton Clark and White River. It would be pretty easy to incorporate Coalman, Glisan and at least touch Coe where it joins Ladd. Reid would be a challenge to get to unless you could touch it way up above Illumination Rock on the way down from Coalman. I might have to think about that more on the next time around. It would be cool to incorporate Illumination Rock as a feature into the route anyway and it'd be really cool to loop around the backside of Crater Rock if that was generally safe?? Yeah...I'd love it to be, just couldn't figure out how to do it safely. I'm all ears for ideas though, particularly ones with first hand info. Nothing too crazy. I'd still like to do Three Sisters loop in a day maybe and also Diamond Peak loop with summit included (but not in a day). And I've still got 1/2 of the Pacific Crest Trail to complete. So many hikes...so little time! Spectacular trip and write-up! 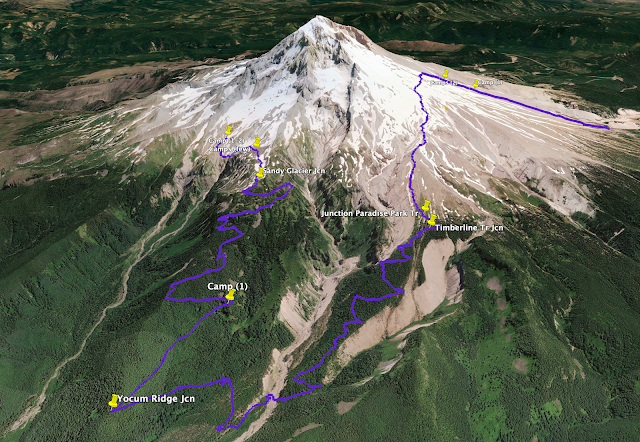 Love the high route and Timberline Trail superimposed on the map. I agree the best shortcut might be Cooper Spur to above Meadows, staying higher between 8k & 9k. 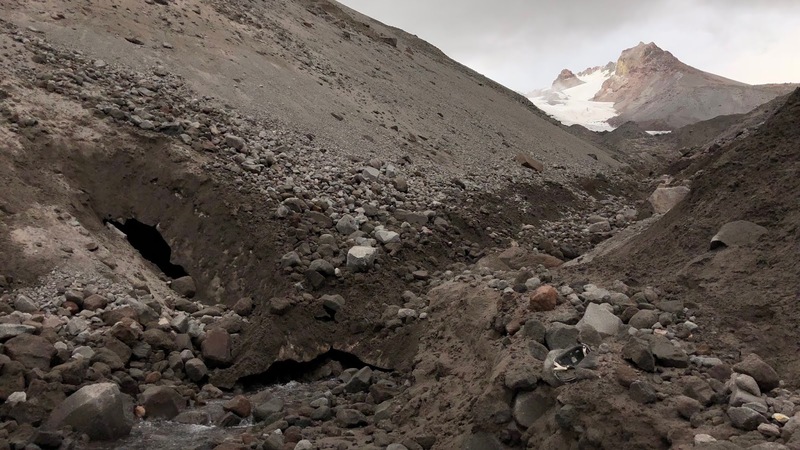 I haven't done it and agree it looks sketchy, but I've seen some trip reports with only ice axe and hiking crampons, I think. If I find them again I will share. By hiking crampons I mean like the K-10 or KTS or similar, about 1-inch spikes but for hiking shoes. I've looked at options to go from Paradise to Yocum, but can't see how to ascend Yocum. However topo maps probably just don't have enough detail and it will take scouting missions to find any possible routes. Thanks for the info Schrauf! That does look like an interesting option to go up Cathedral and over to Gladd (I'm going to have to adopt that name now...perfect). I'll have to scout that out next summer. Doesn't matter if it takes longer...it's all about staying high up! The longer the better right?! It does seem that there might be a way from Paradise to Yocum, but I agree, it will take some on-site exploration. Another good excuse to go up there. Good stuff! Be sure to link to any other reports you find. I'll look on Gaia too. Holy Toledo, what a report! If you tried to publish that as a book, it might get turned down for having too much content. I'm gonna have to come back to this one a bit at a time. Incredible. Thanks for sharing.